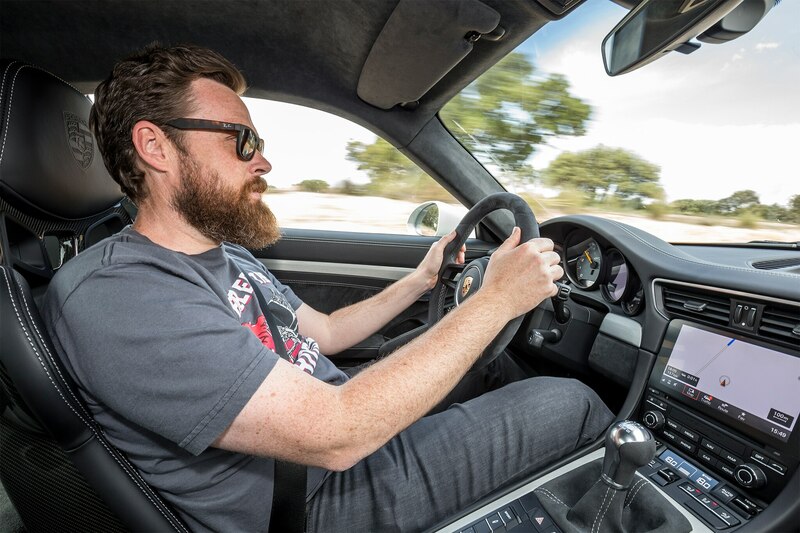 GRANADA, Spain — It turns out I’m a total prick. 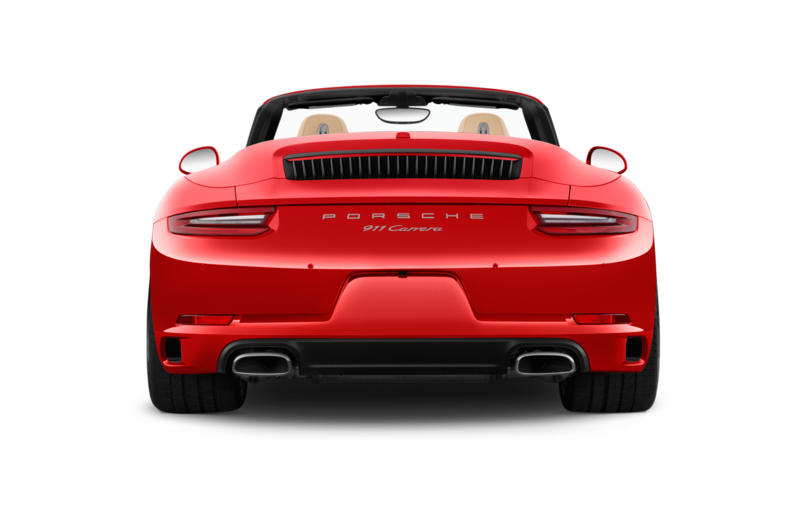 I’d long had my own suspicions. 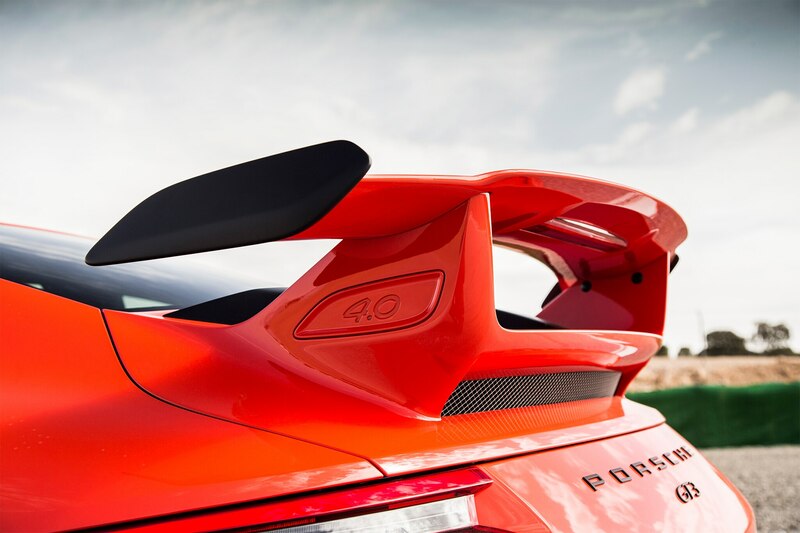 More than a few colleagues and acquaintances have given me their explicit thoughts on the matter. 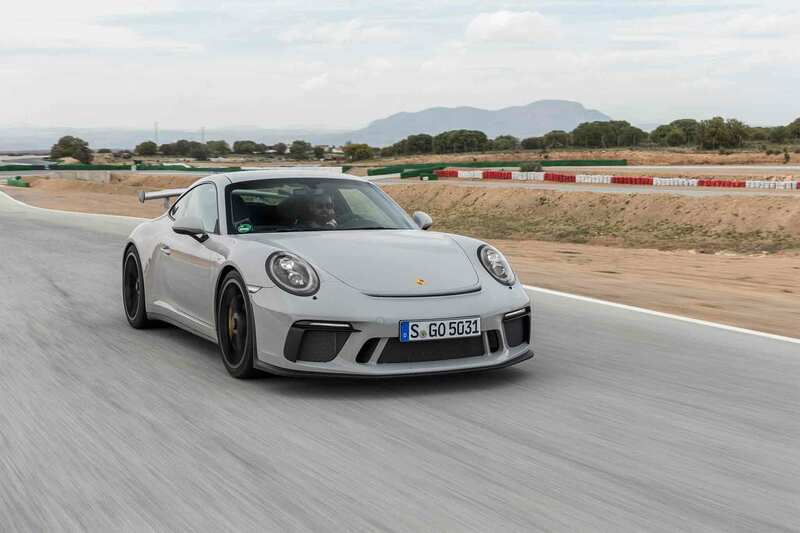 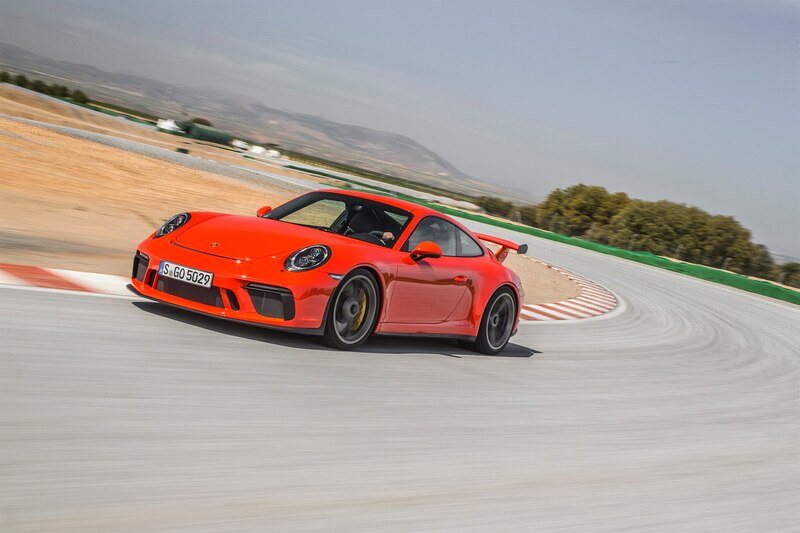 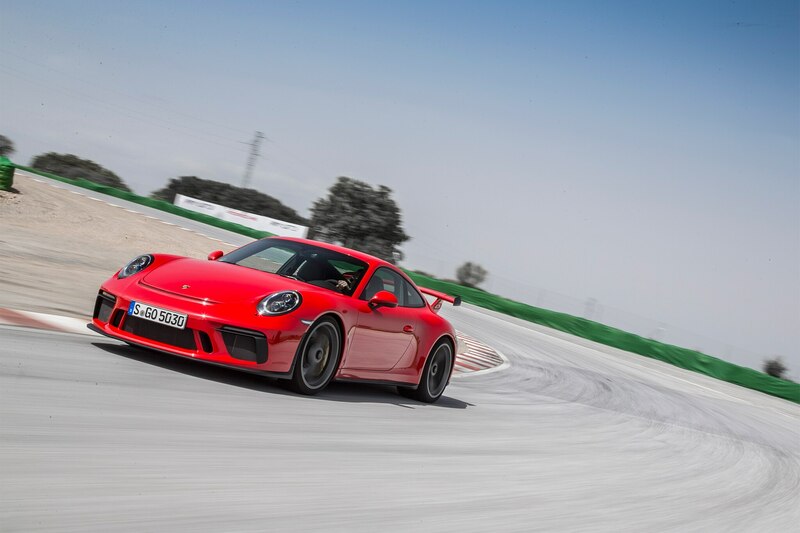 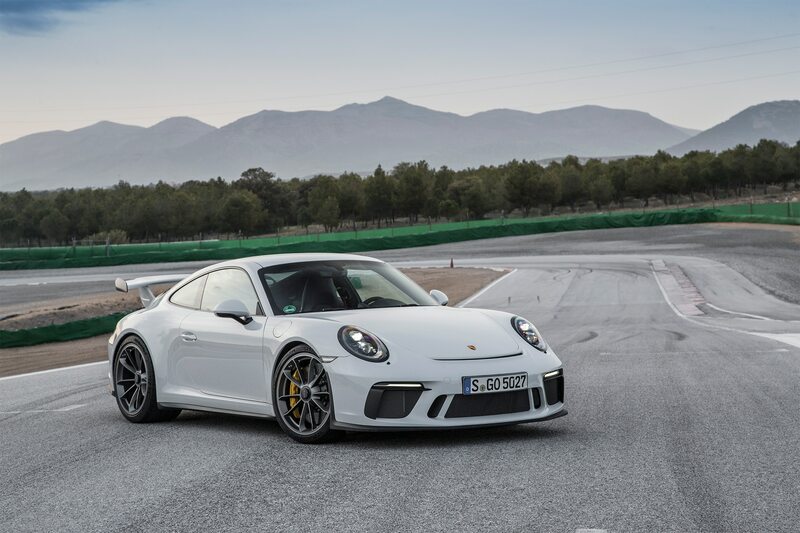 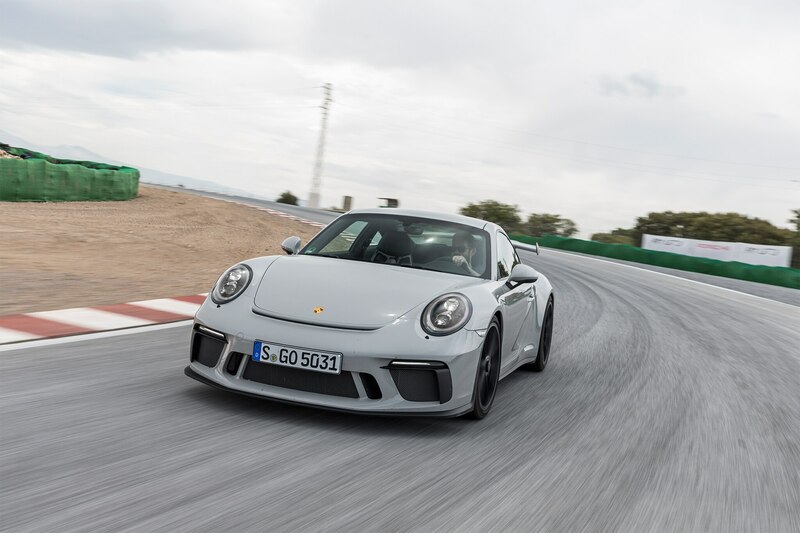 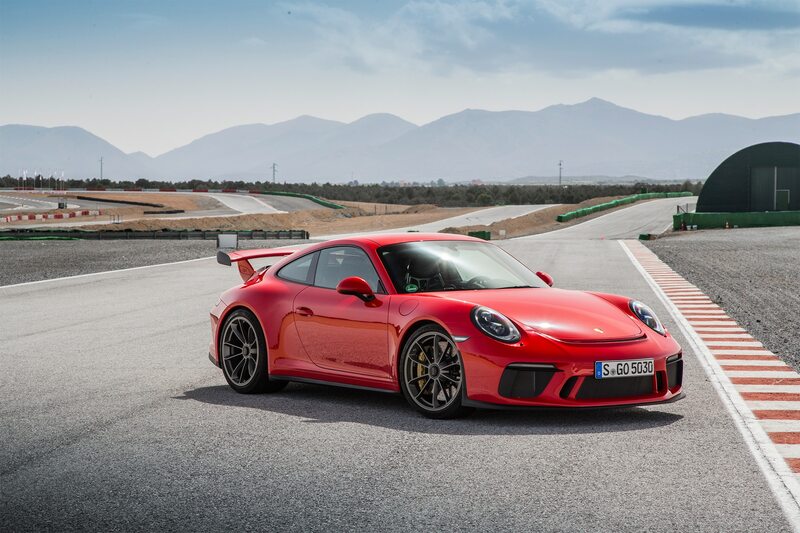 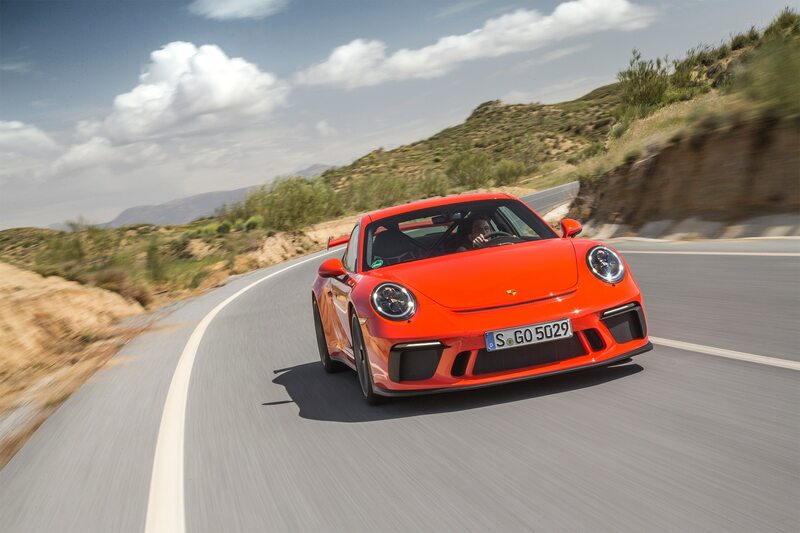 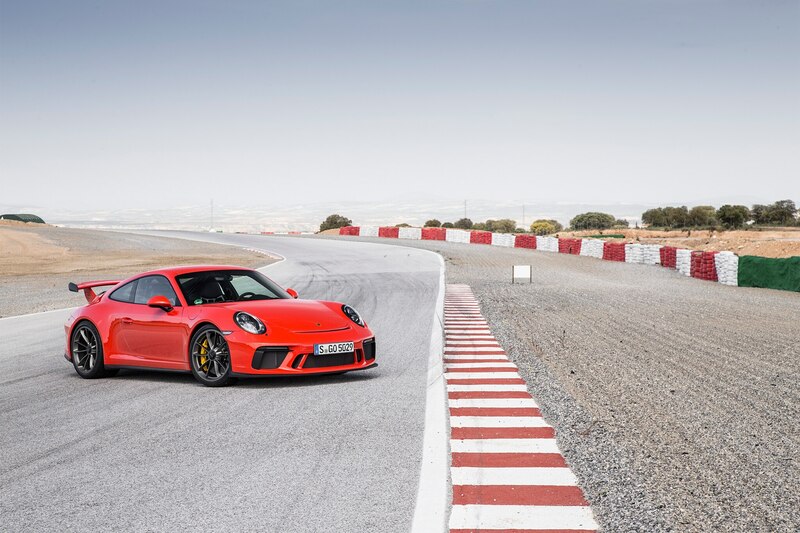 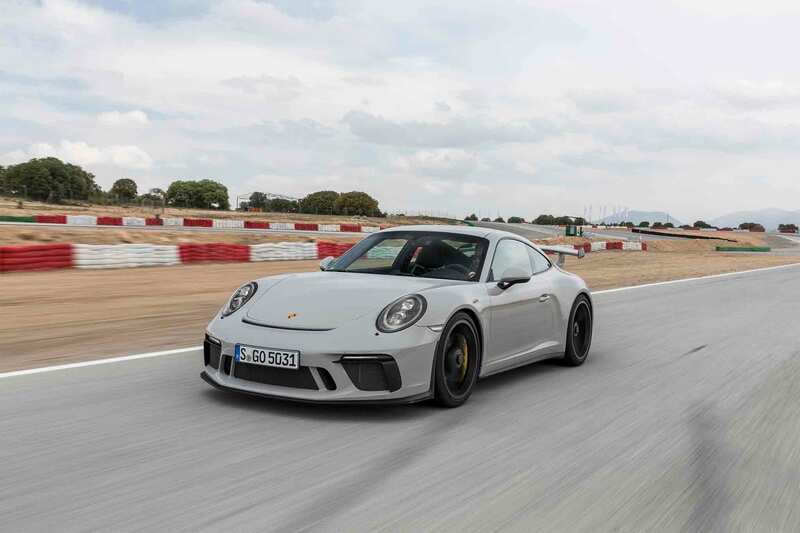 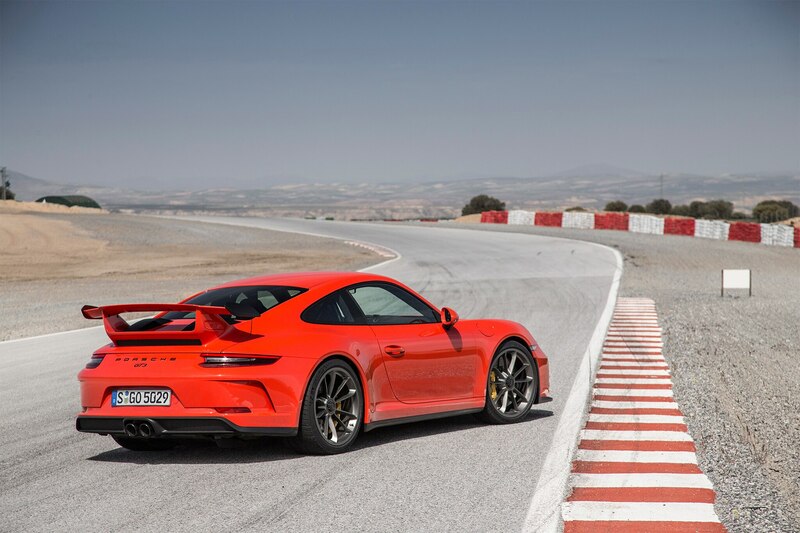 But it took a trip to Circuito Guadix in Granada, Spain, and a day on the track with rally legend Walter Röhrl and the new 2018 Porsche 911 GT3 to confirm my status. 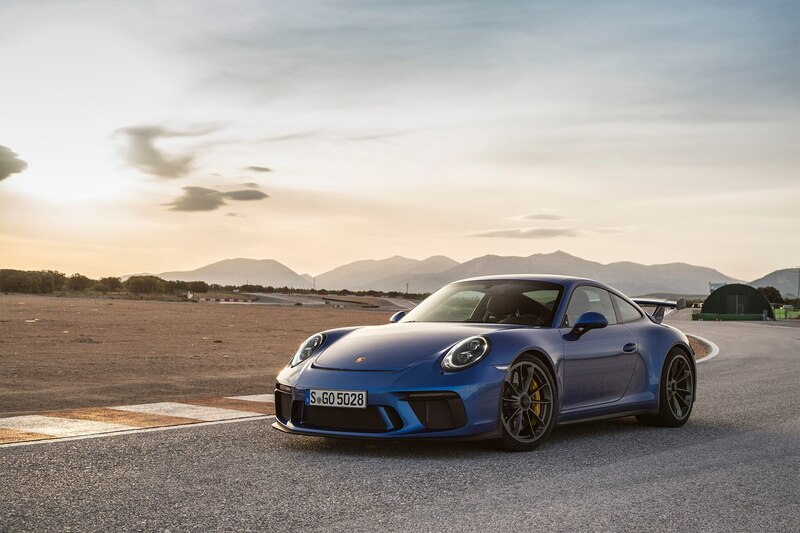 Built by the GT team at Porsche, the newest version of the 911 GT3 is not all that different from the last one, until you look a bit deeper. 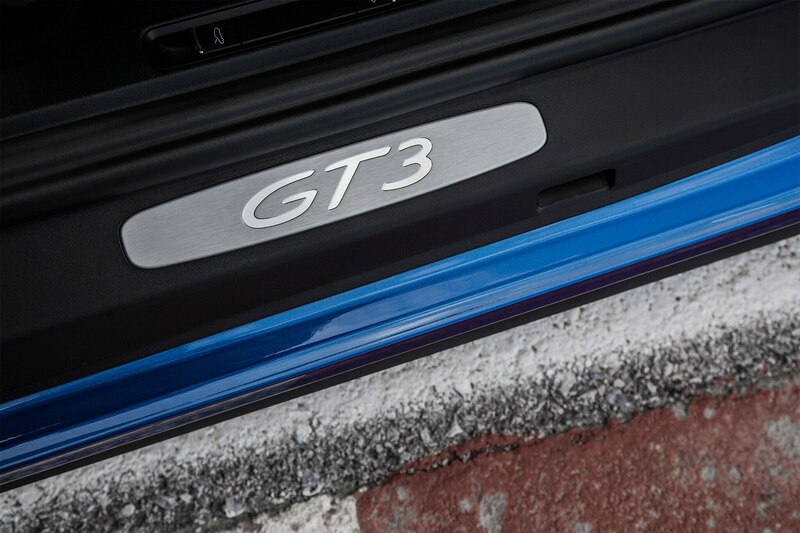 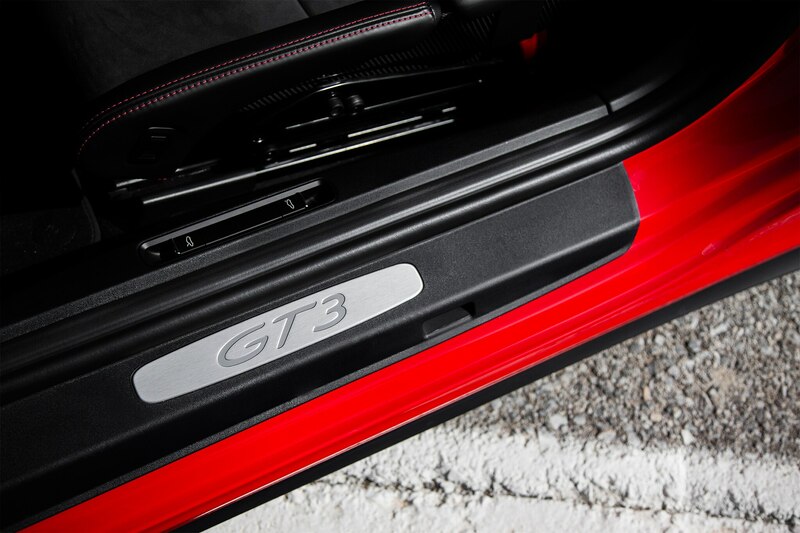 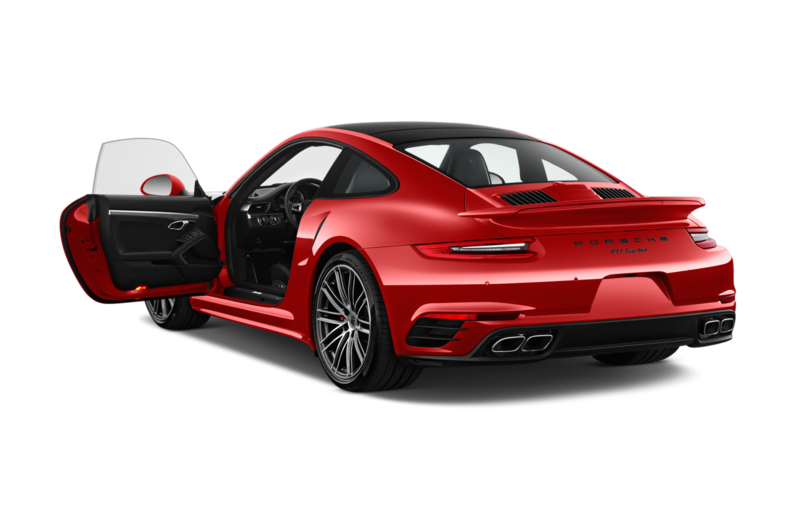 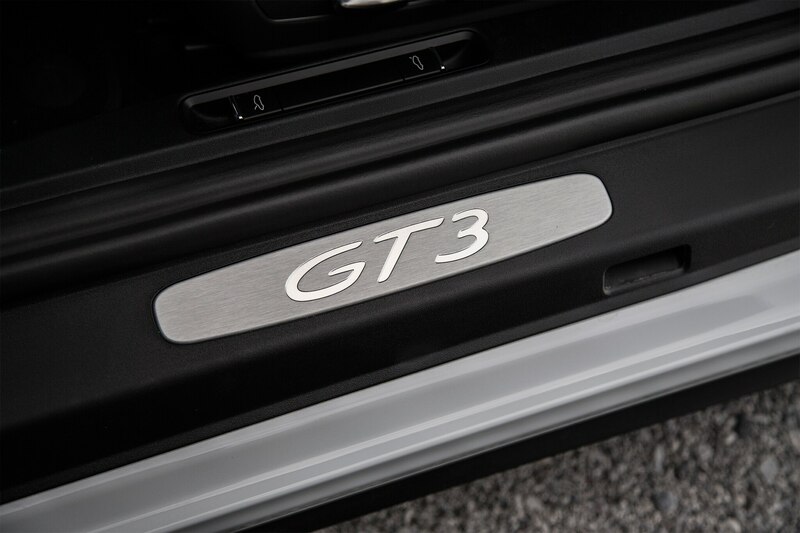 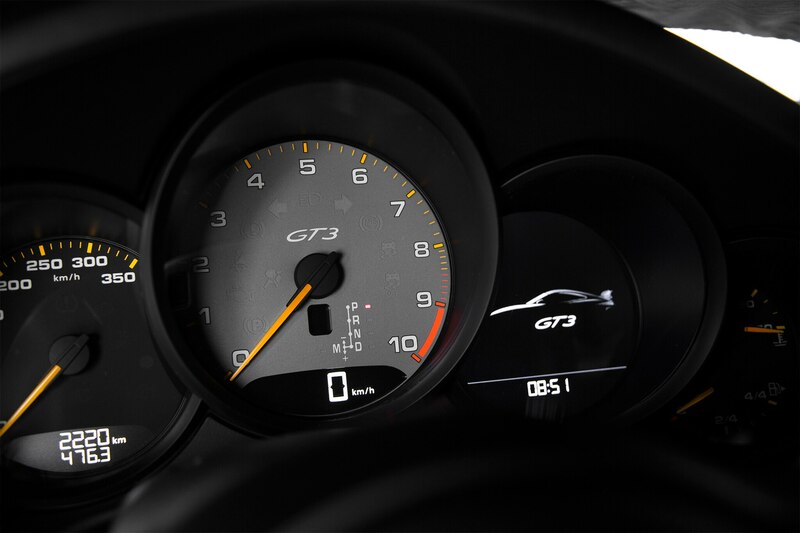 The refinements, improvements, and upgrades to the newest GT3 add up to a radically different vehicle. 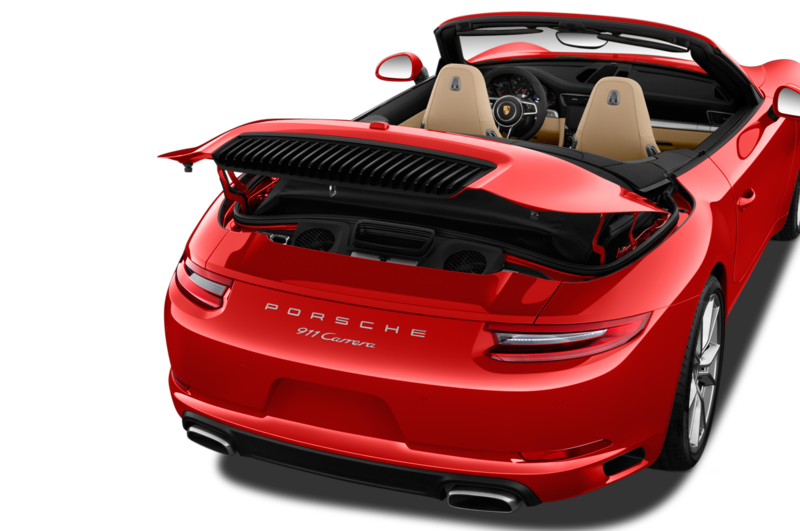 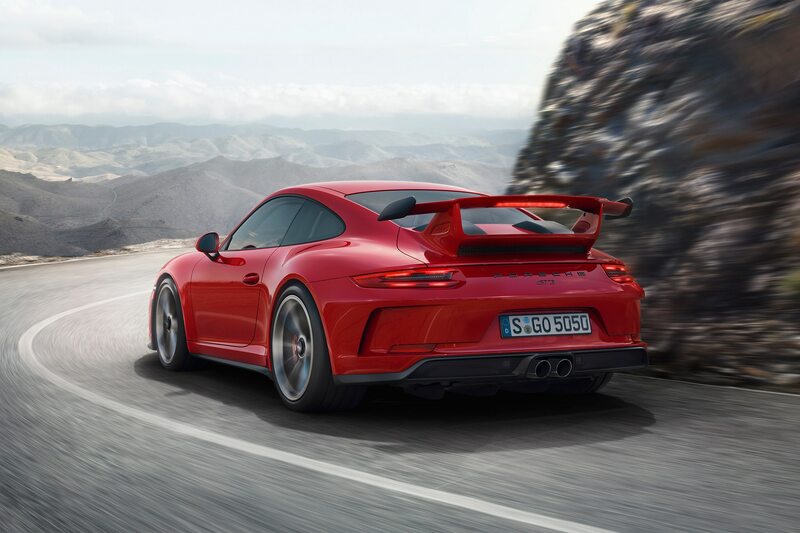 It features more downforce thanks to underbody work and a revised wing and more power thanks to a heavily redesigned 500-horsepower, 4.0-liter flat-six engine. 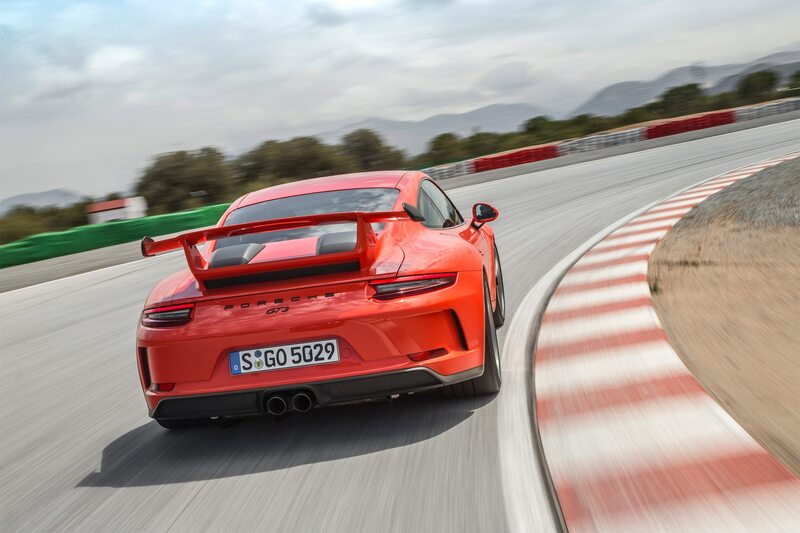 These changes, most importantly, add up to a car that is not just fun to drive but addictive. 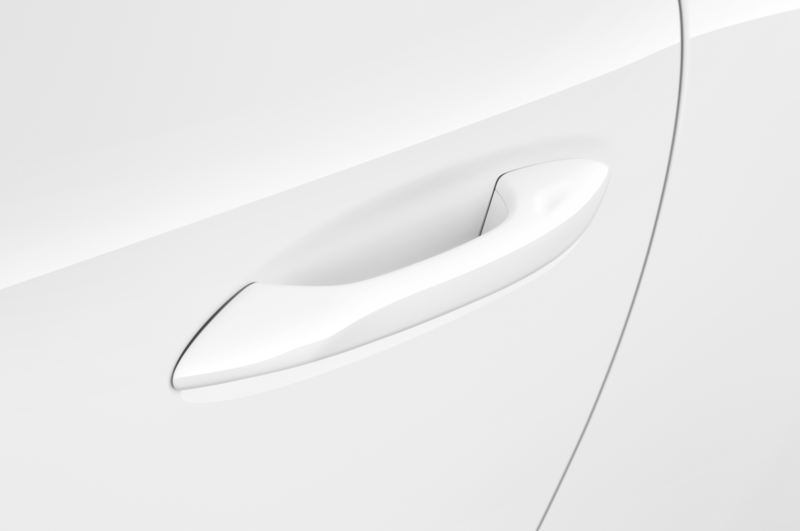 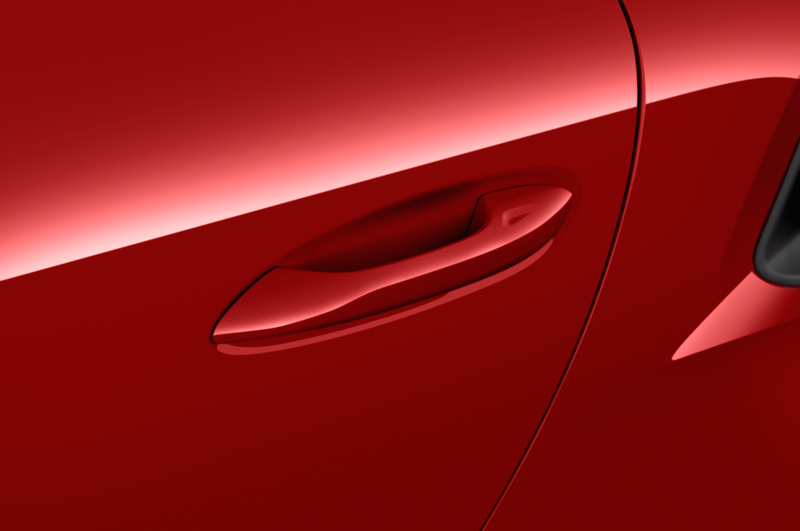 This is a car that makes you find the longest, curviest route between two points, not the shortest. 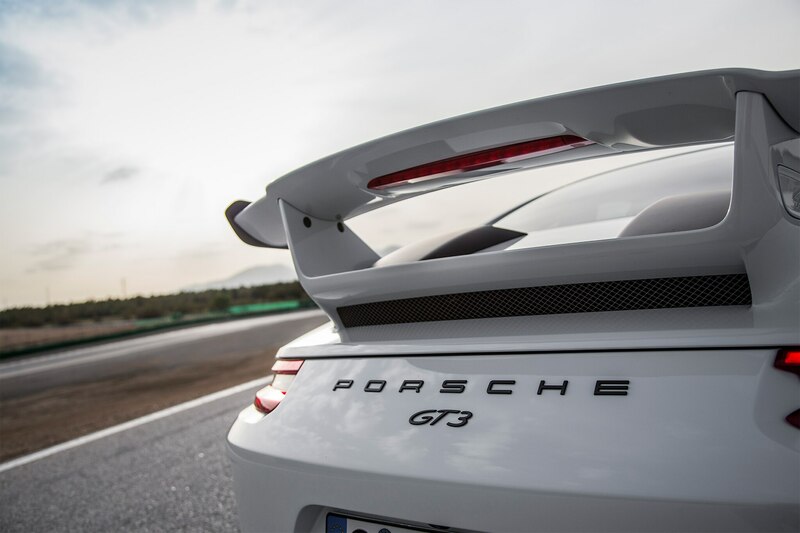 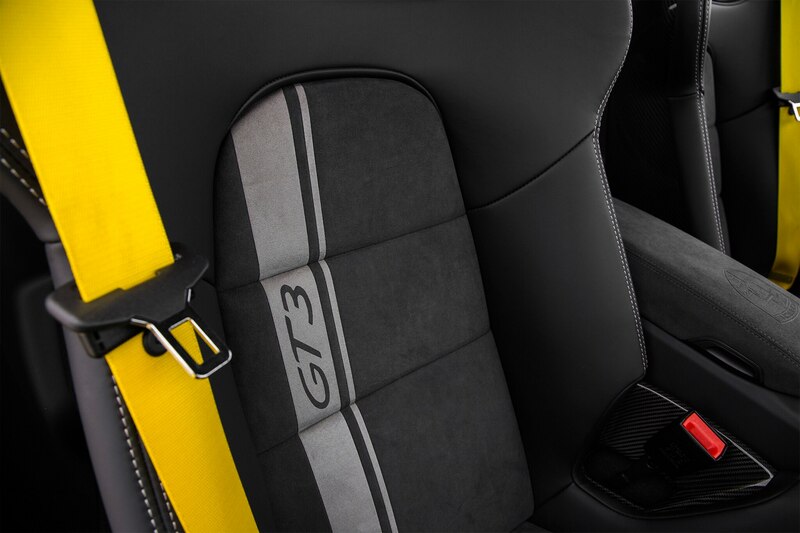 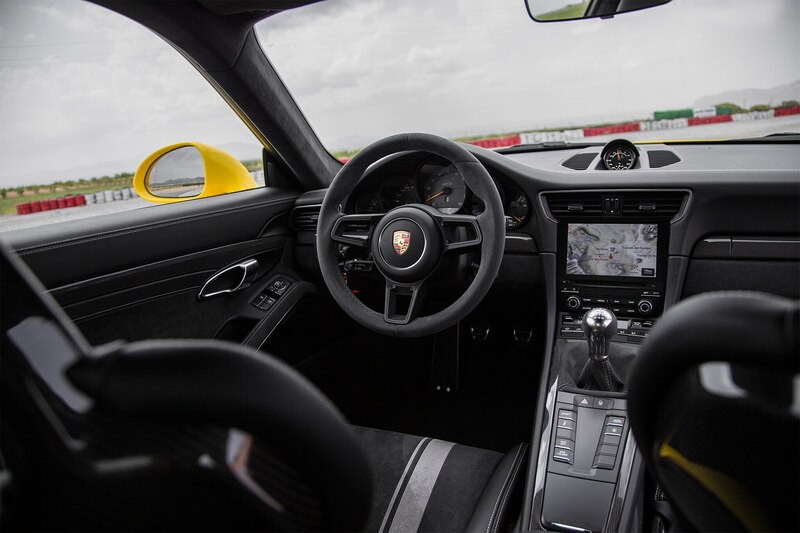 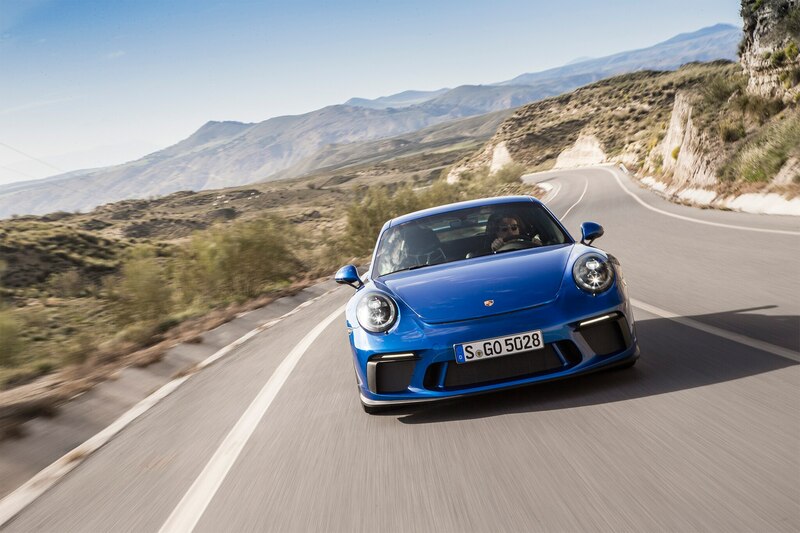 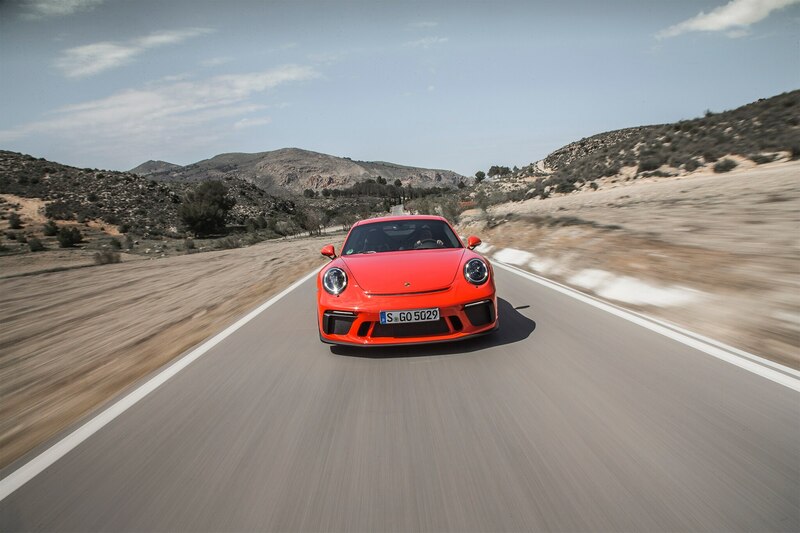 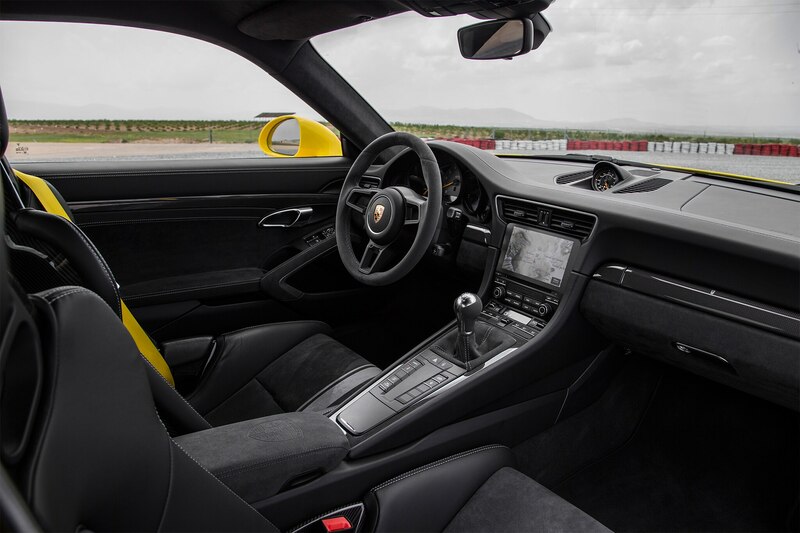 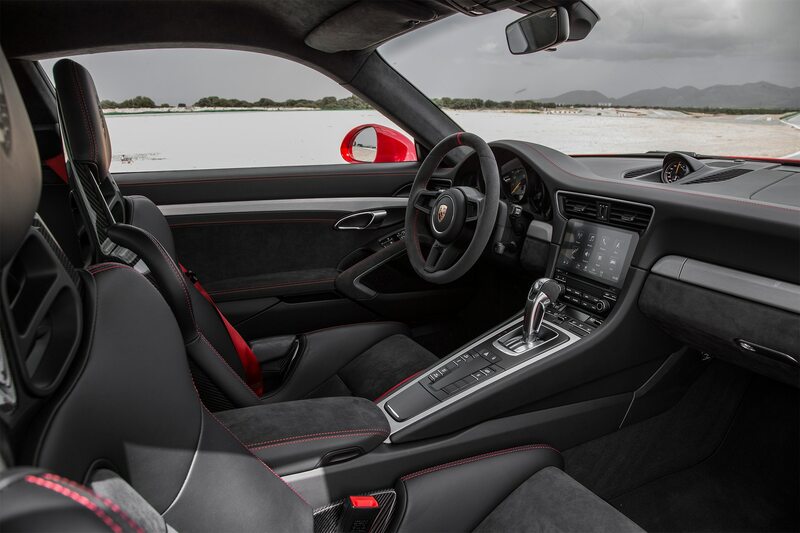 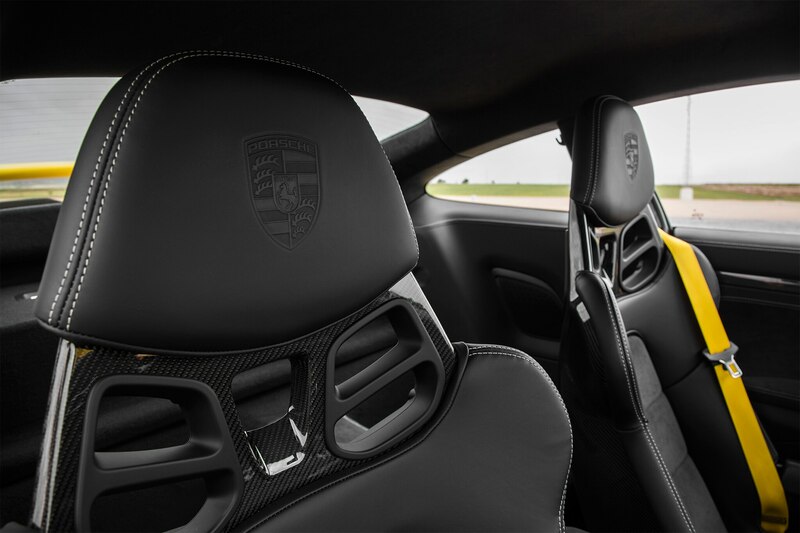 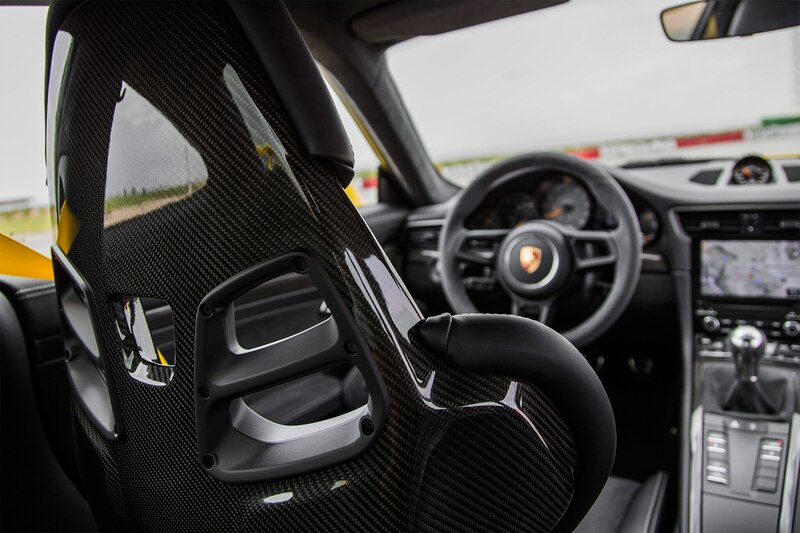 From the moment you take off in the new GT3, the experience is revelatory. 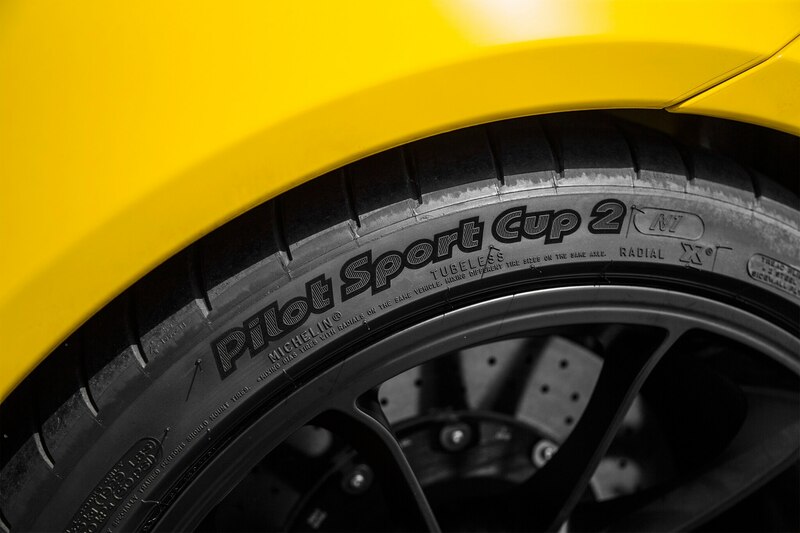 The first thing to grip you is the steering, which is neither too heavy nor too light, communicating the contact patch’s level of torture with ample if not quite exquisite detail. 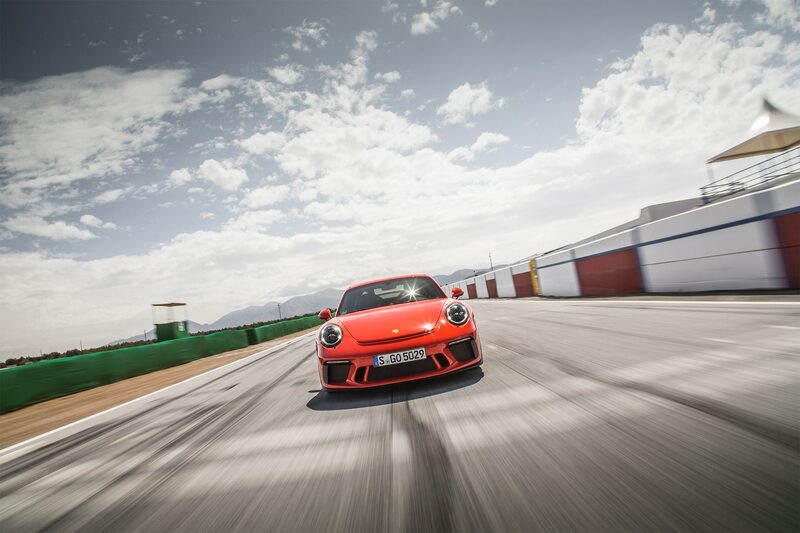 For electric power steering, it’s amazing — so good, in fact, that the biggest addition to the new 911 GT3 comes second: the manual transmission. 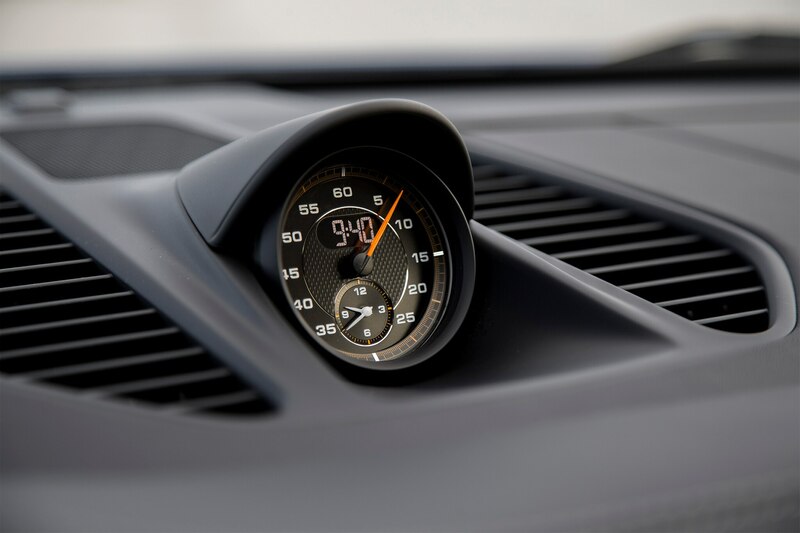 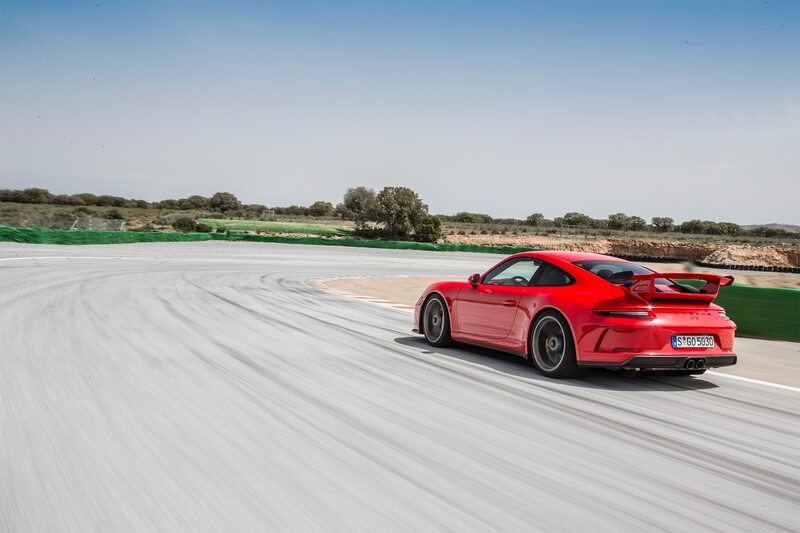 Rather than the seven-speed stick found in other three-pedal 911s, the manual transmission in the latest GT3 is a six-speed, with only sixth being an overdrive gear and even then only just so at a ratio of 0.88. 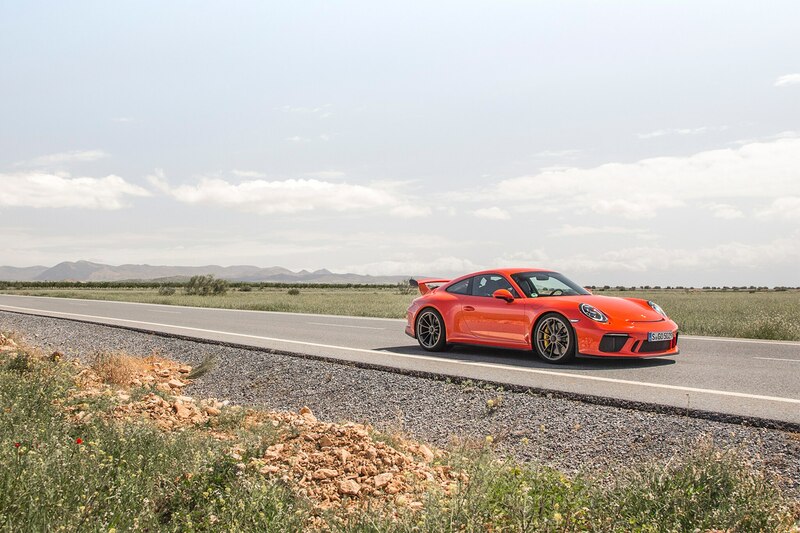 The closely spaced gears and 9,000-rpm redline make the ’box a perfect companion for a tight back road, with all but the tightest twisties and fastest sweeping corners handled easily in third gear. 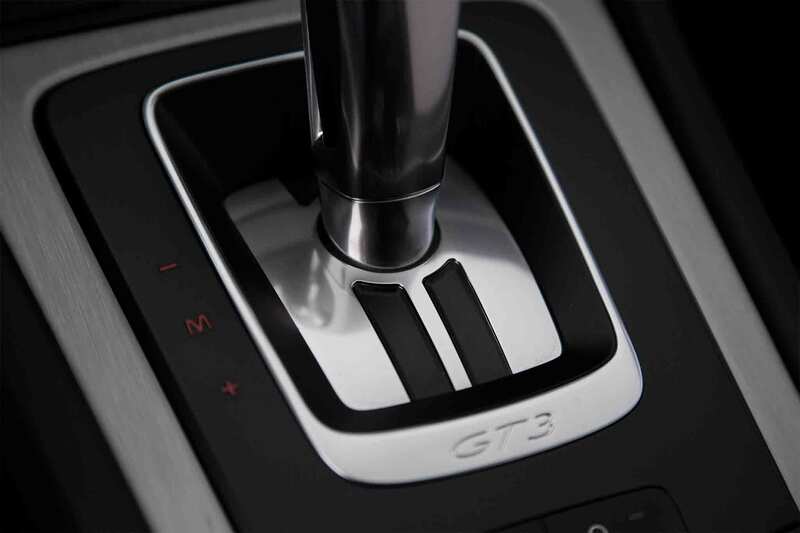 Not that you’ll mind shifting gears — the cable-actuated shifter has a shorter throw, metal bushings, and a unique linkage at the gearbox end, all of which work together to tighten up shift feel. 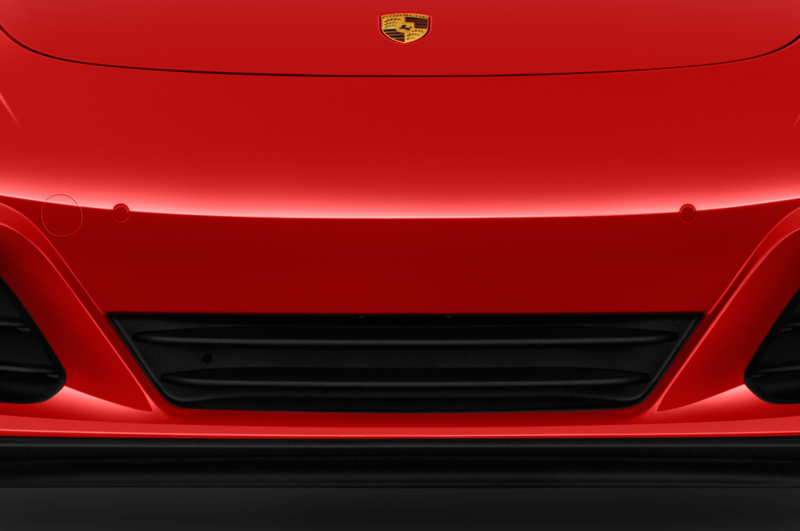 It works amazingly. 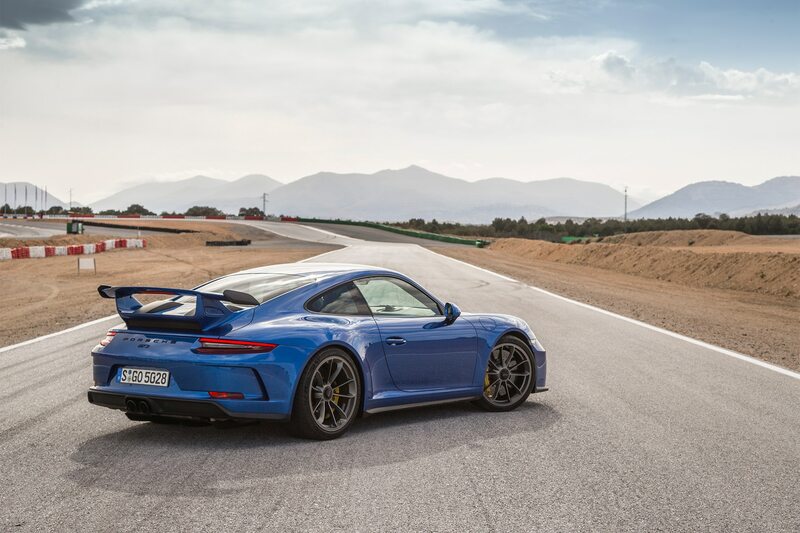 Not once did I have to struggle to find a gear or did I miss a shift, whether on the road or on the track at Circuito Guadix. 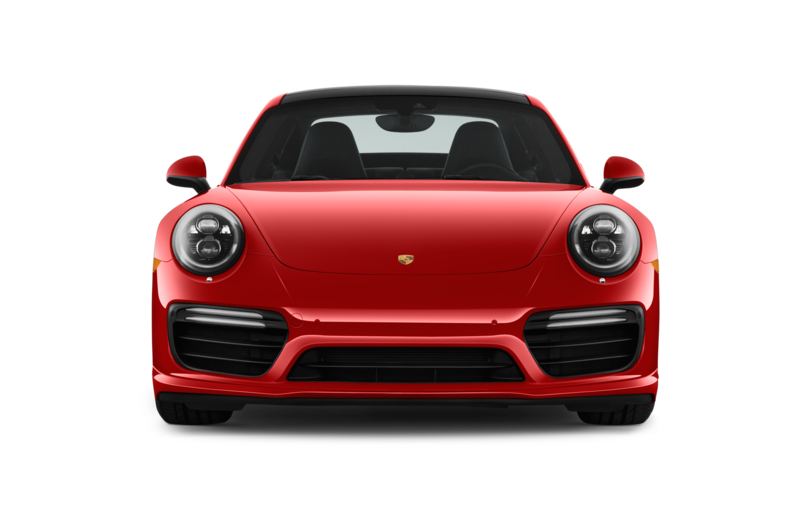 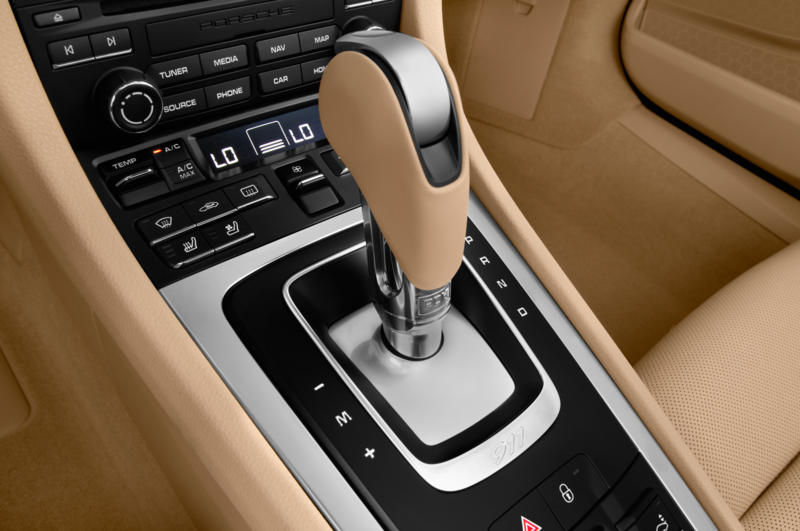 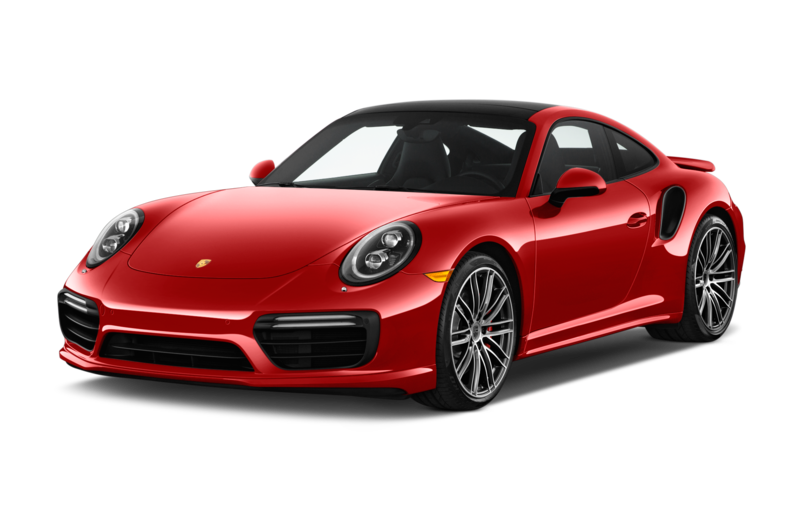 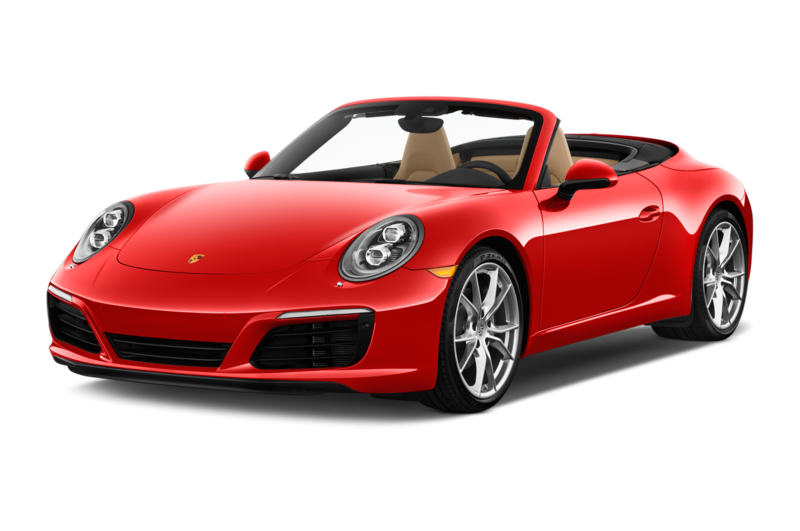 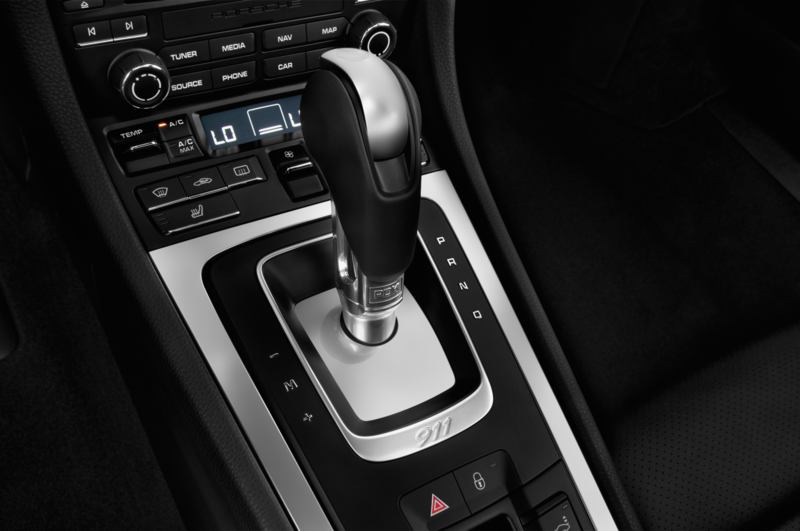 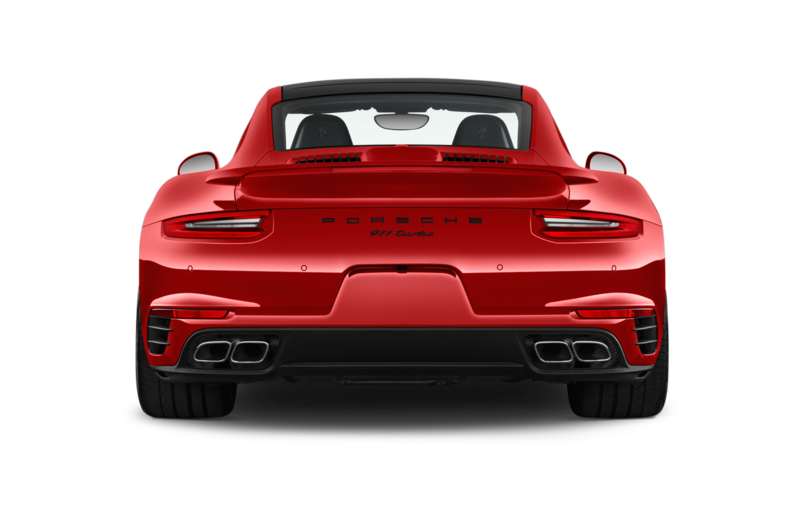 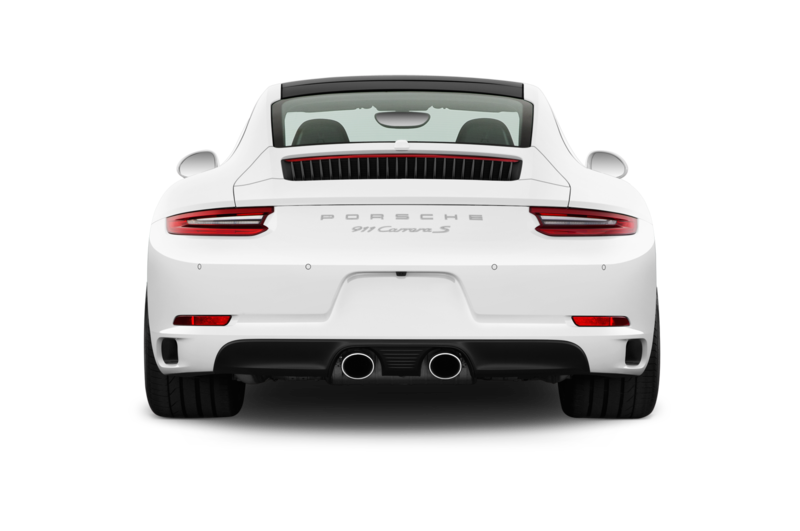 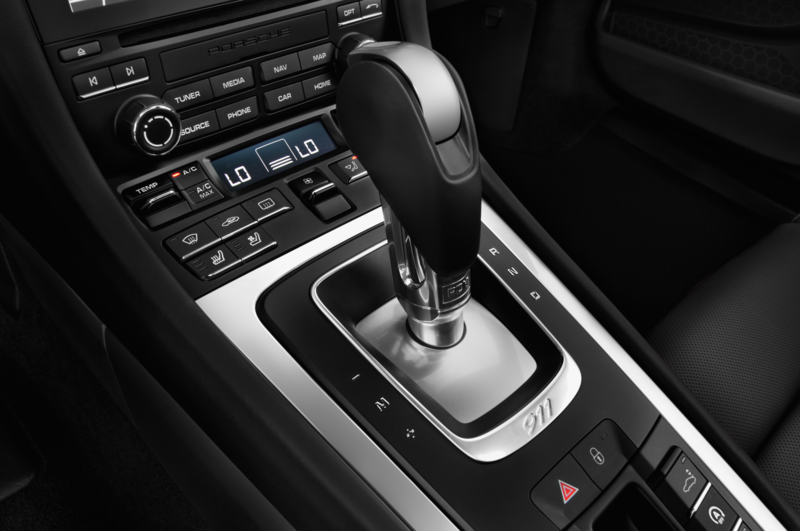 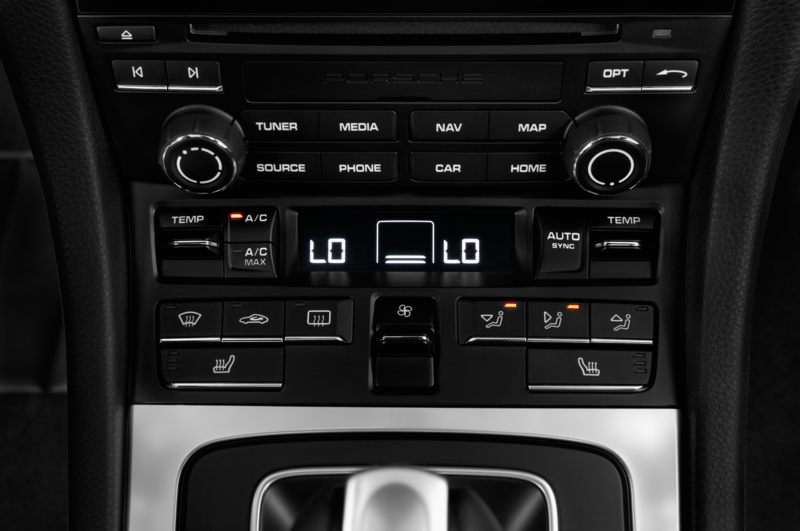 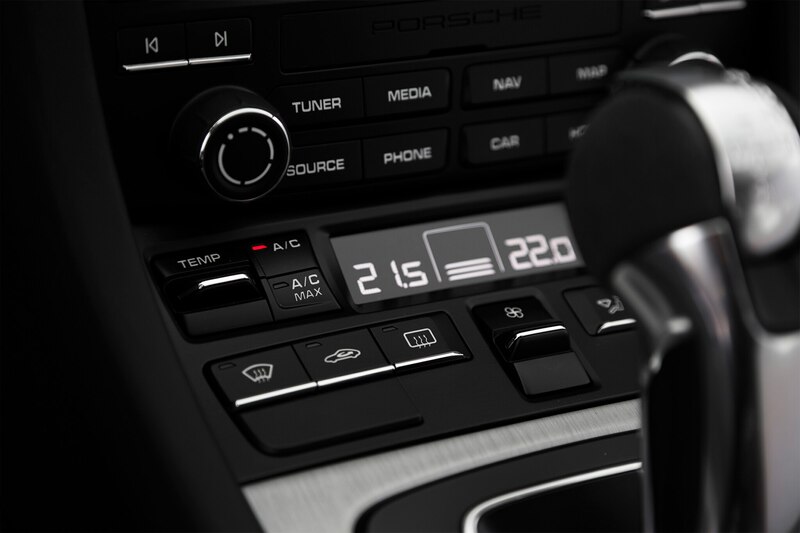 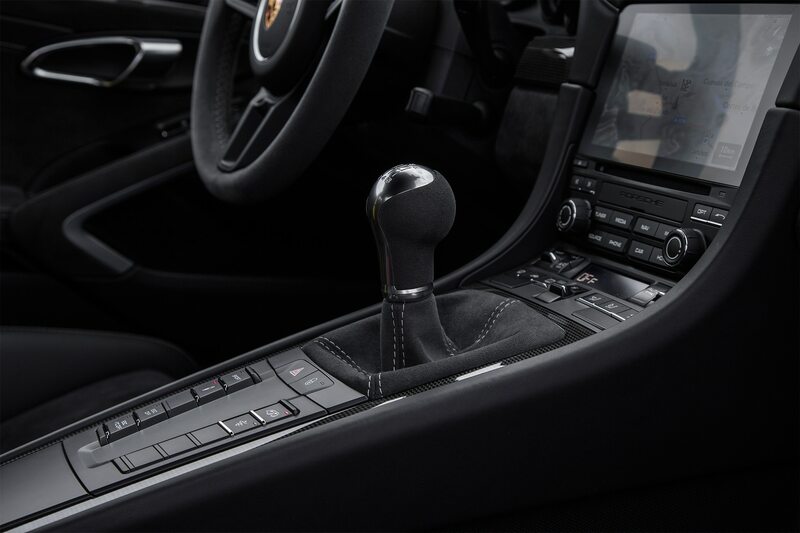 For the weight-conscious, the manual transmission also saves about 30 pounds compared to the PDK. 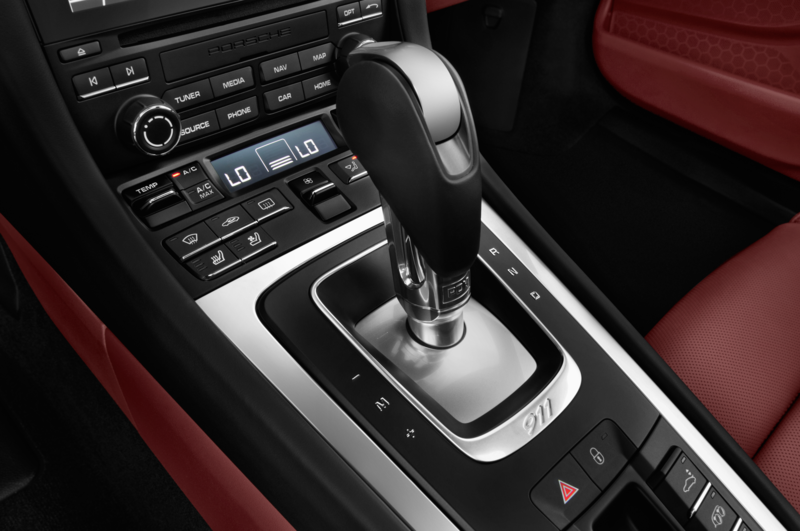 The pedal spacing, likewise, is just about perfect. 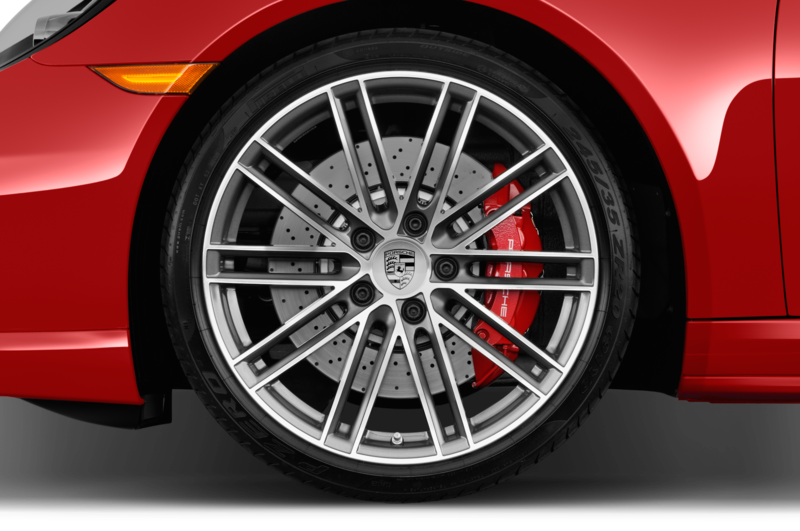 Unlike many street-going track weapons, the brake pedal isn’t compromised by softness for street comfort at the cost of at-the-limit feel. 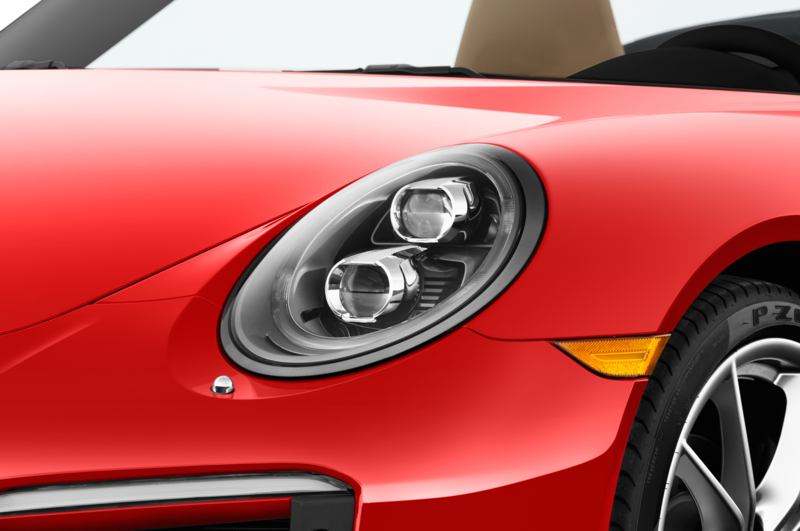 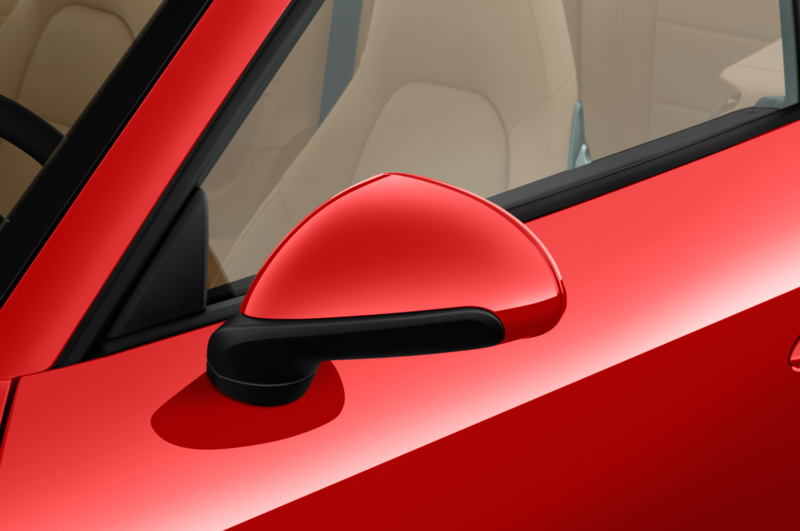 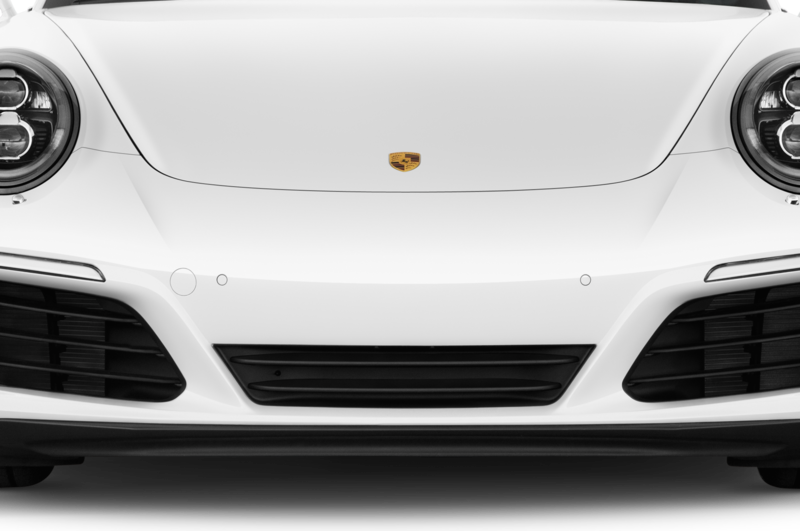 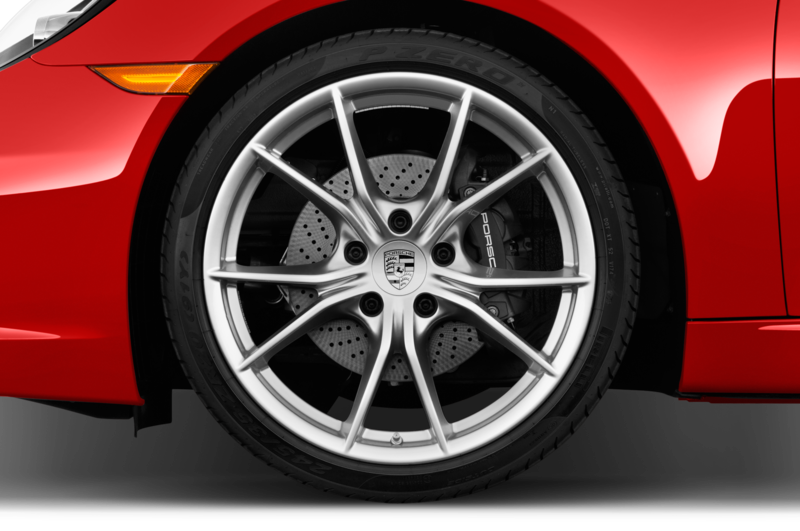 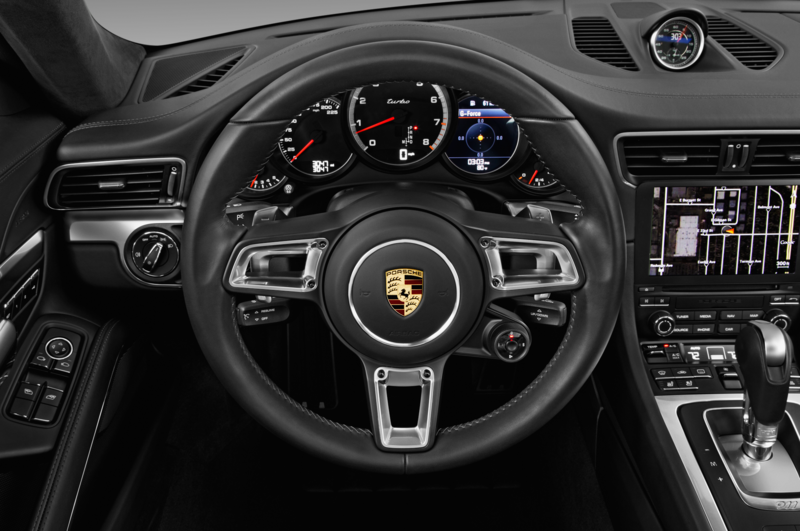 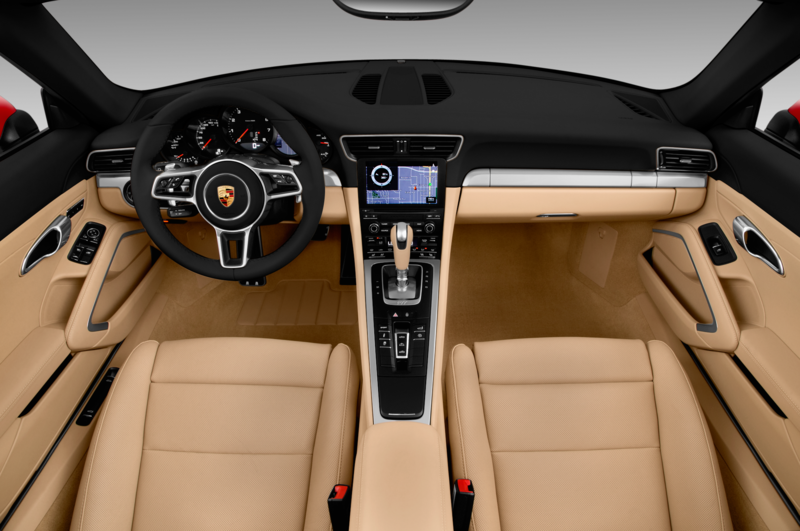 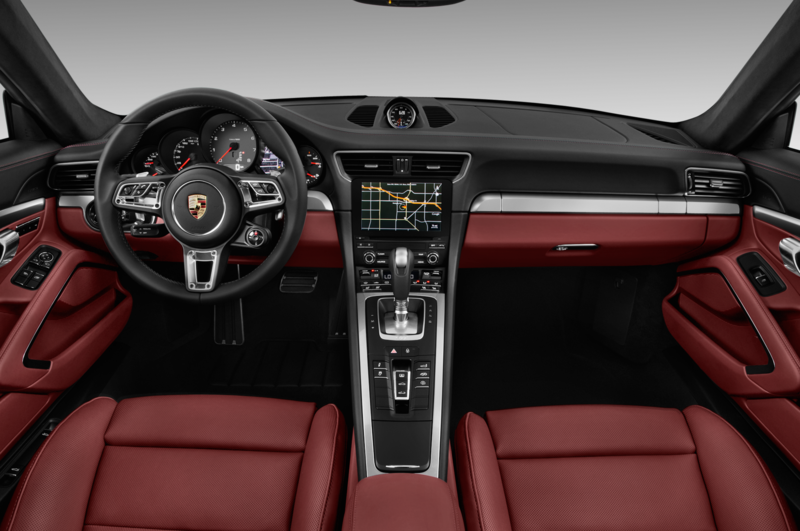 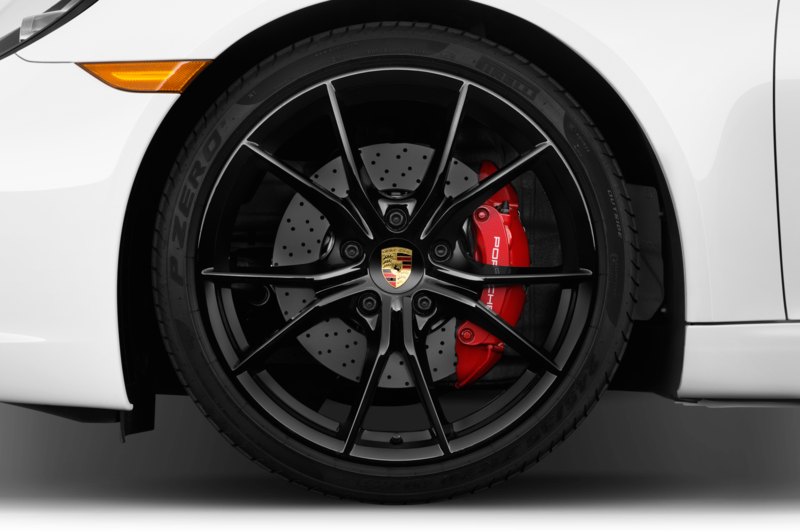 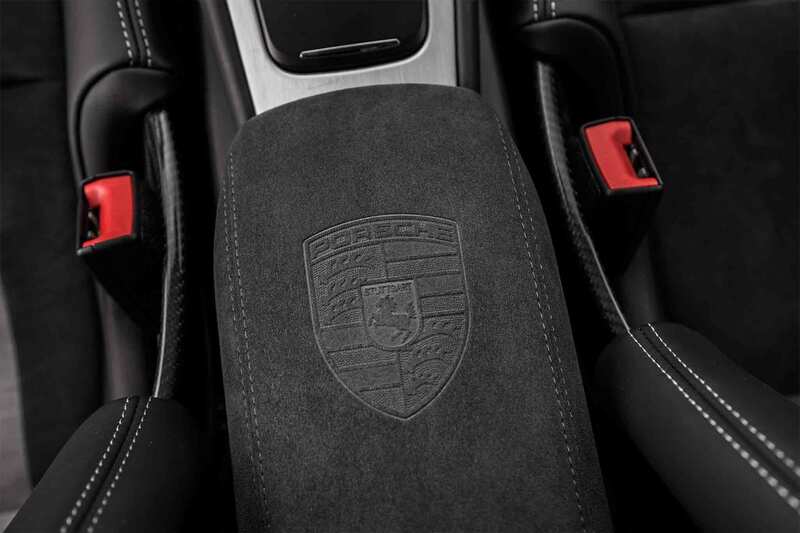 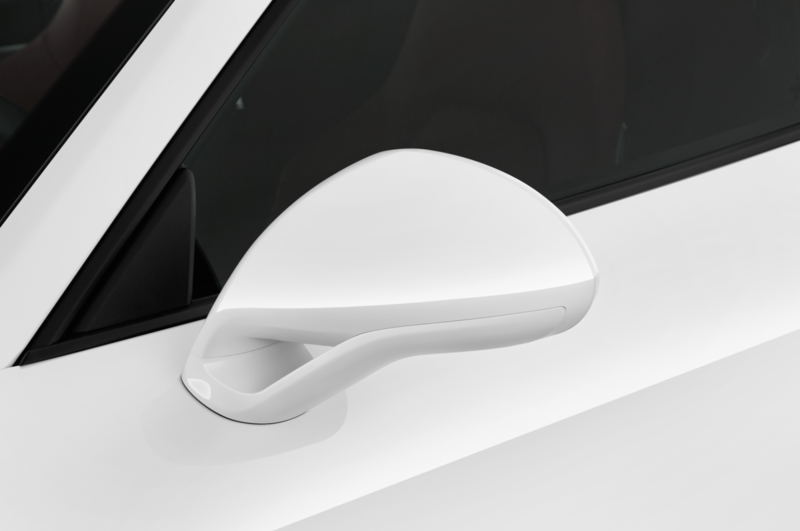 In fact, to execute a perfect heel-toe downshift you’ll need to be deep into the abundant braking power of the optional Porsche Ceramic Composite Brake system (a $9,210 upgrade over the standard steel brakes) just to get the brake pedal at the right height to dab the throttle as you move the lever between gates. 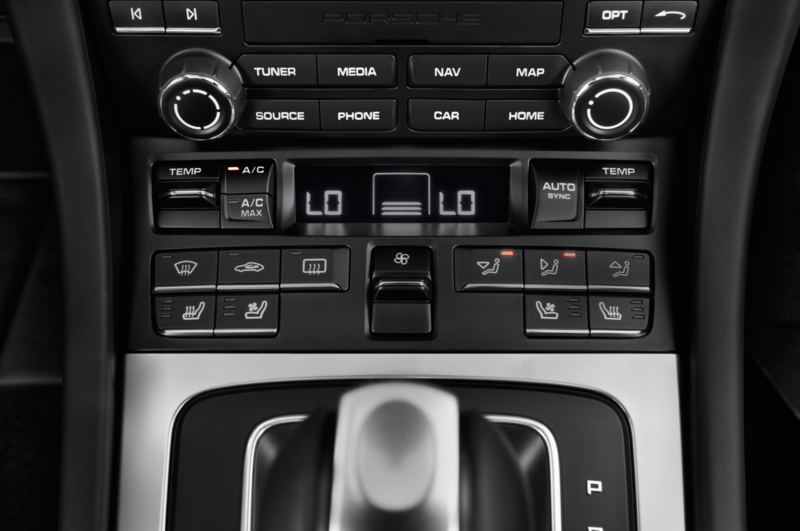 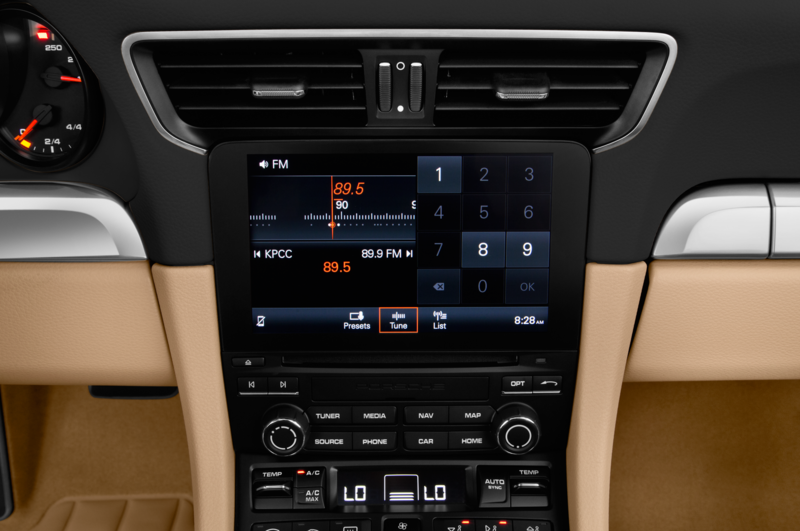 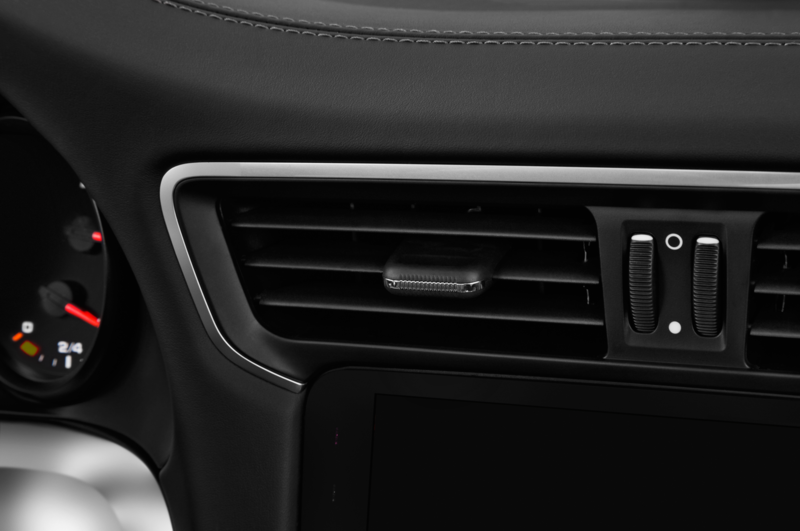 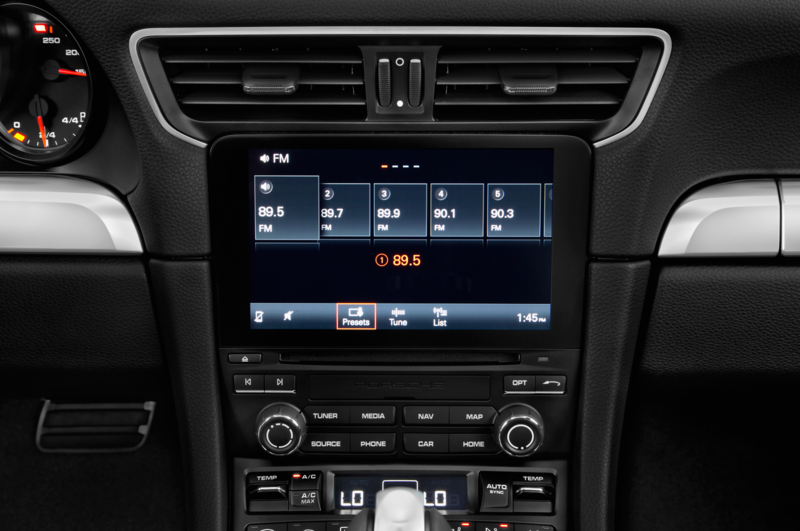 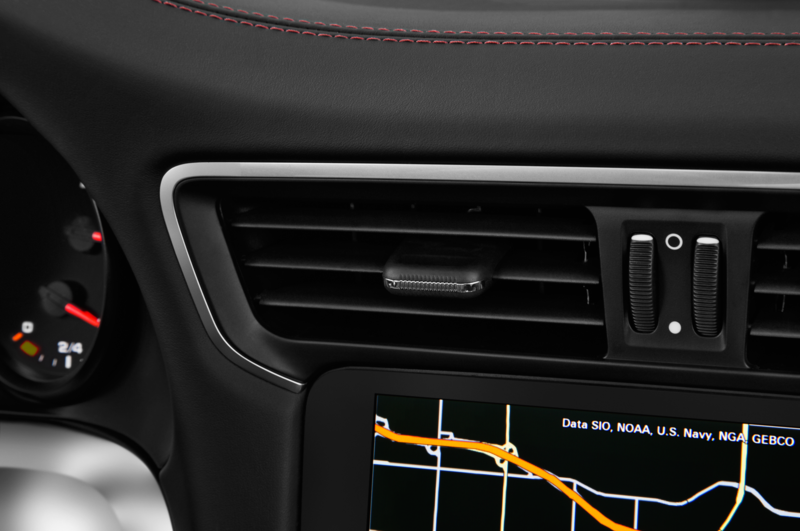 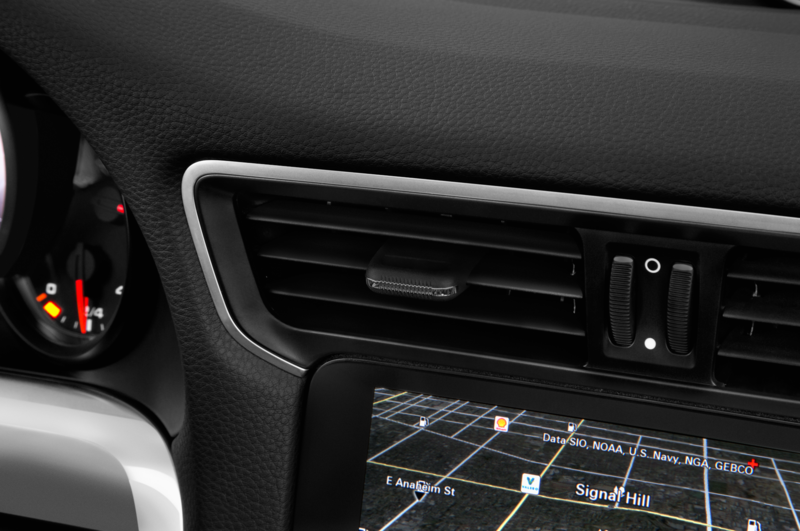 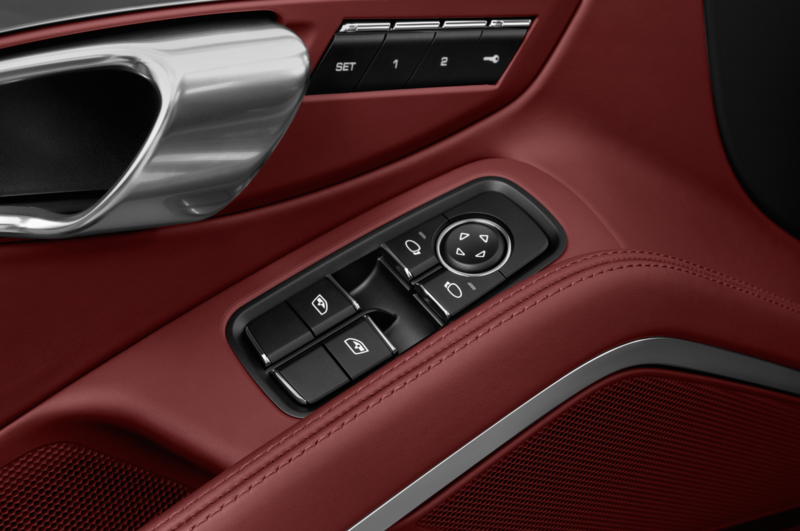 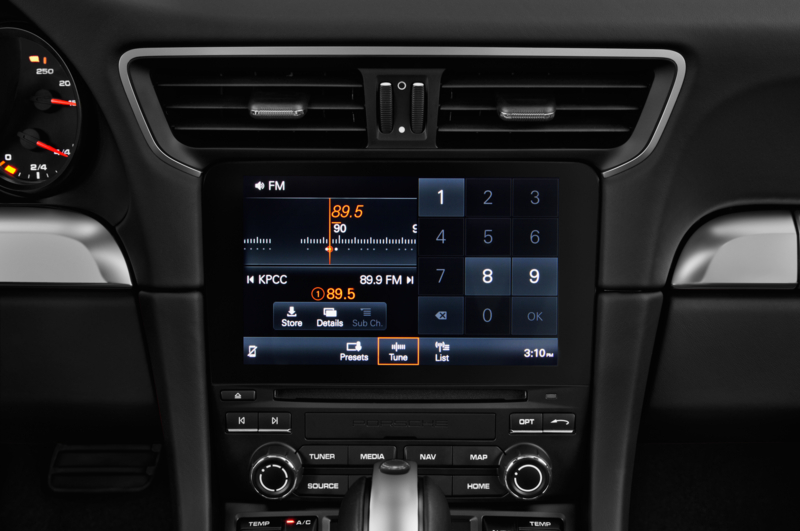 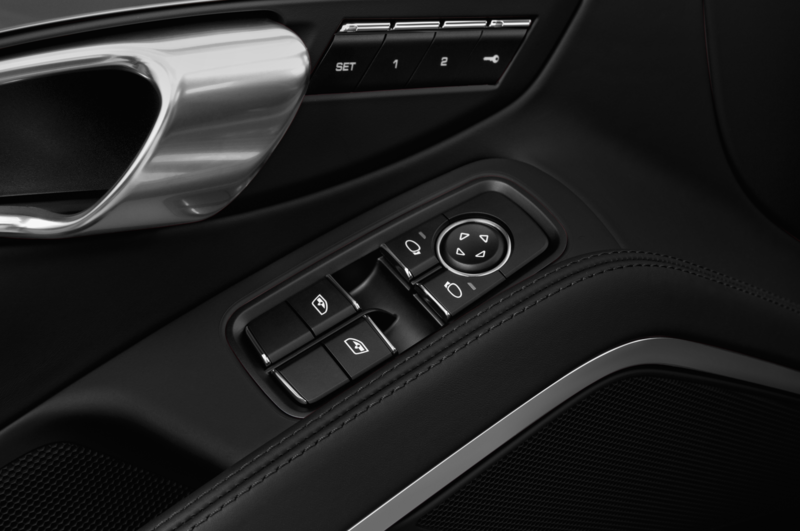 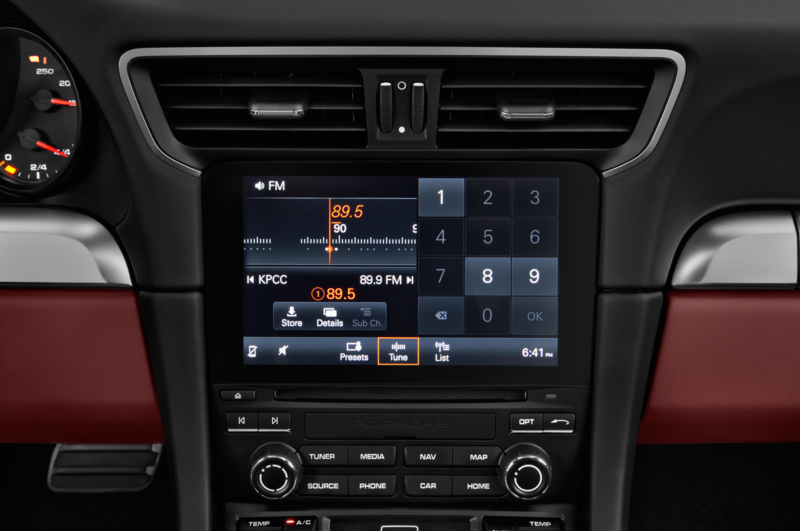 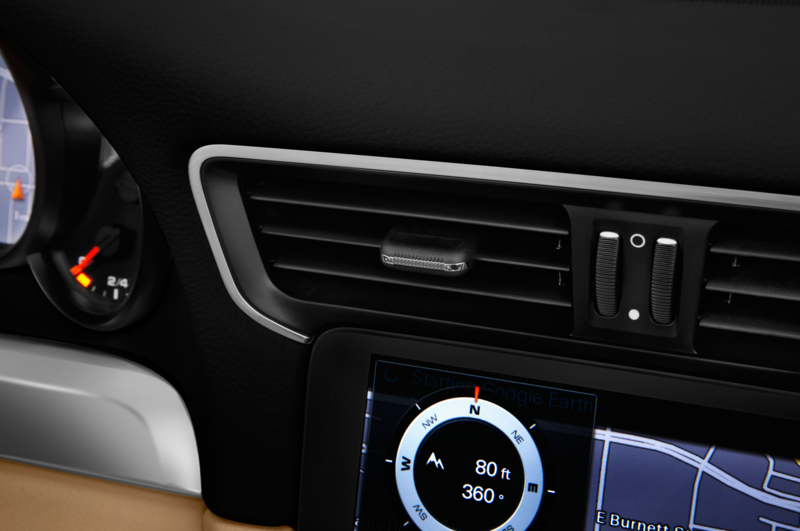 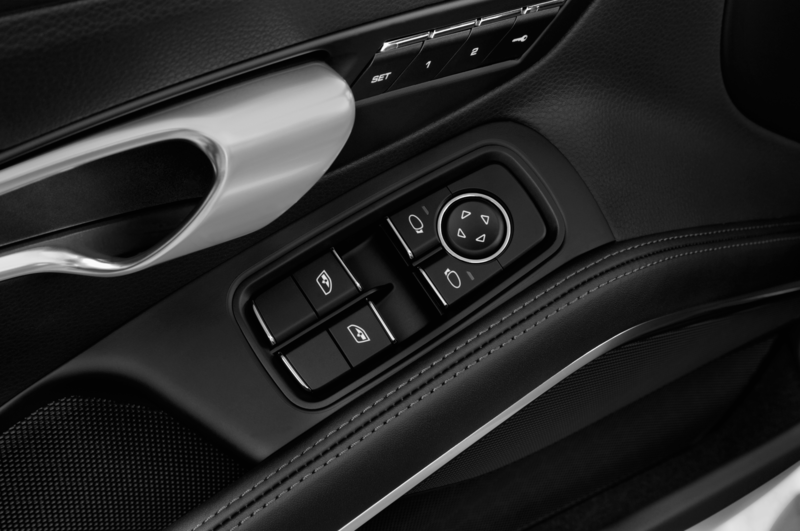 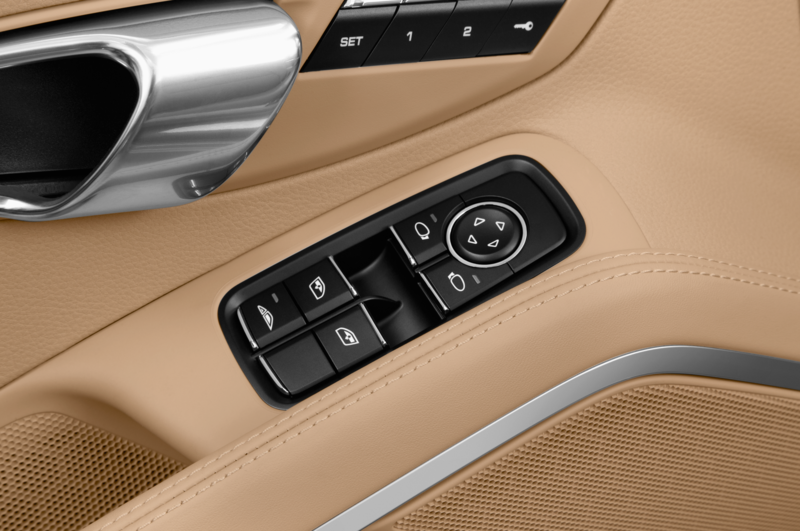 Fortunately for those with a bit less experience or those who just want to take human error out of the equation, a simple press of the Sport button in the center console turns on computer-controlled, rev-matched downshifting. 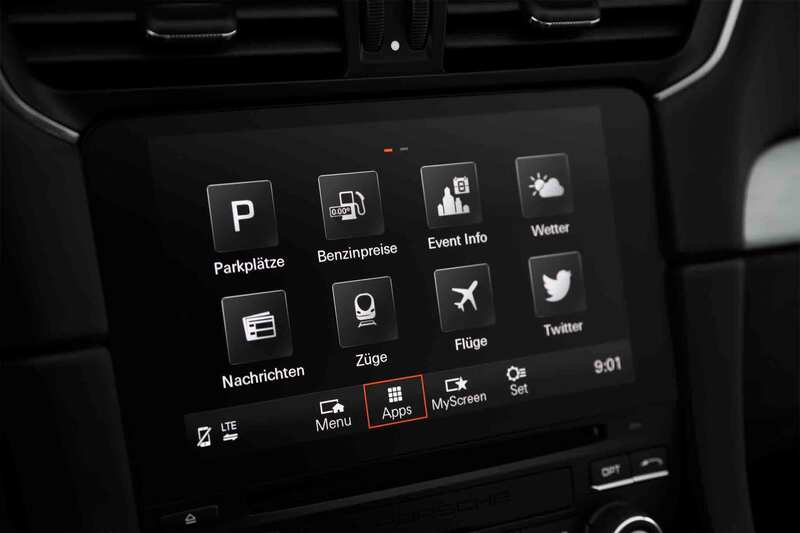 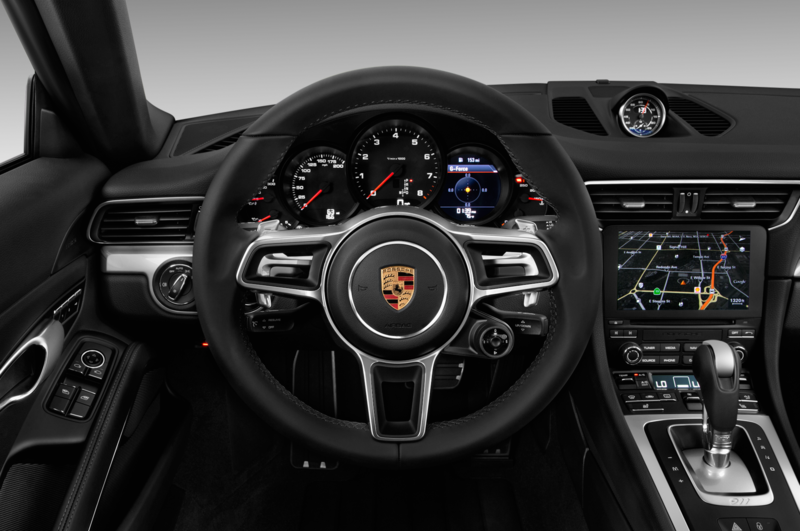 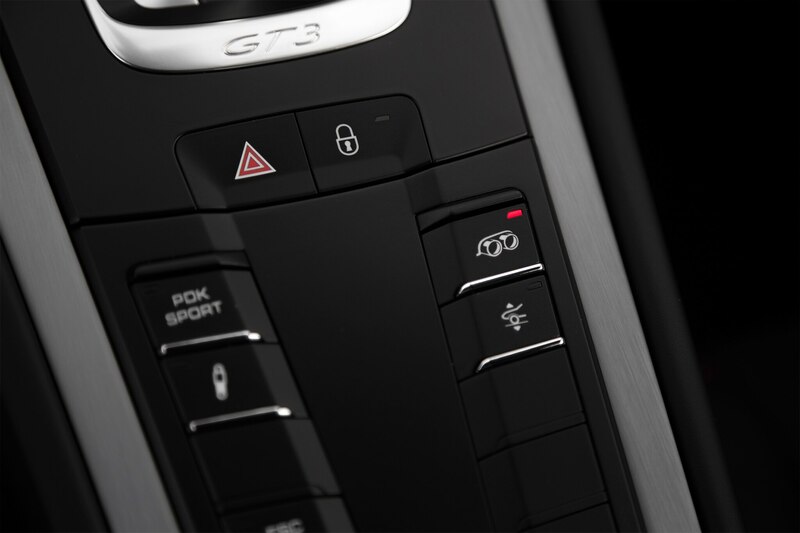 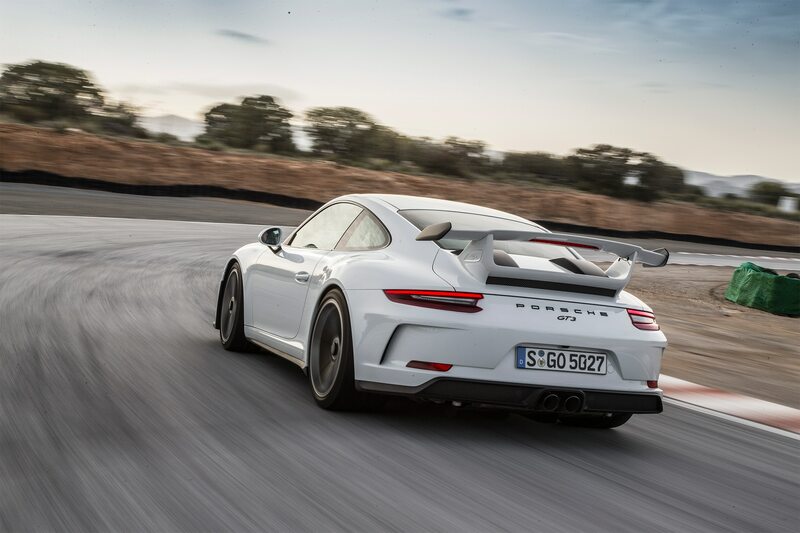 In fact, that’s the only parameter the Sport button adjusts on the manual-equipped GT3 (for PDK models, the Sport button adjusts the transmission programming into a more track-ready state). 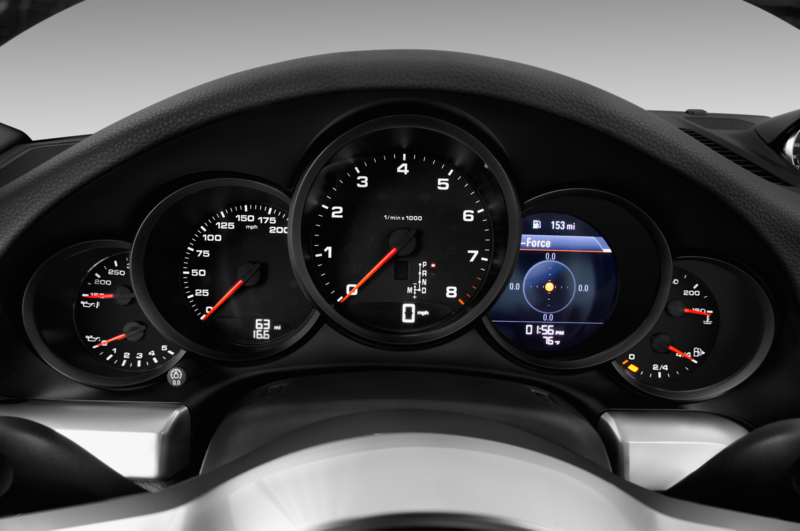 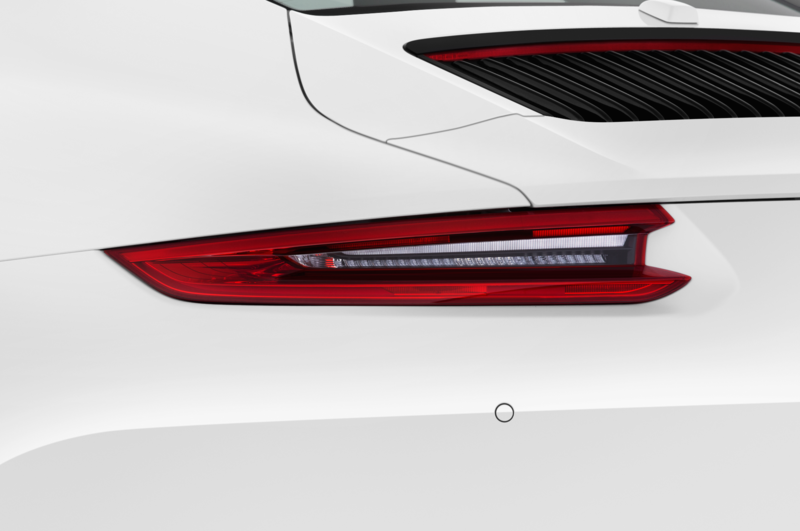 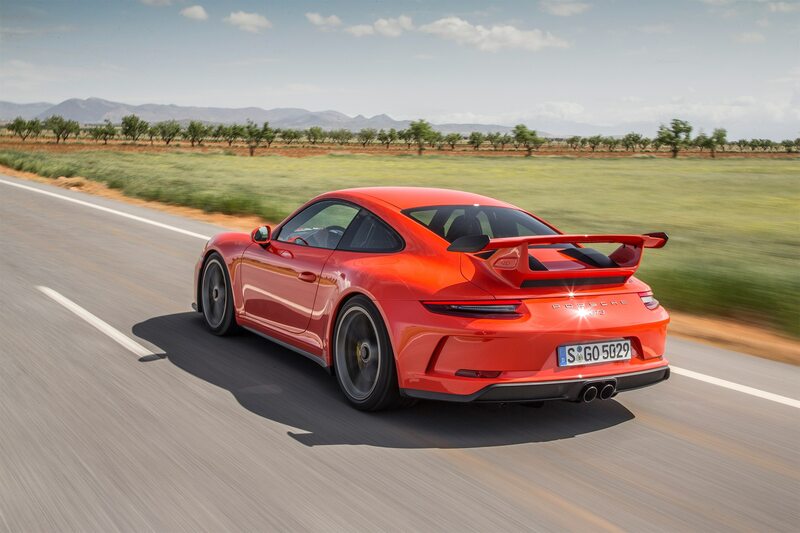 In other words, the base state of the GT3 upon startup would equate to something just short of Sport+ in any other 911, with the Sport button simply telling the transmission you’re ready for business. 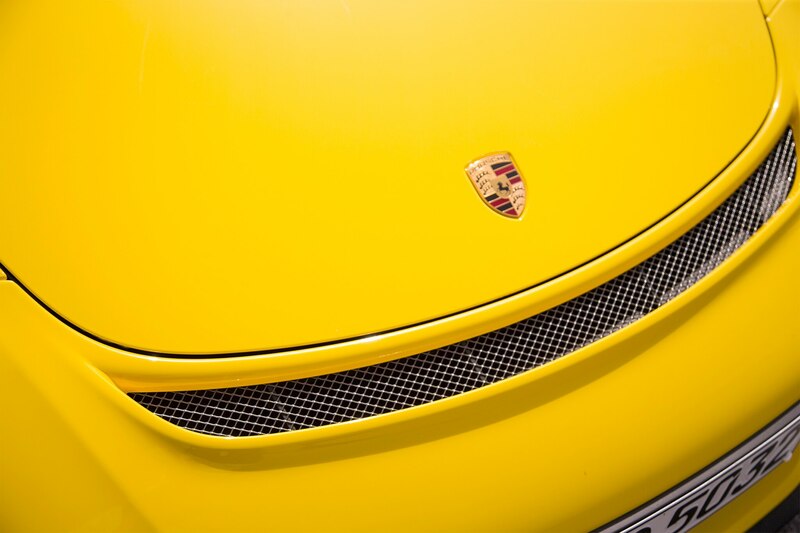 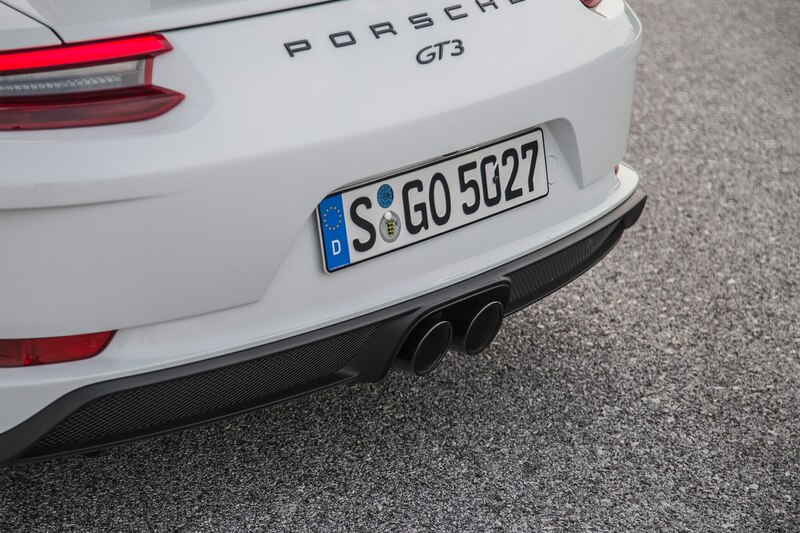 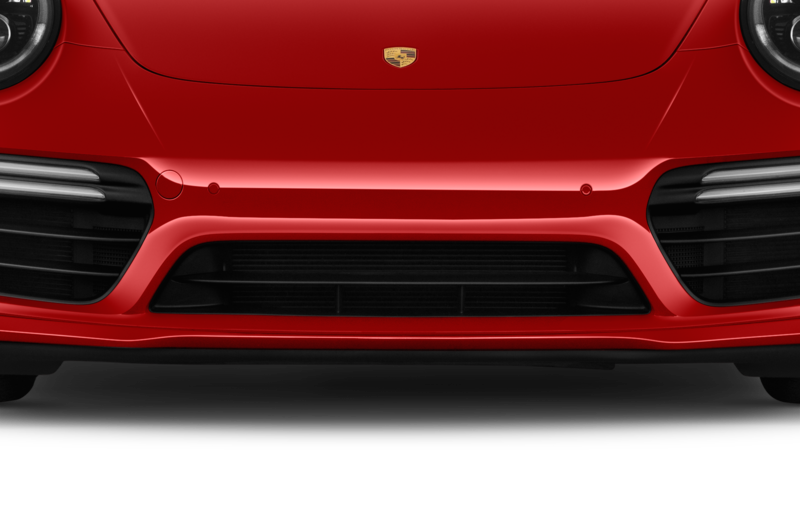 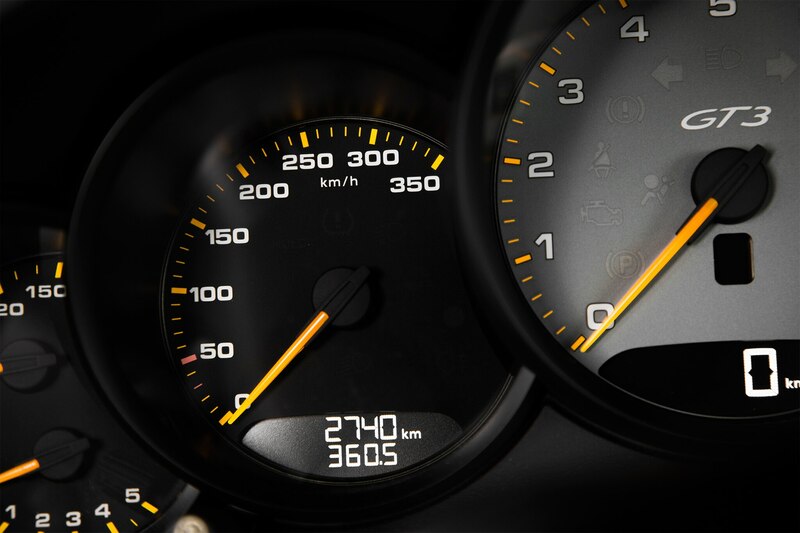 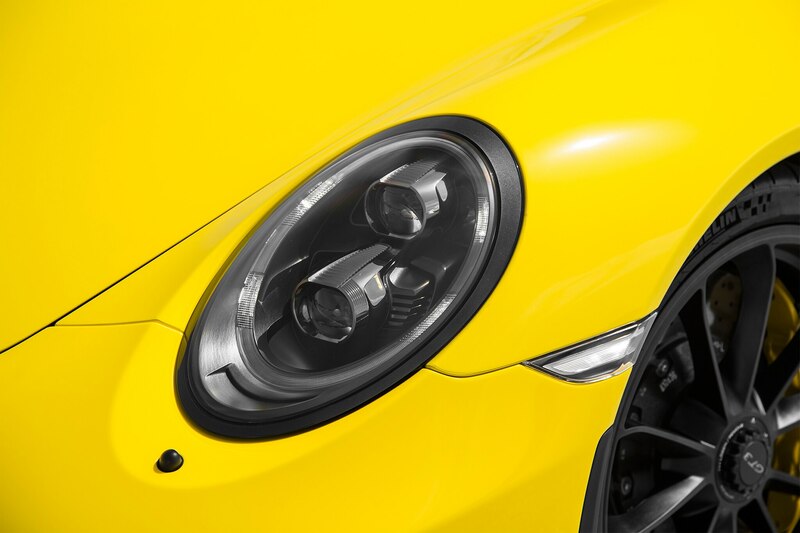 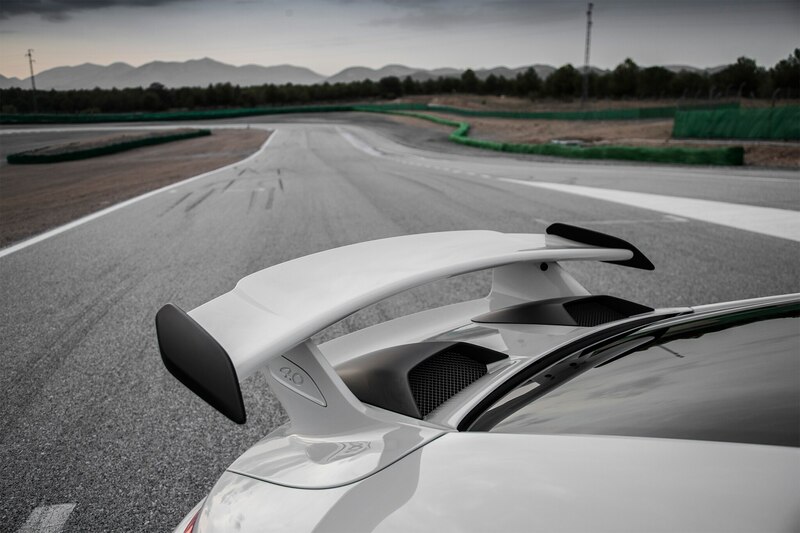 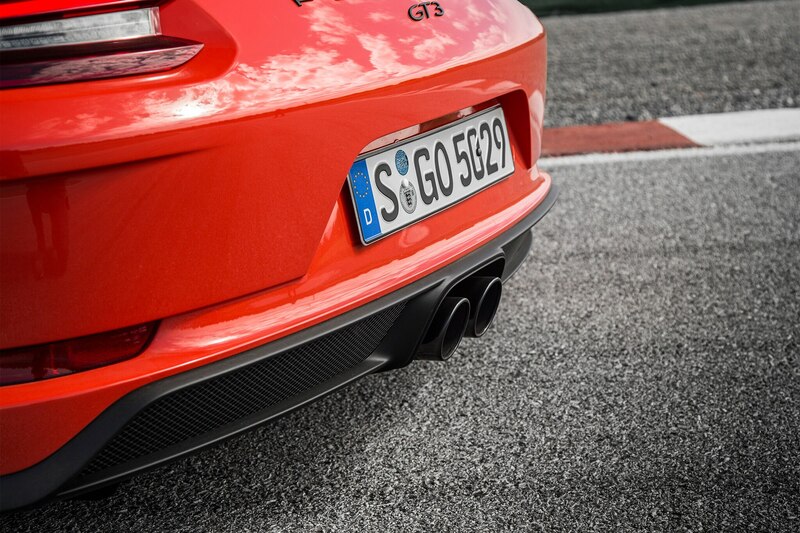 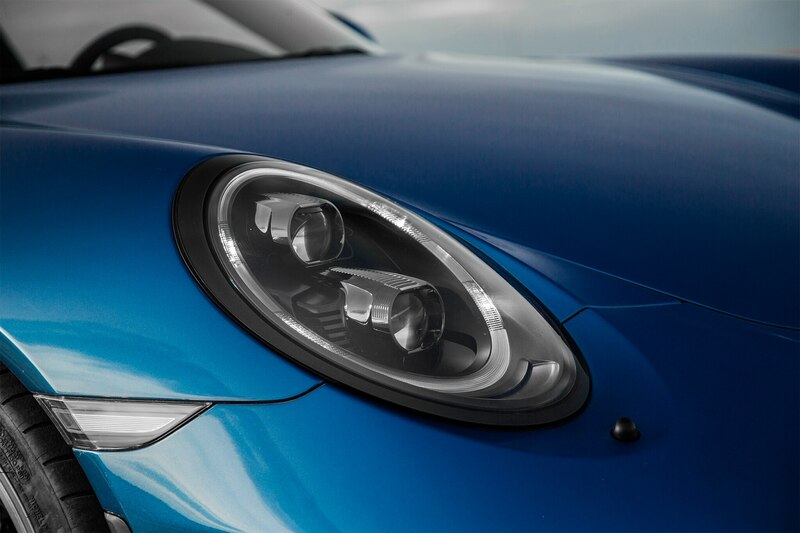 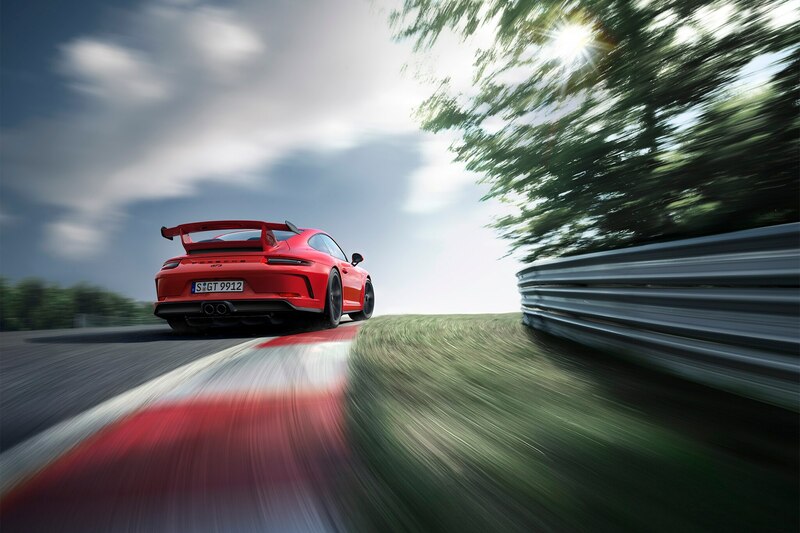 That simple fact reiterates Porsche’s mission statement for the 911 GT3: This car is always ready to seek the limit. 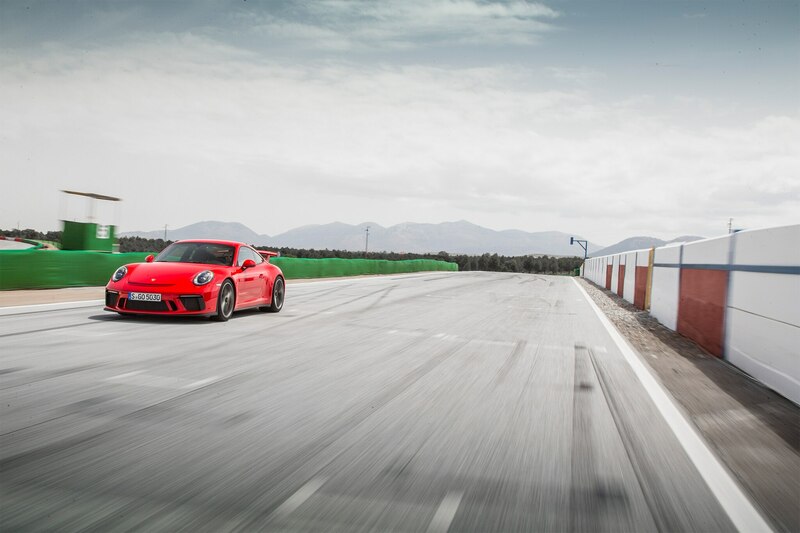 And seek the limit I did, doing my best to keep pace with Röhrl. 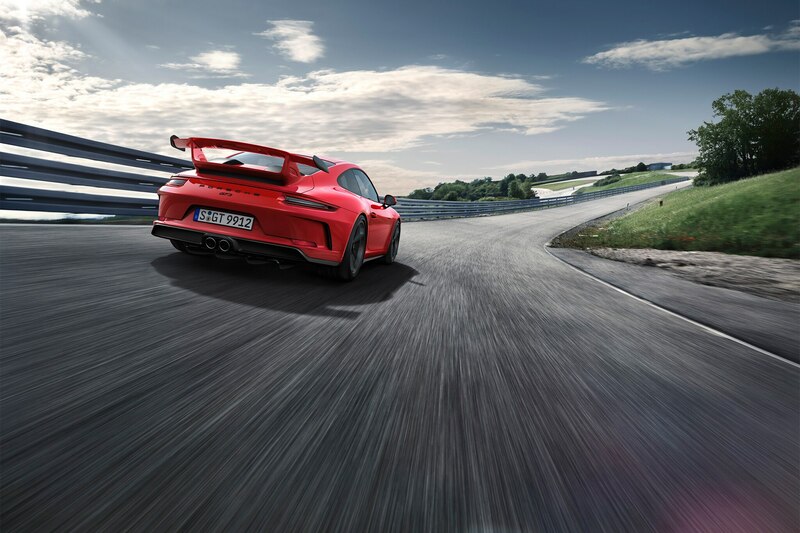 That’s no easy task as, even at 70 years of age, he is sharper and quicker than any mere mortal. 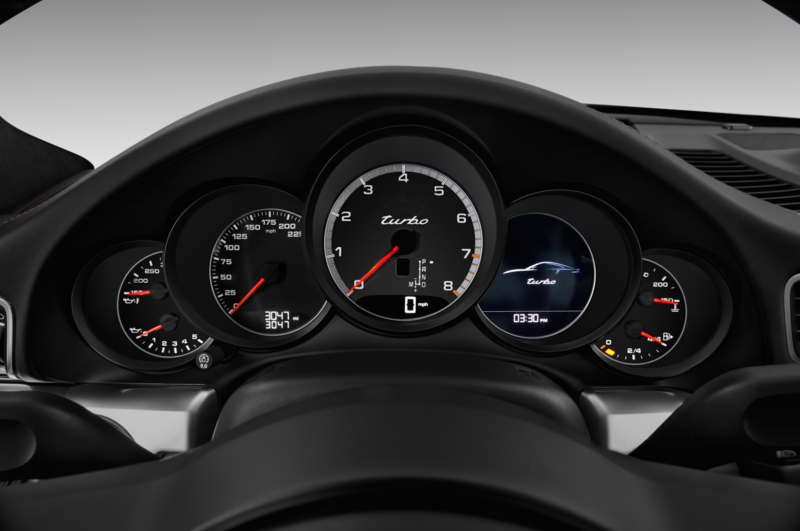 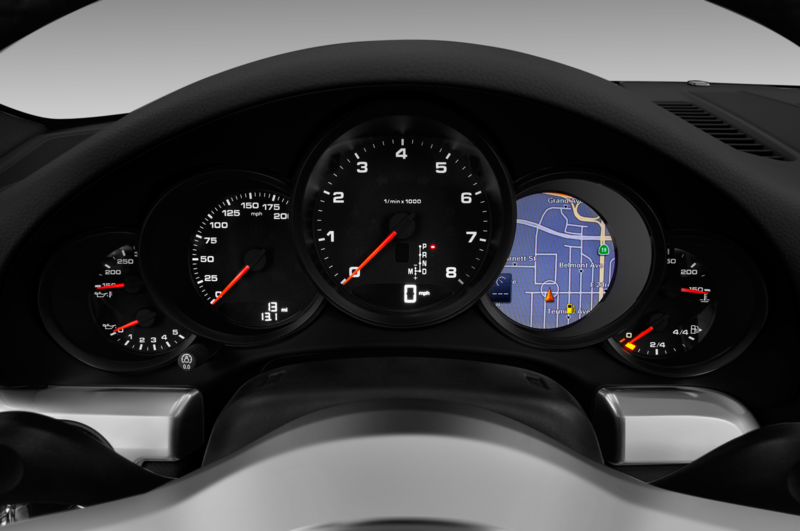 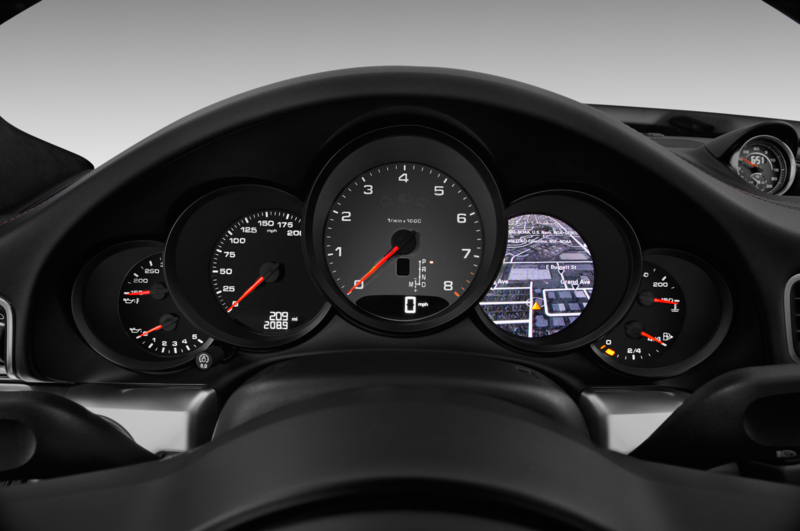 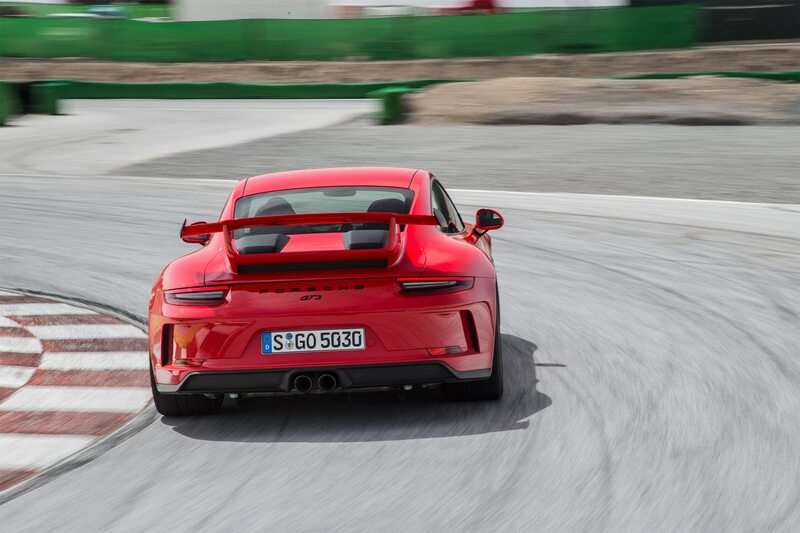 But in the 911 GT3, it’s as easy as it’ll ever get. 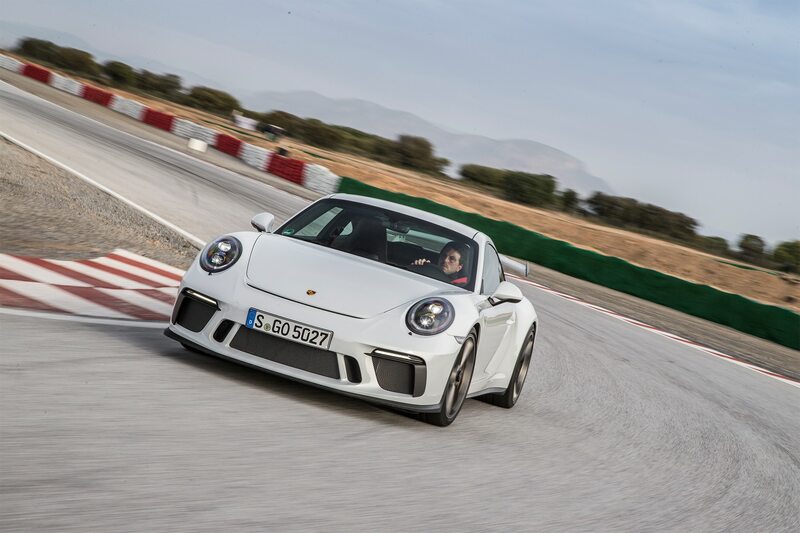 The car simply does what you ask of it, never getting in the way of proper driving, even with all of the traction and stability controls engaged. 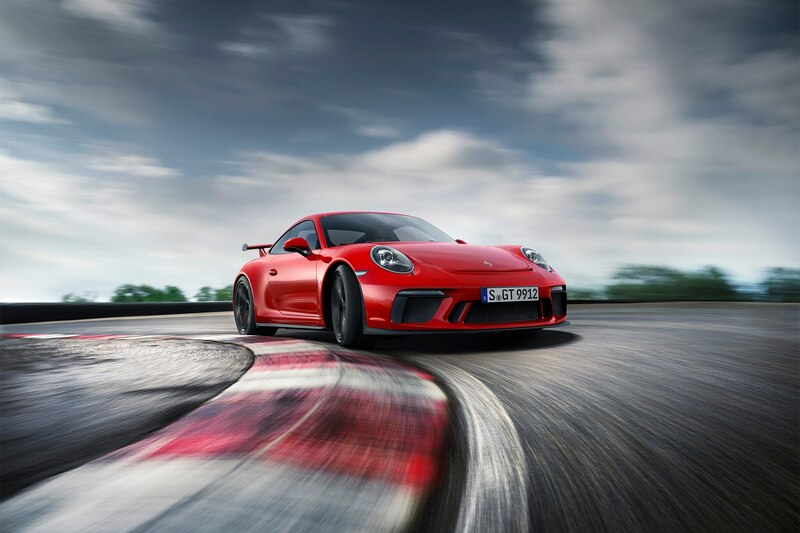 Nail the throttle and the reworked flat six sings to its 9,000-rpm redline, your brain screaming, “Shift!” from about 7,500 rpm onward as the pitch continues to rise, the volume hitting its crescendo like a race-car trumpet blast. 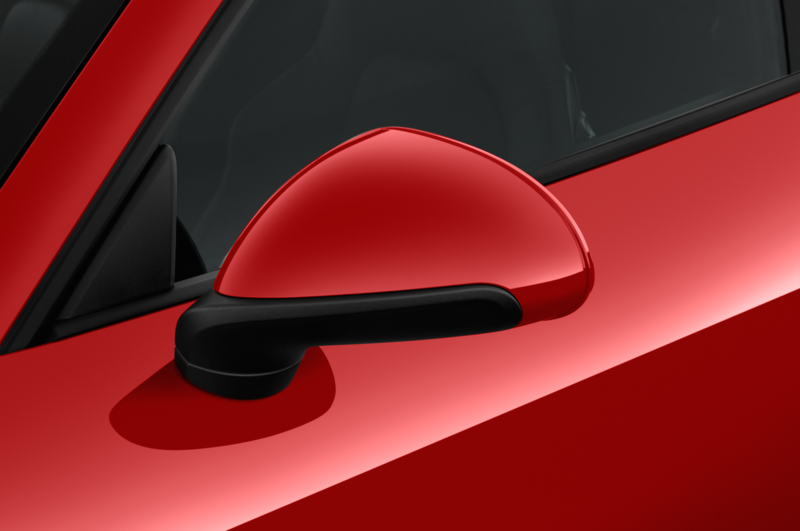 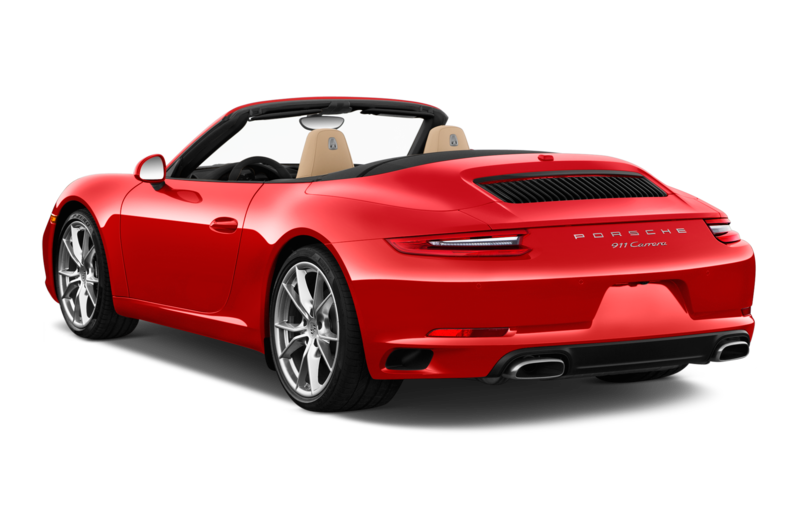 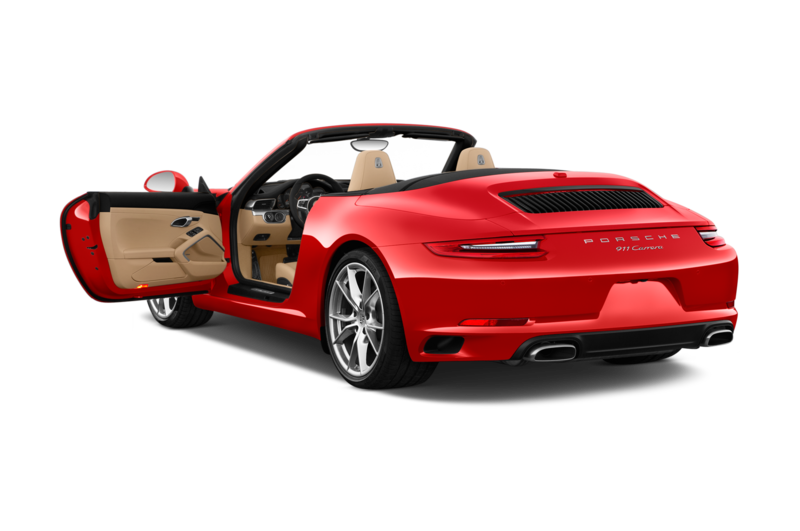 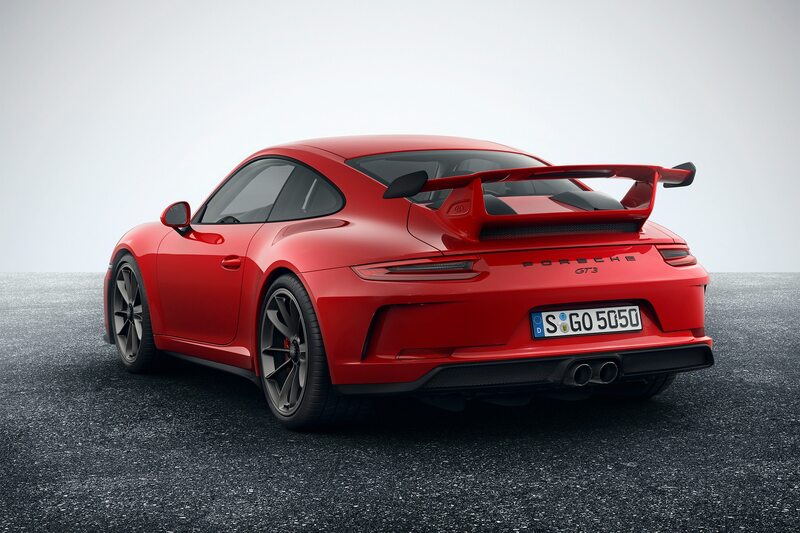 Pin the brakes to shed some speed, trail off as you turn in, and the rear-engine pendulum mass edges the rear out ever so slightly, pointing you down to the apex. 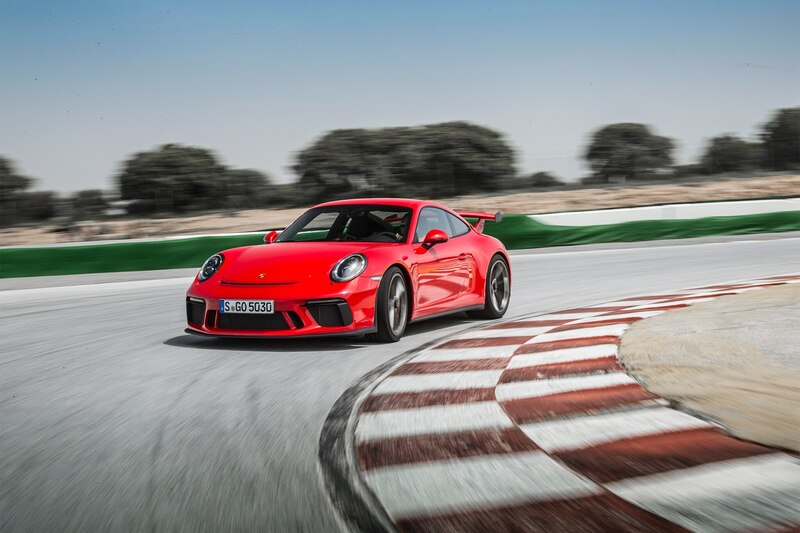 Squeeze the throttle again just as you begin unwinding the wheel, and the rear end bites with just a degree or two of yaw tracking to the exit, at least with the mechanical limited-slip differential of the manual-equipped GT3, which provides 30 percent locking force under power, and 37 percent on deceleration. 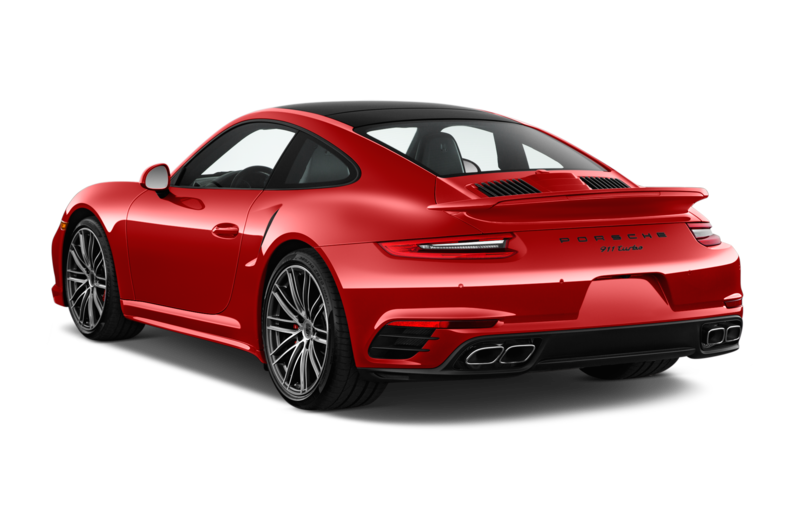 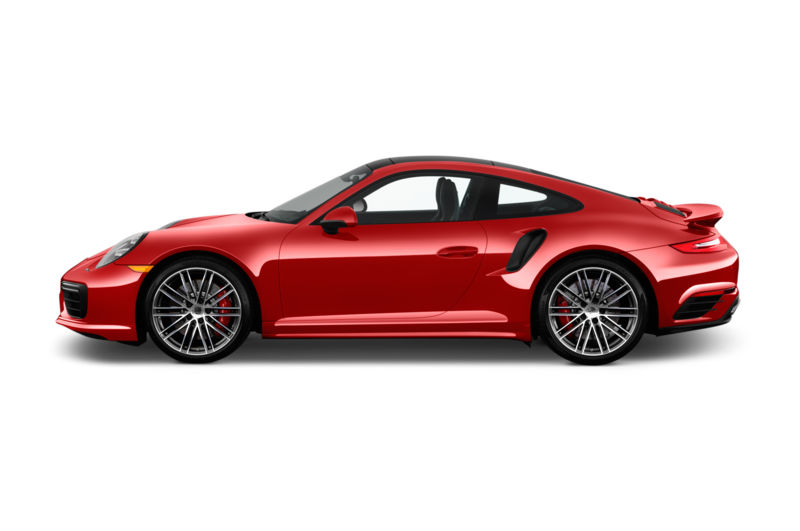 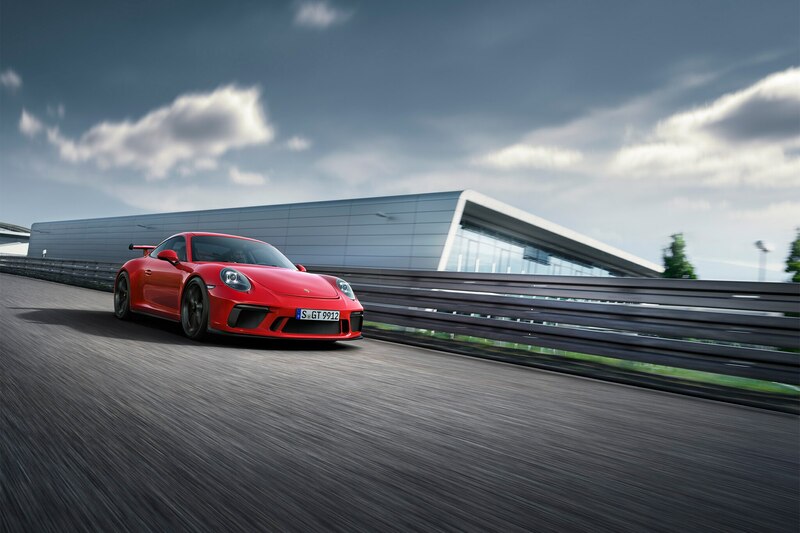 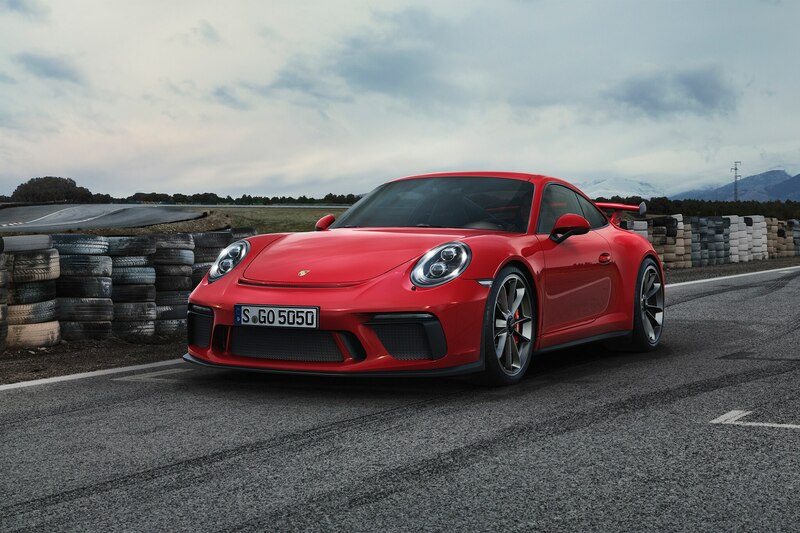 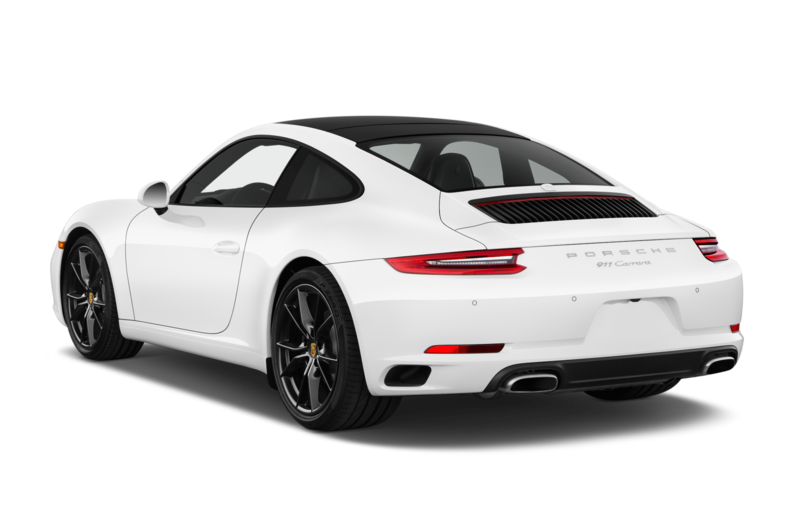 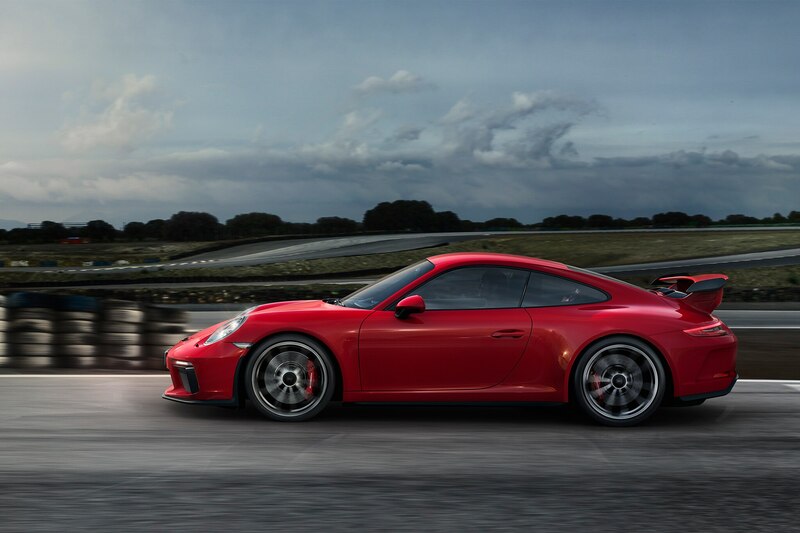 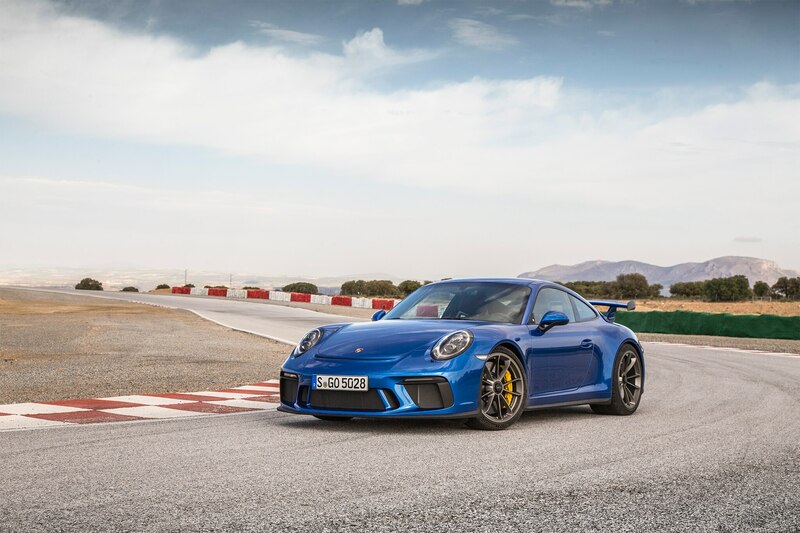 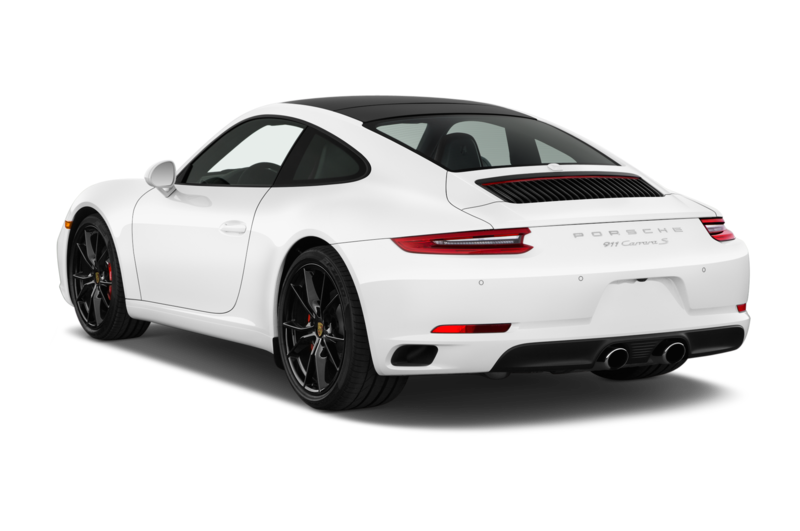 The PDK-equipped GT3 gets an electronically controlled, infinitely variable 0-100-percent locking limited-slip differential. 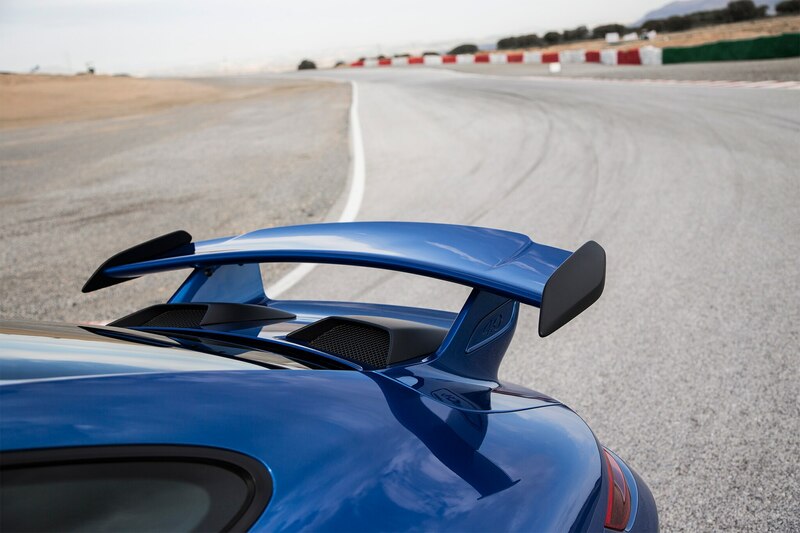 With it, corner exit is utterly tidy, the rear never stepping out, just pure forward acceleration. 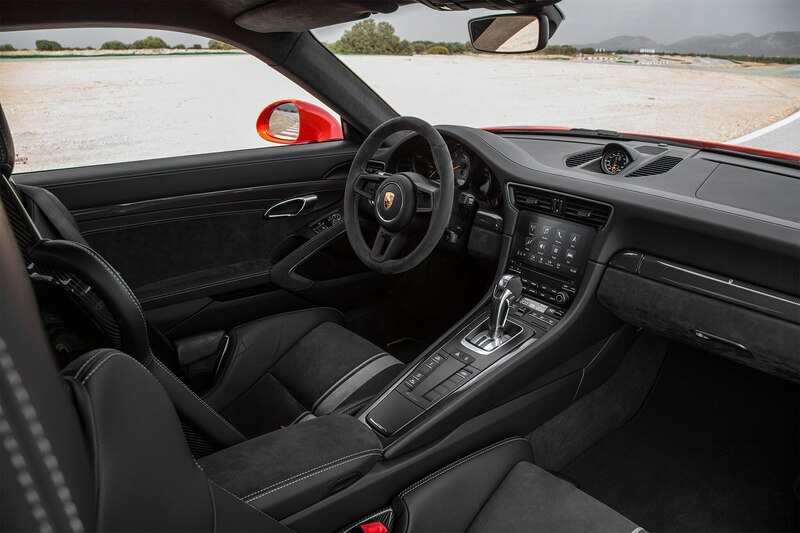 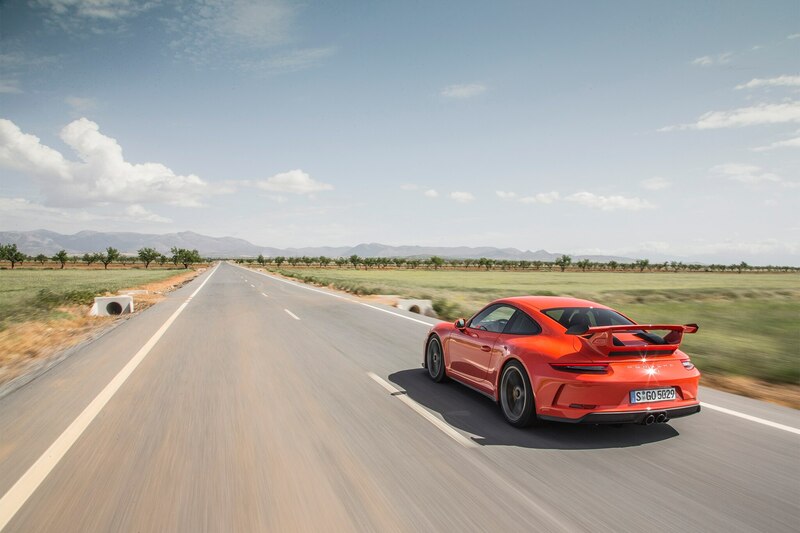 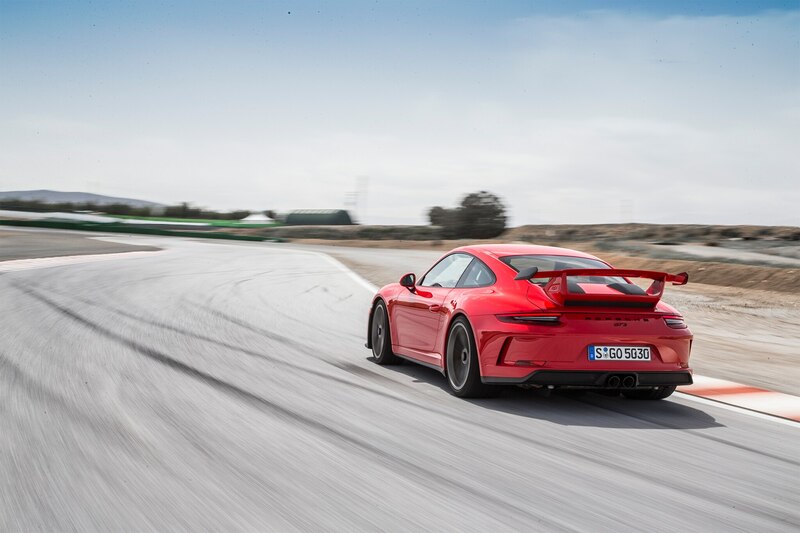 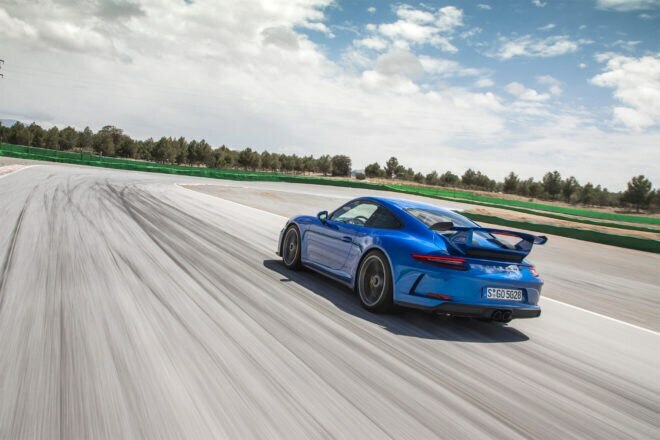 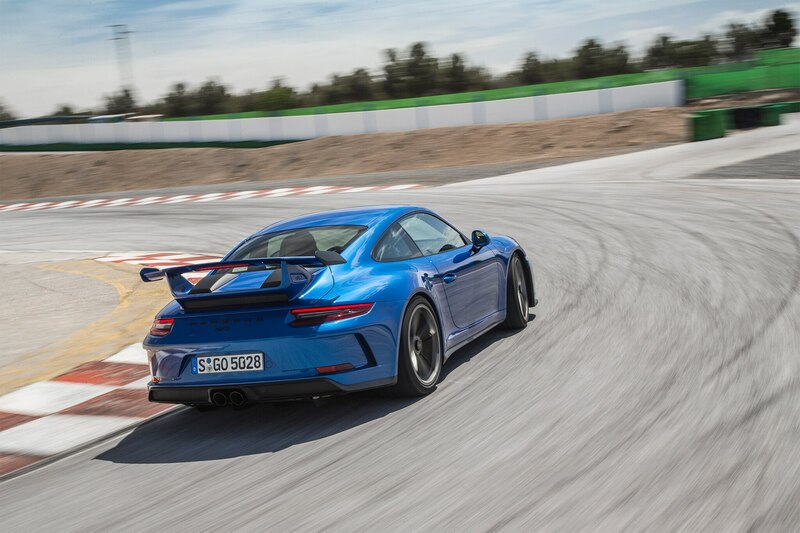 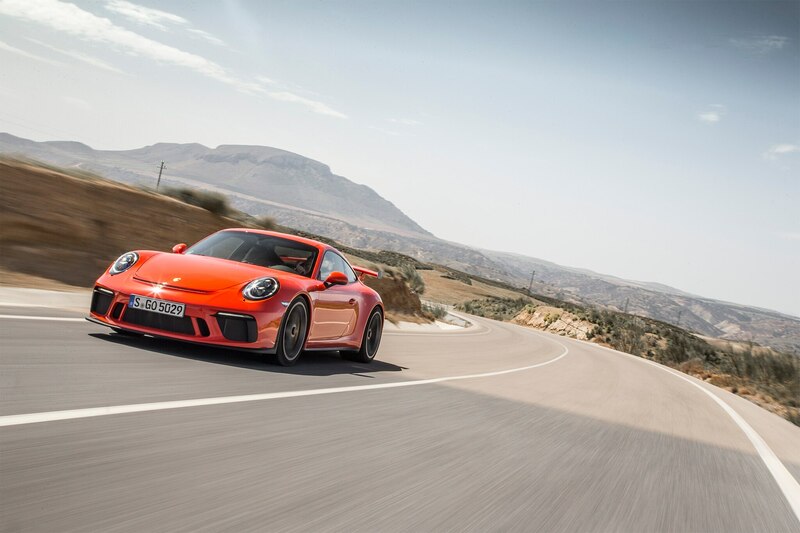 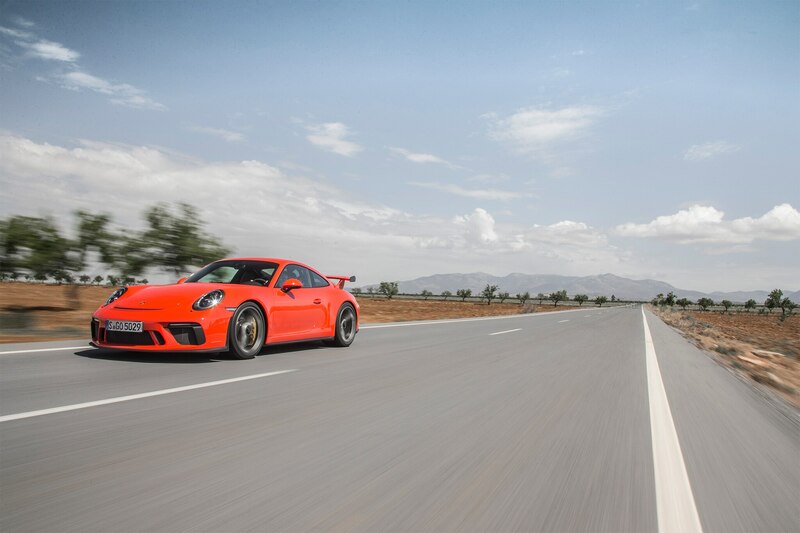 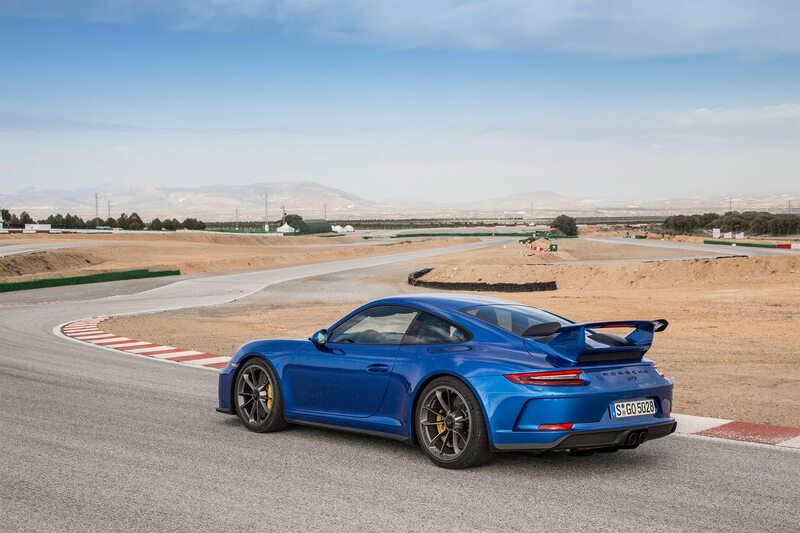 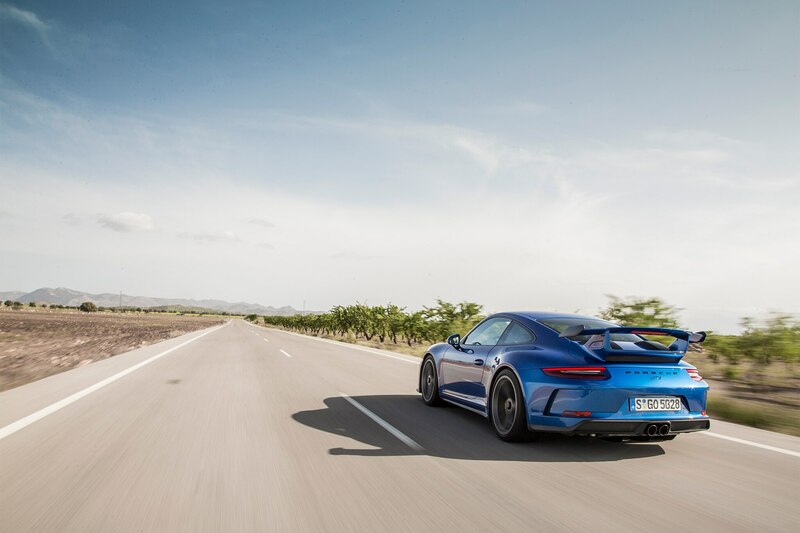 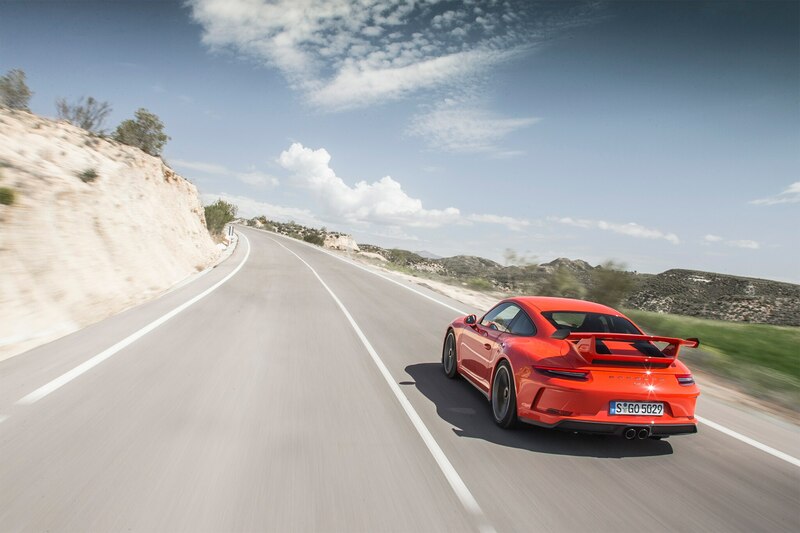 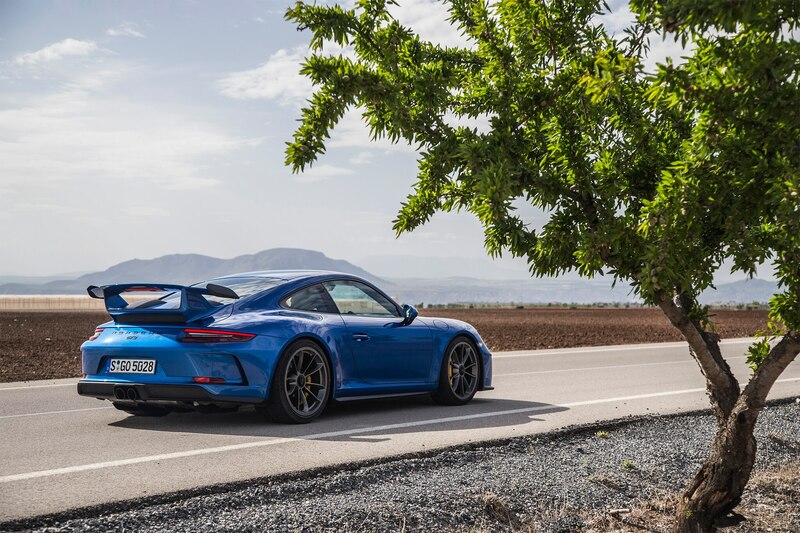 Between this cleaner power delivery and the lightning-quick shifts of the dual-clutch, it’s easy to understand why the PDK GT3 delivers better lap times. 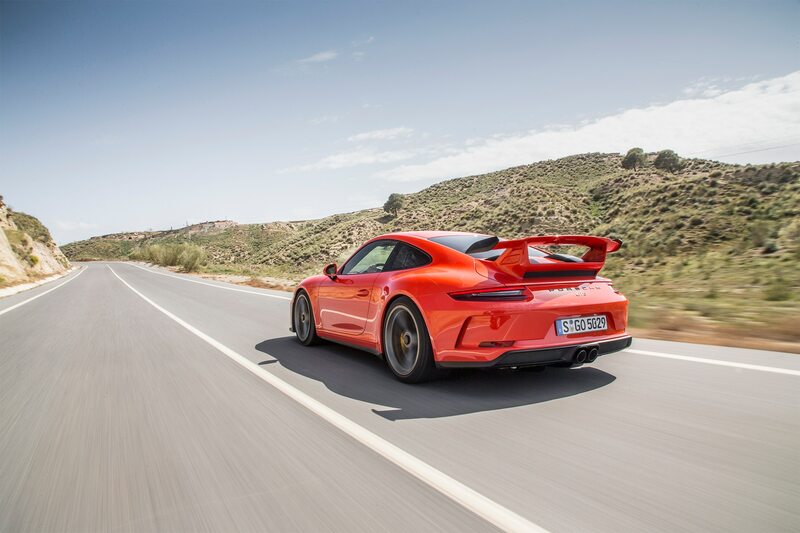 It’s also quicker to 60 mph. 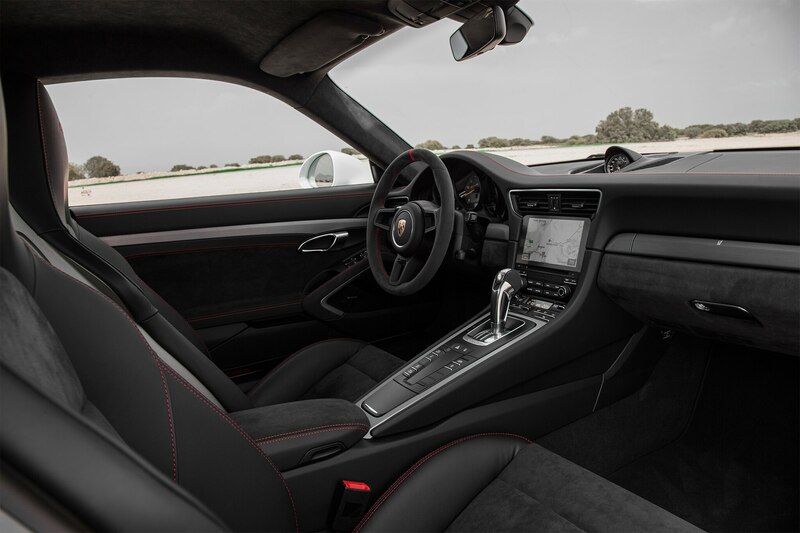 The manual takes 3.8 seconds, while the PDK needs just 3.2 seconds. 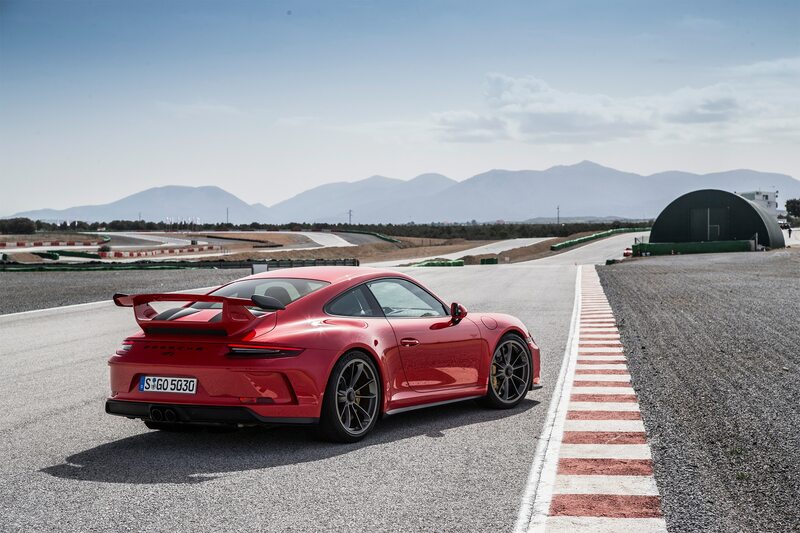 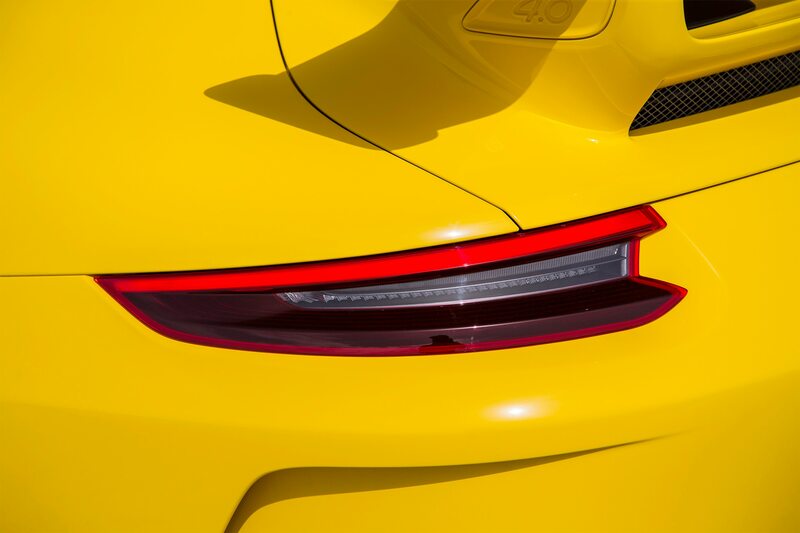 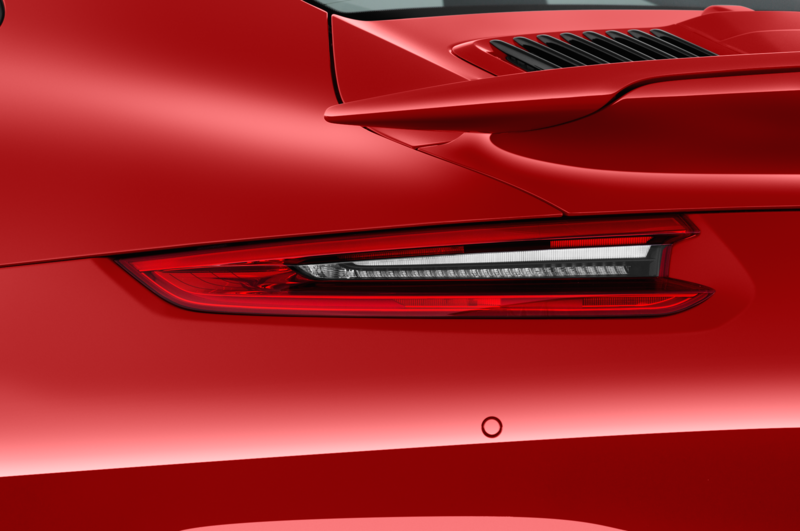 None of this should be a surprise, of course, because the previous 991.1 generation of the 911 GT3 was already excellent. 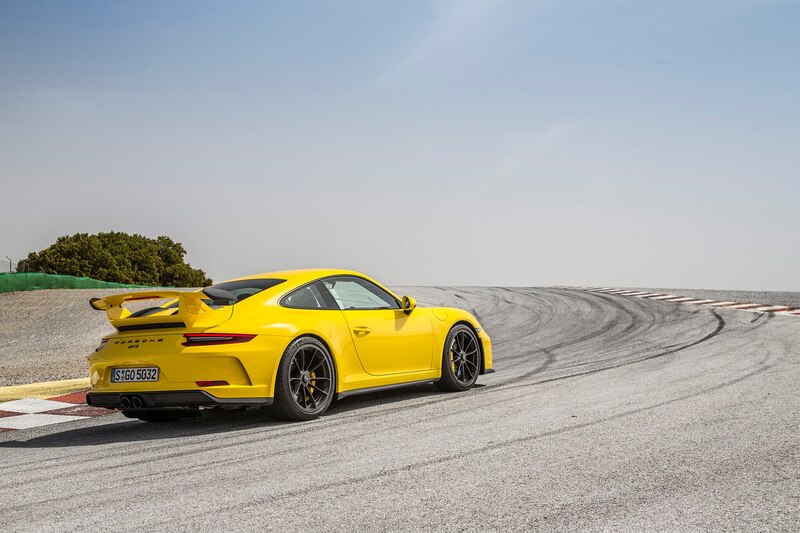 The 991.2 version takes some of the best tricks of the 991.1 GT3 RS and the 911 R and marries them into a track-day-ready wonder. 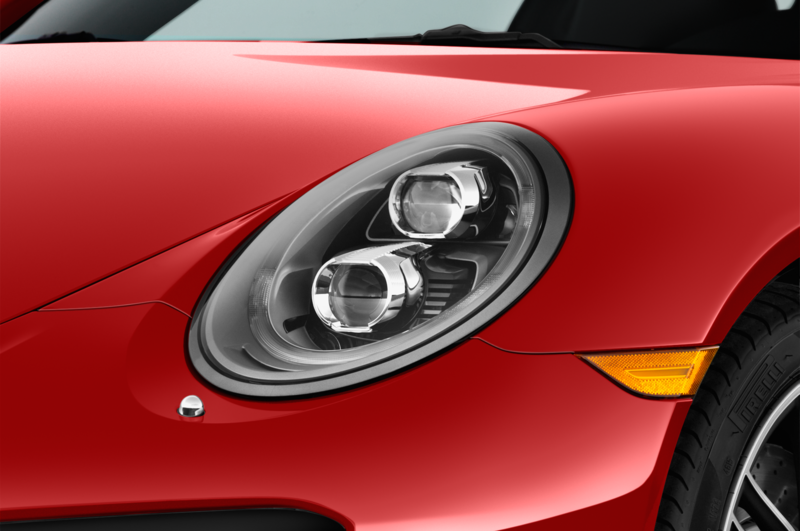 The list of upgrades is extensive. 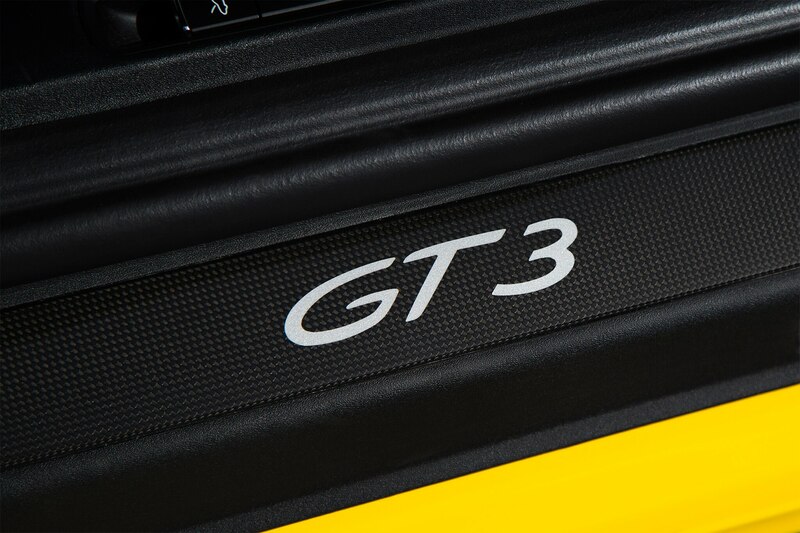 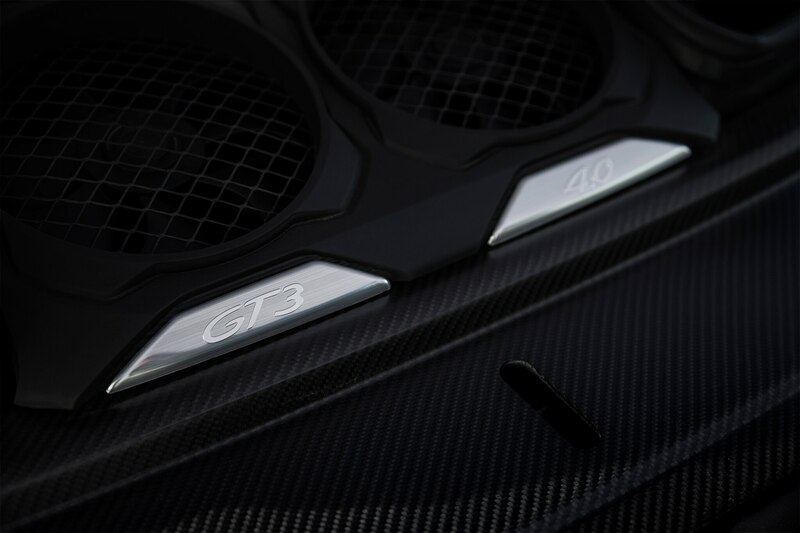 At the heart of the new GT3 is the brand-new 4.0-liter engine. 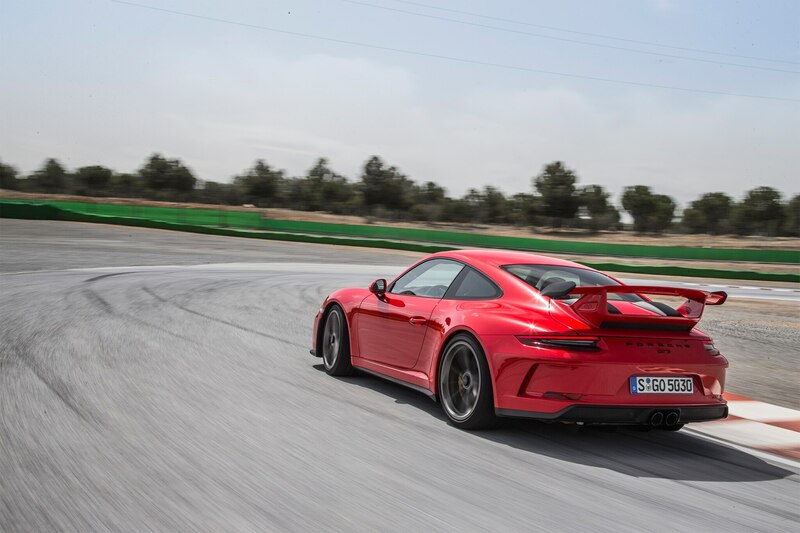 Sharing its block with the new motorsports engines, the 991.2 GT3’s flat-six gets larger main bearings to house a larger diameter, stiffer crankshaft that now features a center bore that allows better oiling of the connecting-rod big ends, which also get wider and thicker bearings. 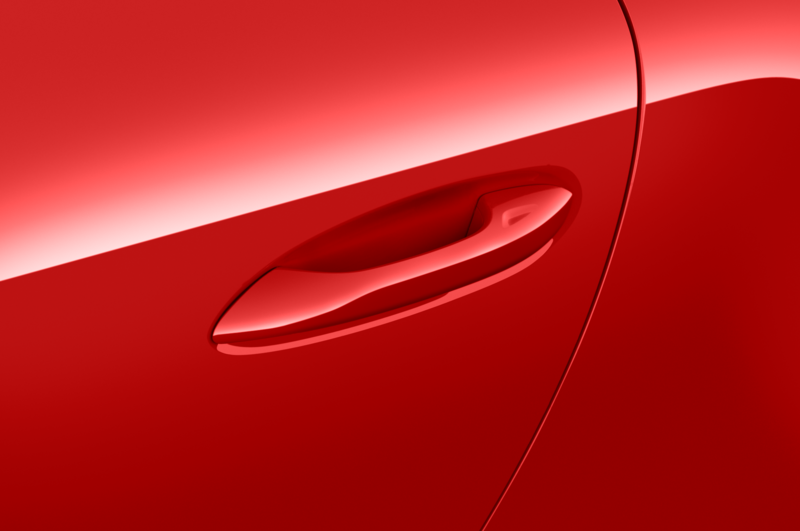 The cylinders get a plasma coating to reduce friction. 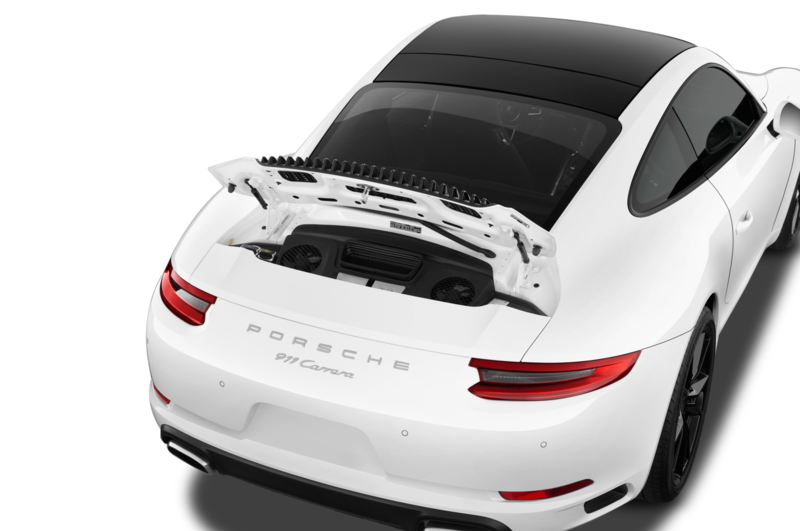 The entire oiling system has been upgraded, reducing the flow requirements from 120 liters/minute to 70 liters/minute, reducing parasitic losses. 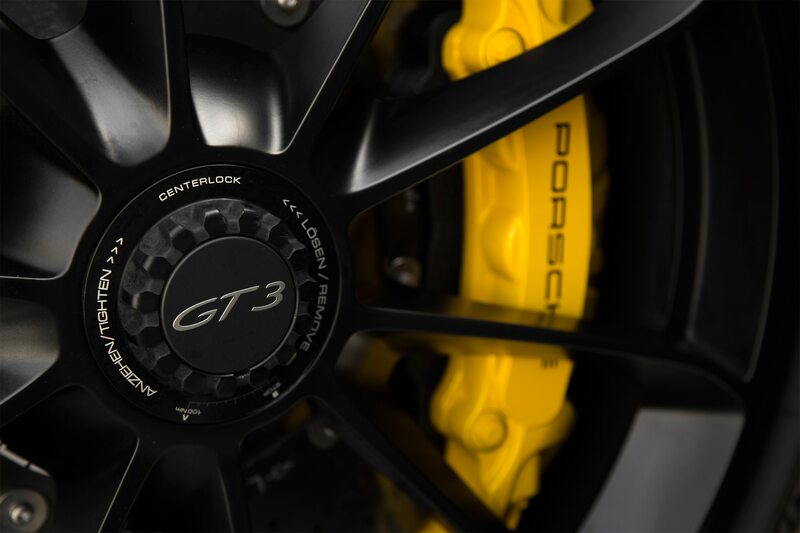 New solid lifters replace the hydraulic units found in the previous GT3 engine, reducing the valvetrain’s mass and yet not requiring the frequent valve-lash adjustments typical of solid lifters. 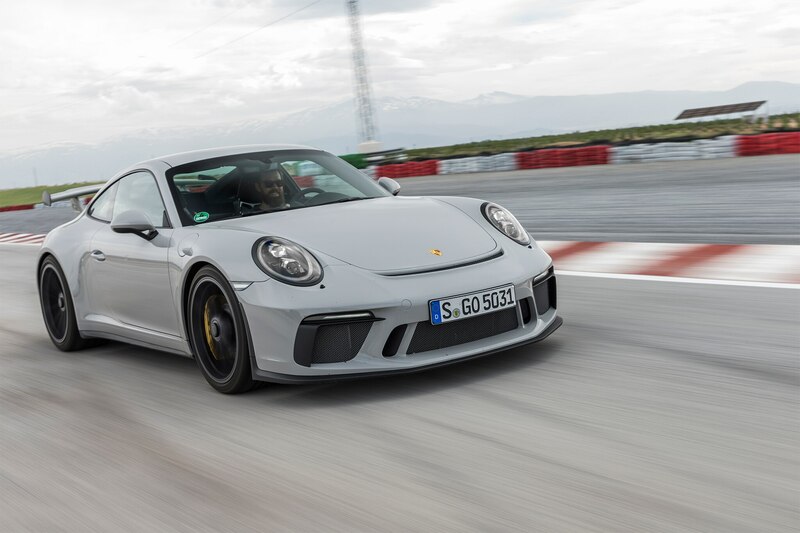 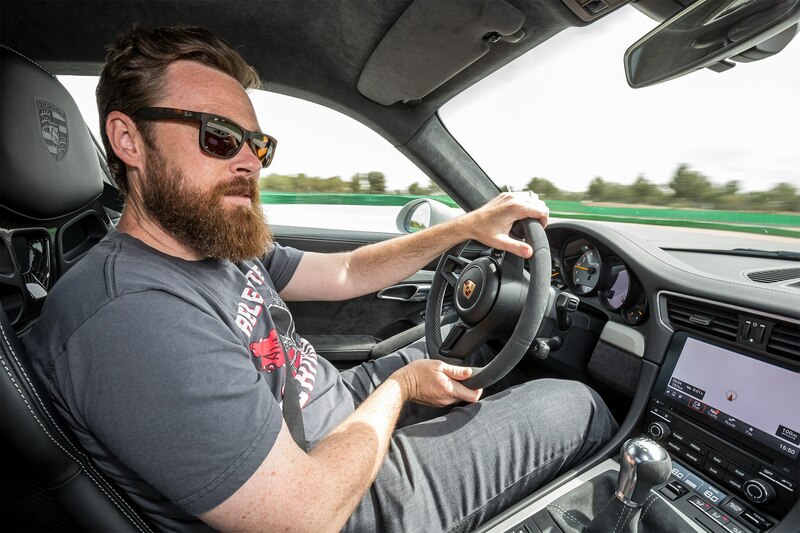 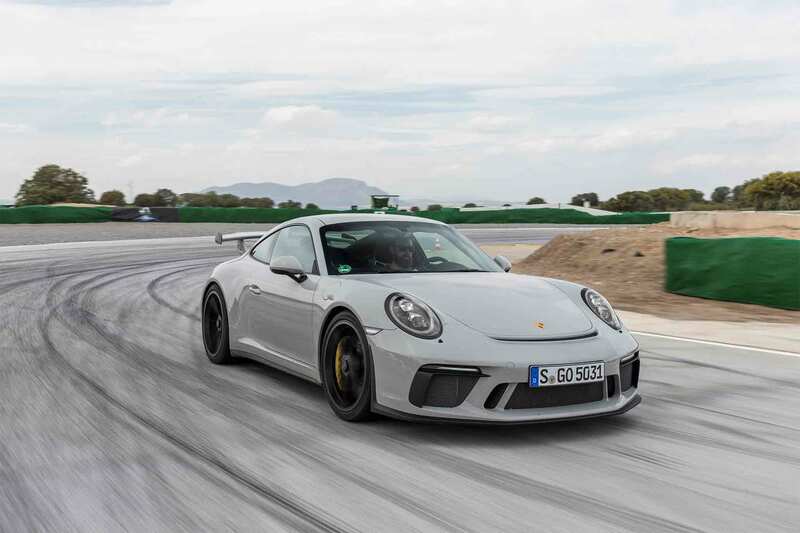 Andreas Preuninger, head of GT cars for Porsche, told AUTOMOBILE the GT3’s factory-installed shims should be the only adjustment the engine needs over its lifetime. 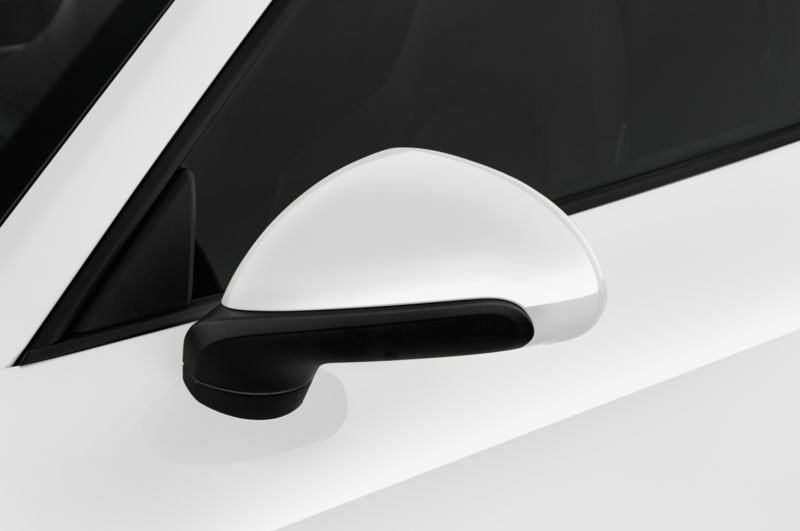 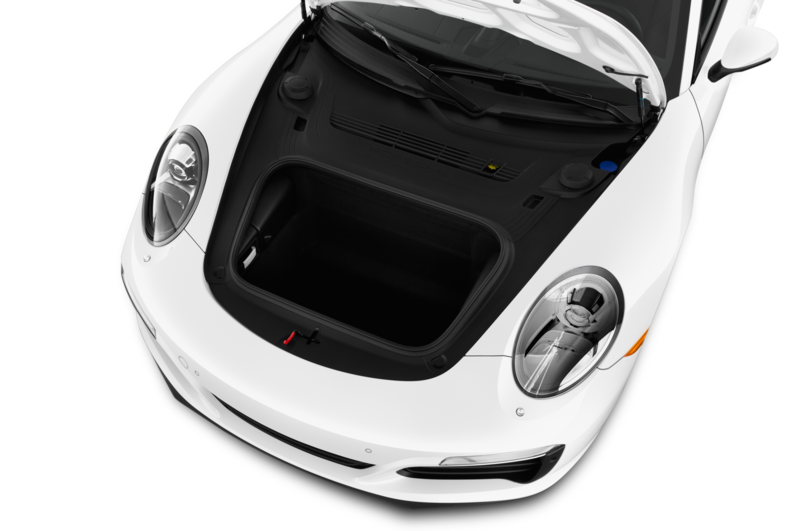 All of this is designed to support extended visits to the redline without any durability issues. 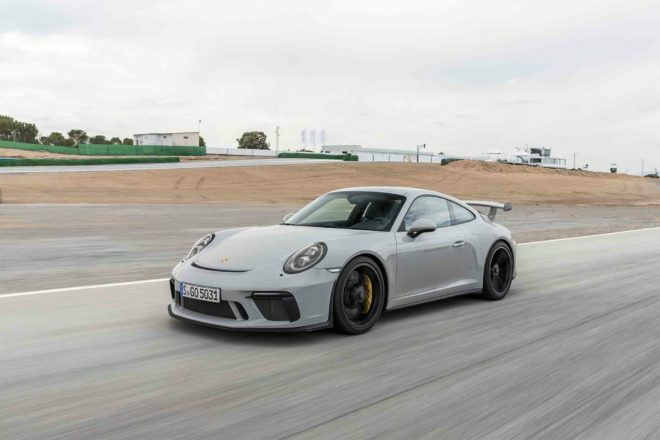 Considering the same basic engine is intended for the factory’s endurance race cars — which spin up to 10,000 rpm for as much as 24 hours at a time — and that it’s built on the same assembly line that builds the race cars, there should be no issues for even the most dedicated of track rats. 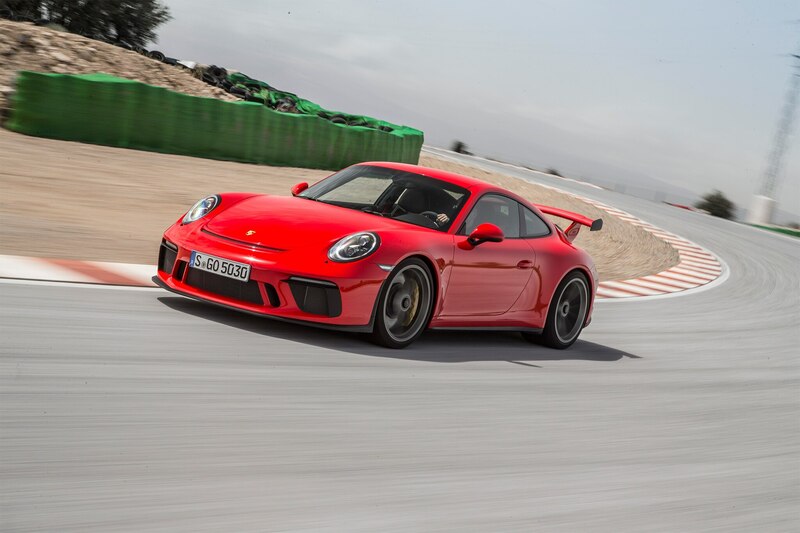 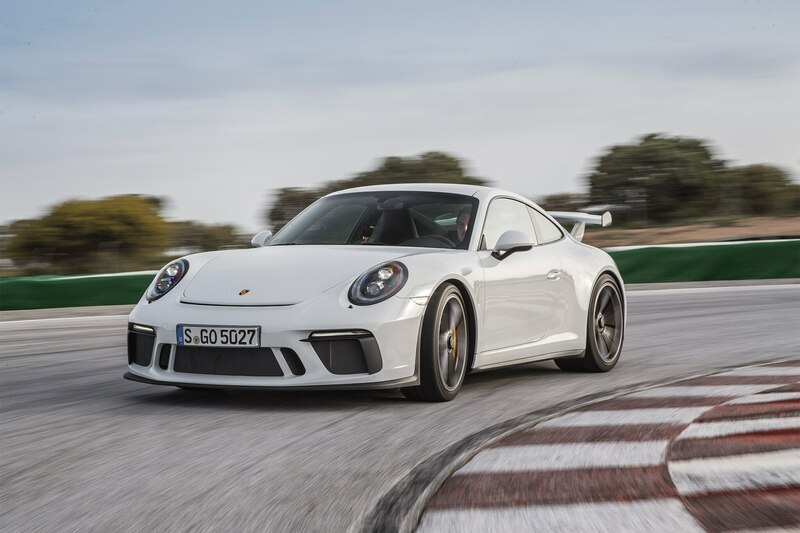 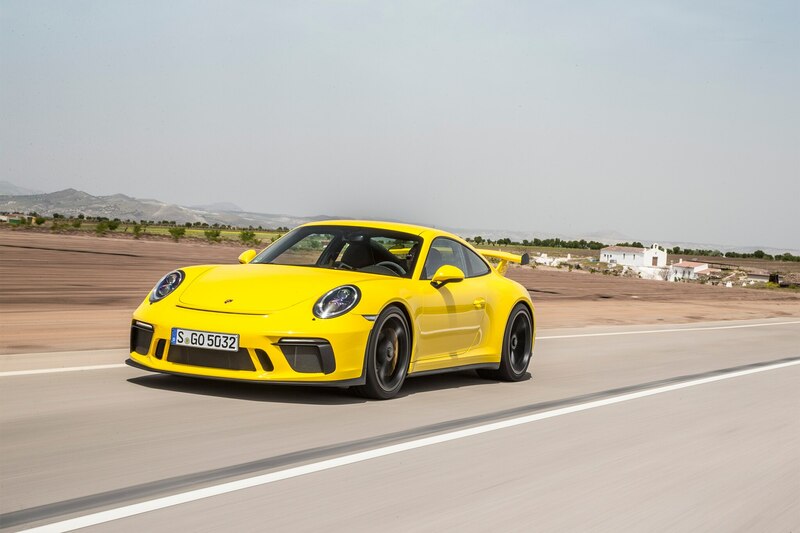 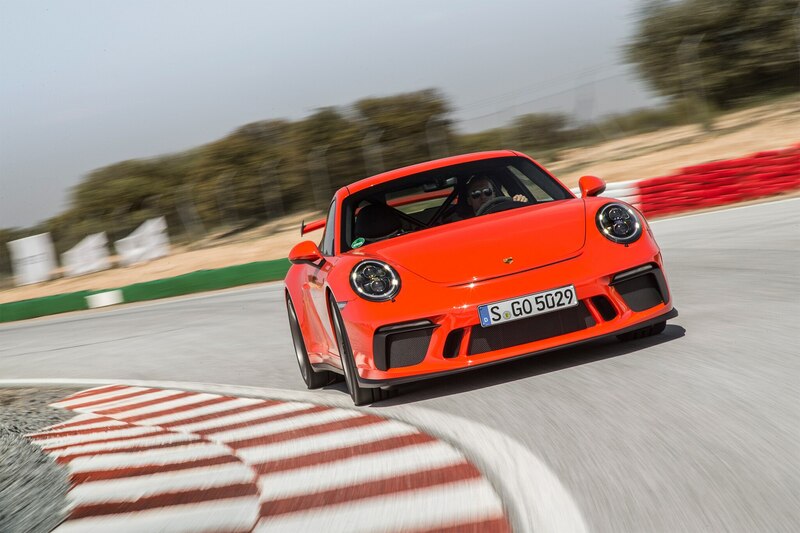 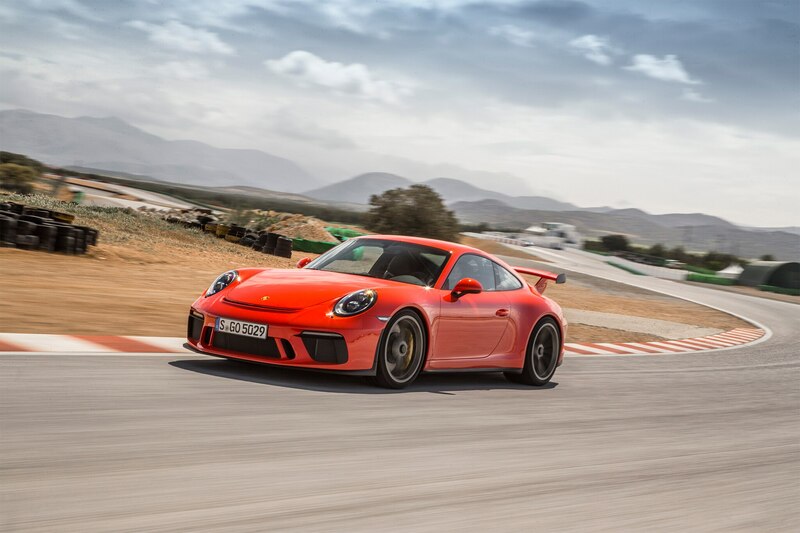 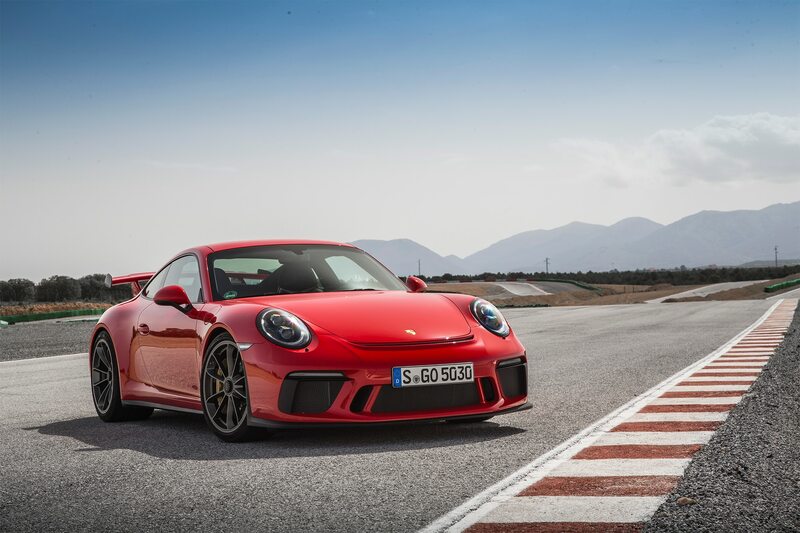 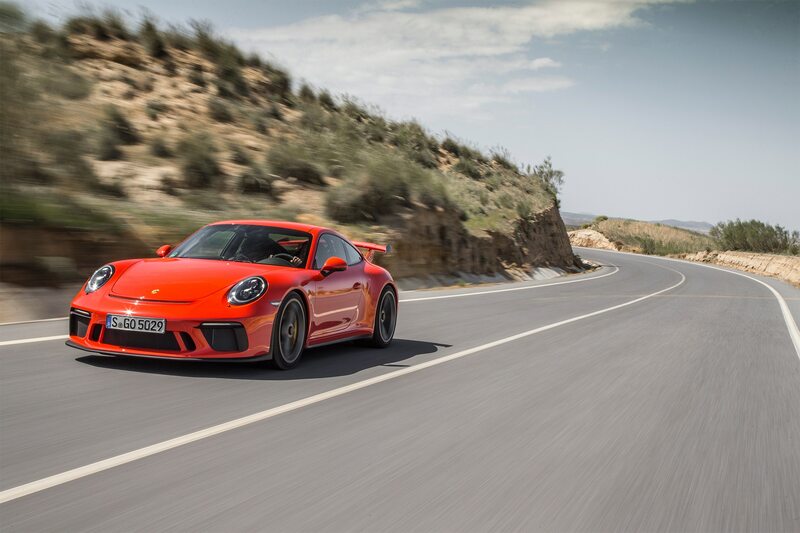 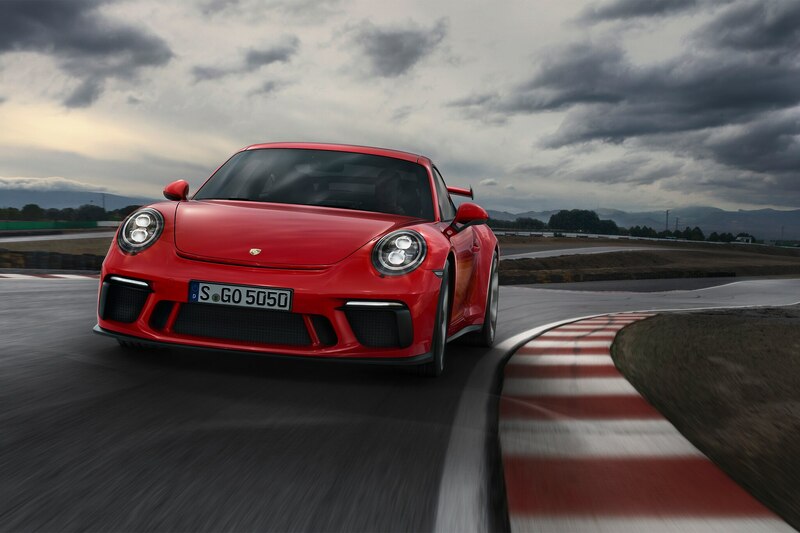 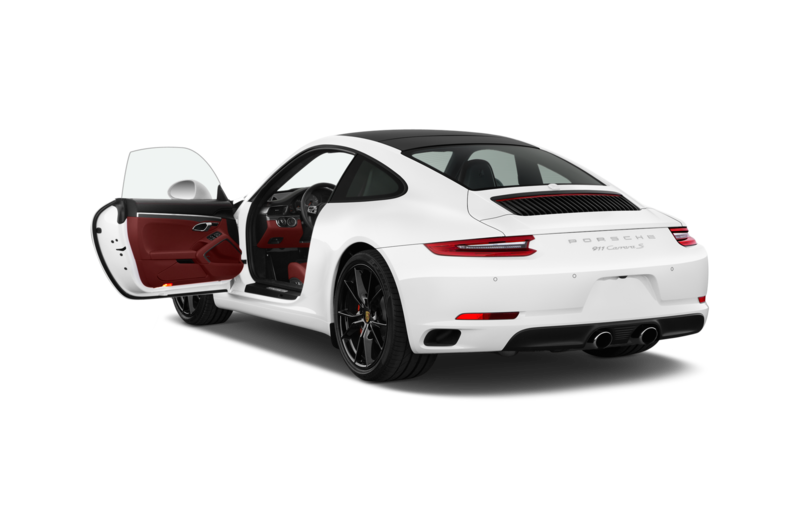 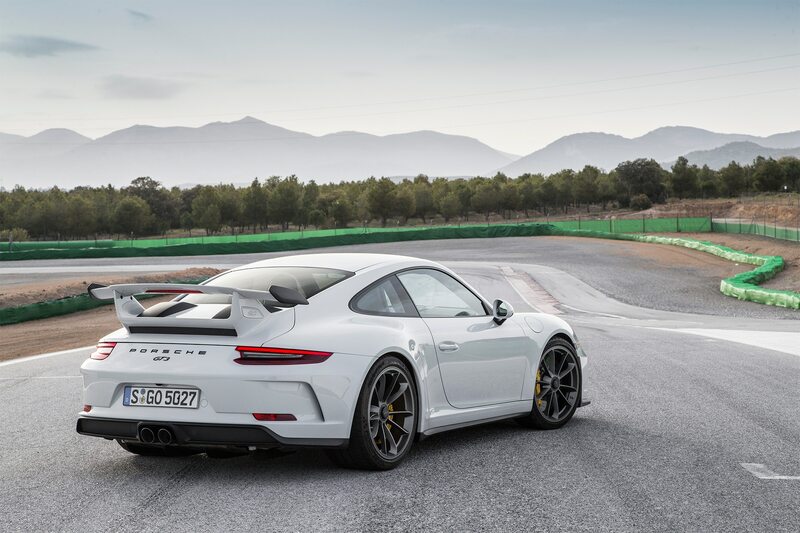 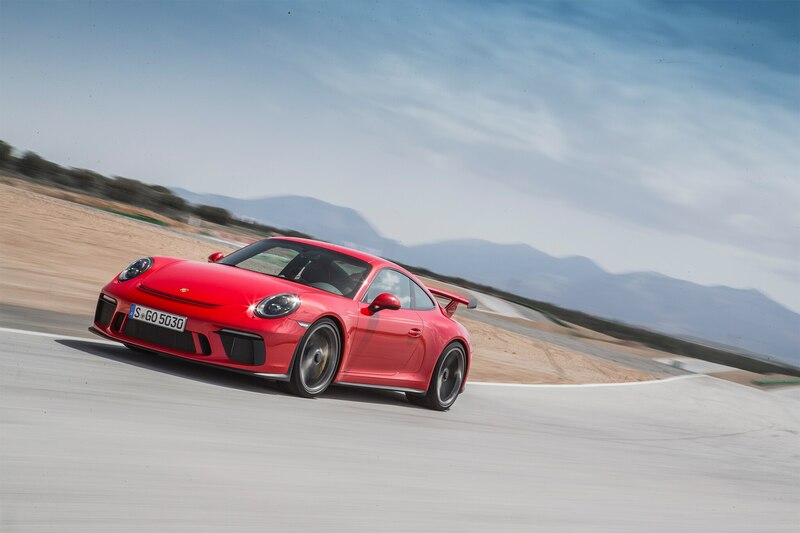 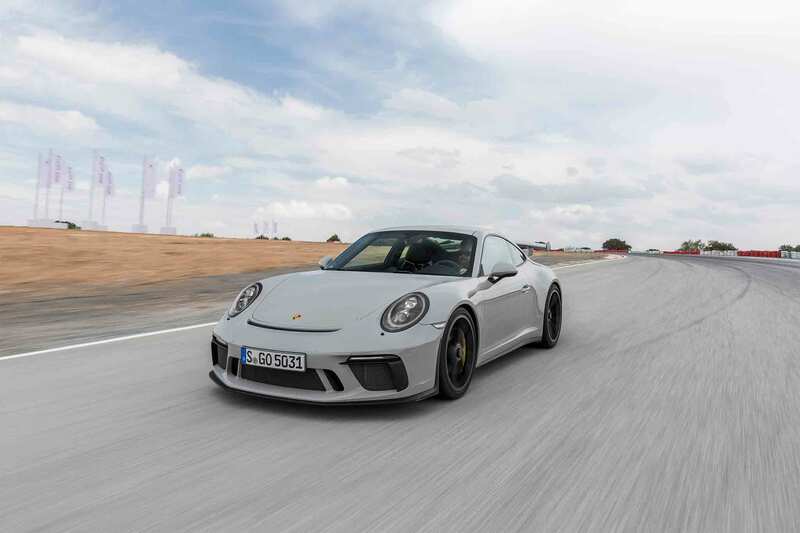 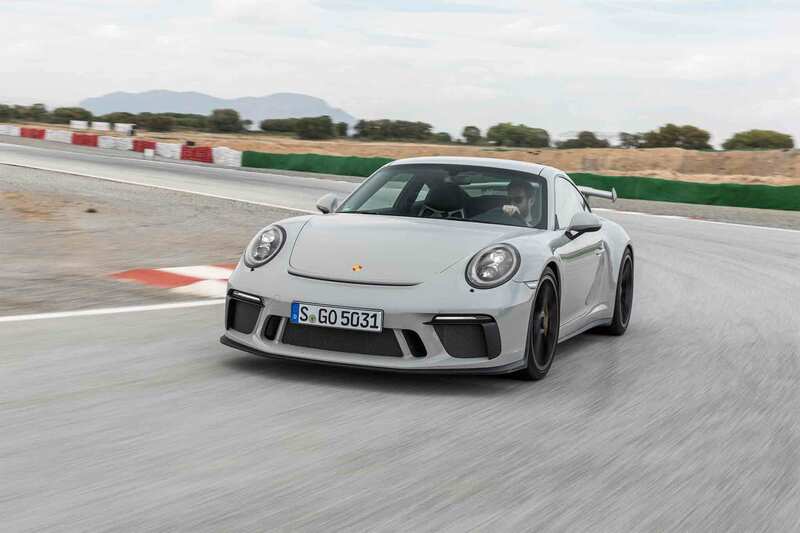 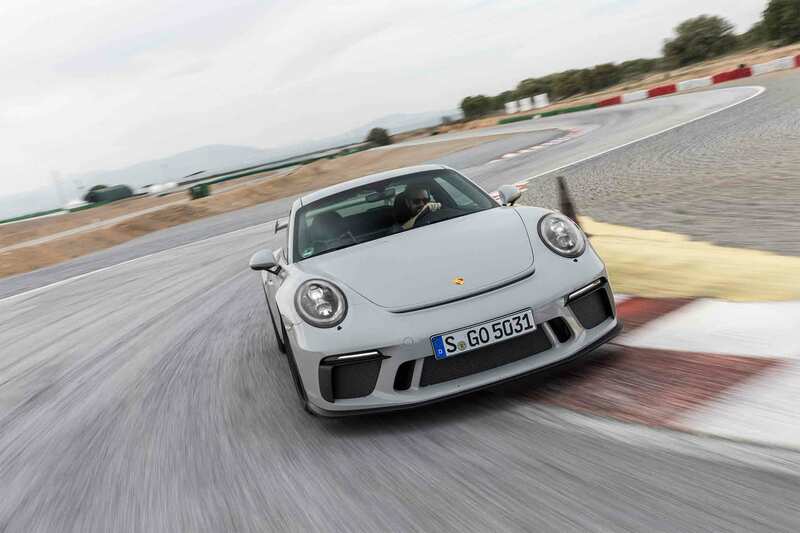 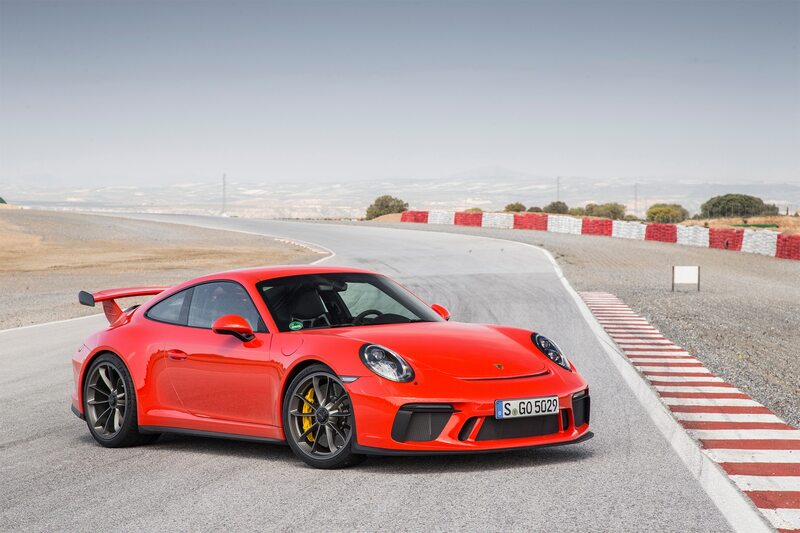 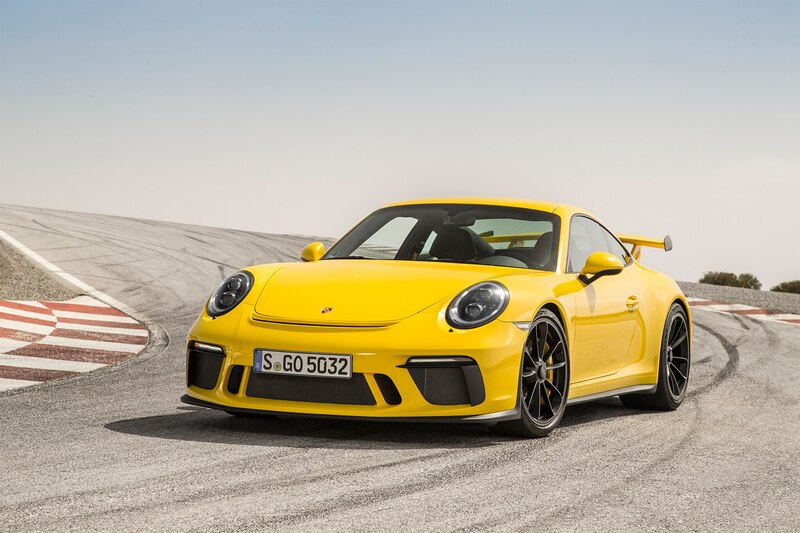 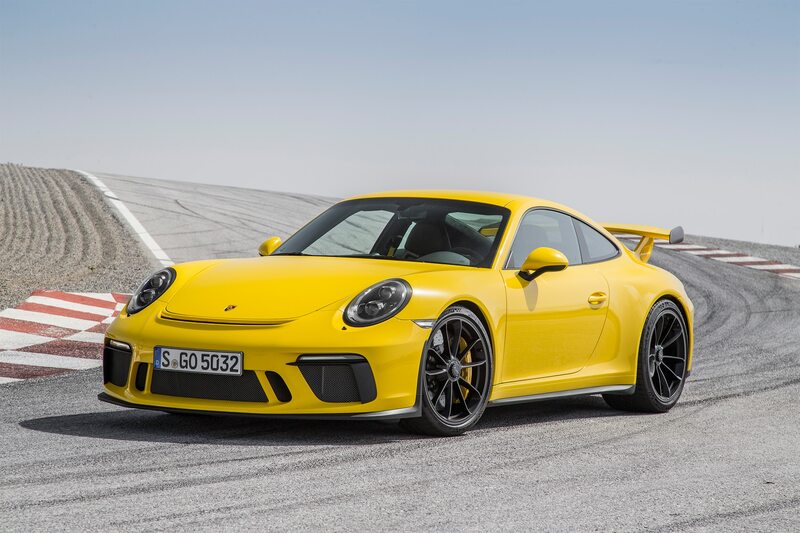 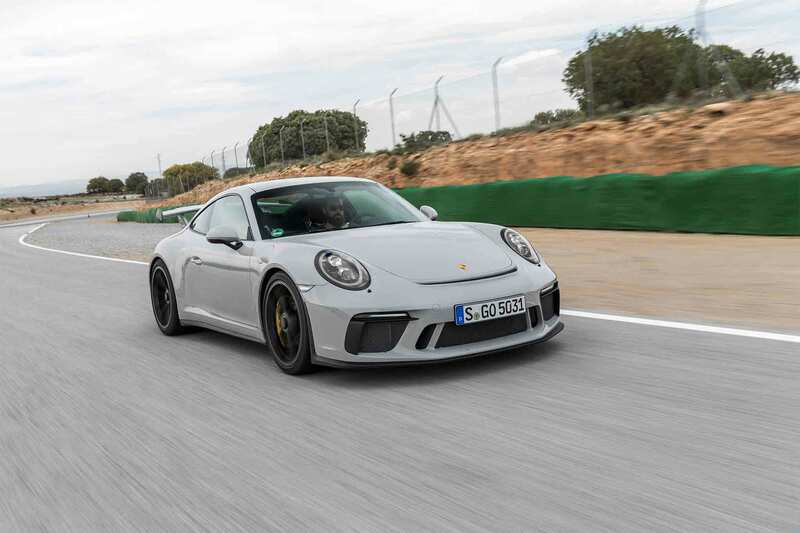 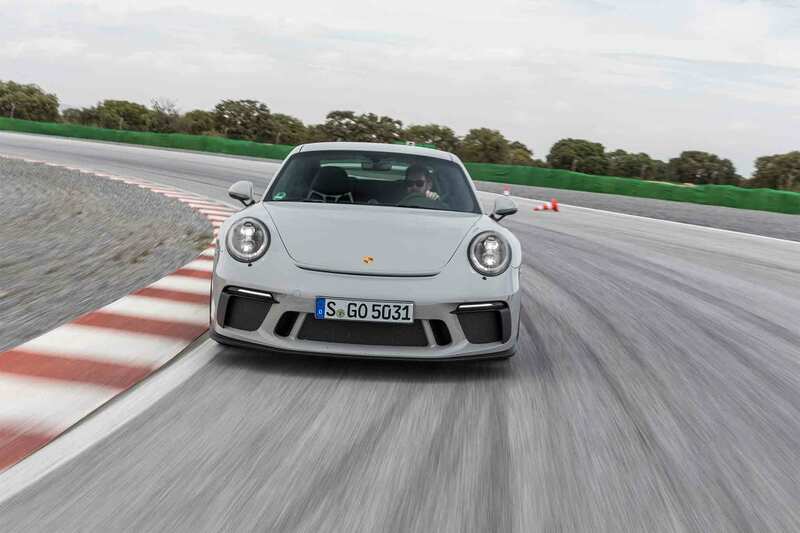 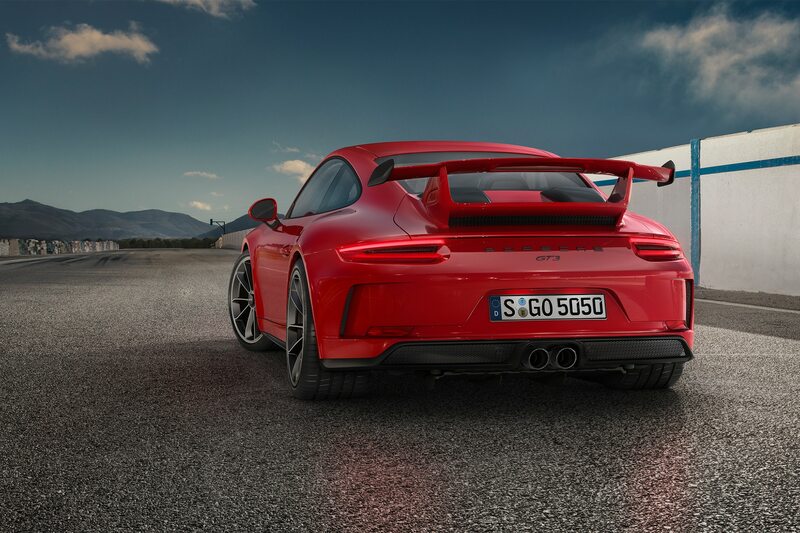 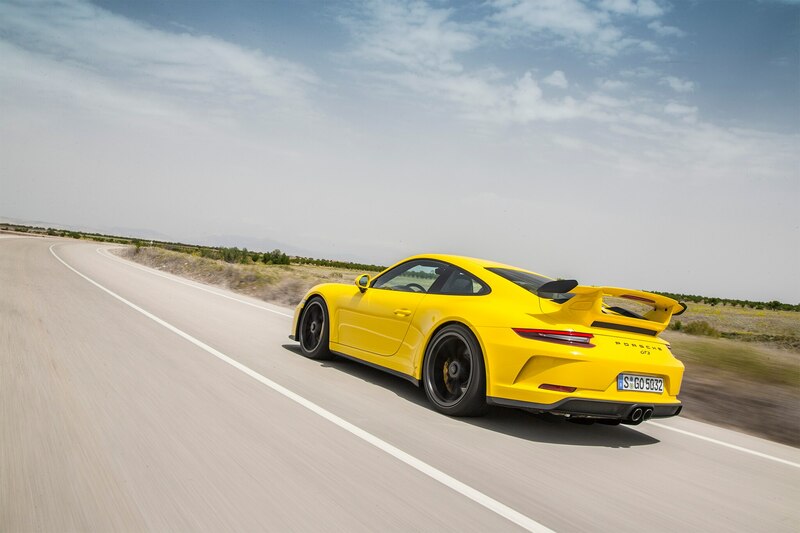 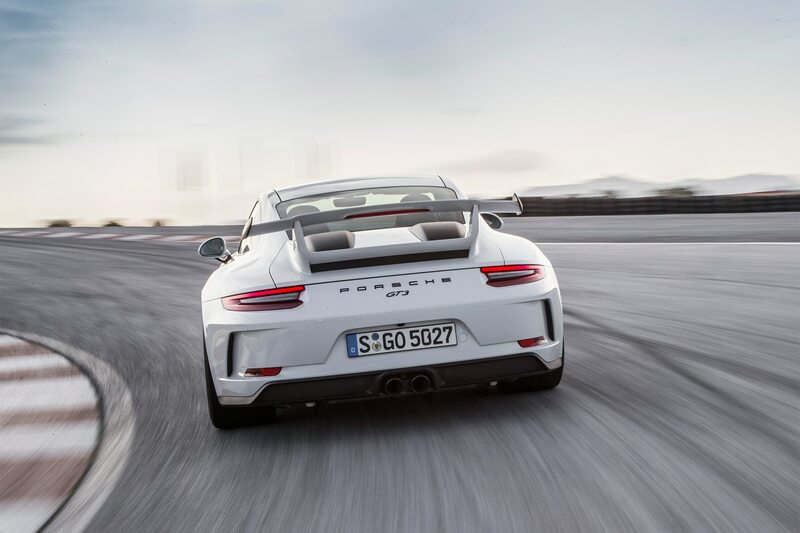 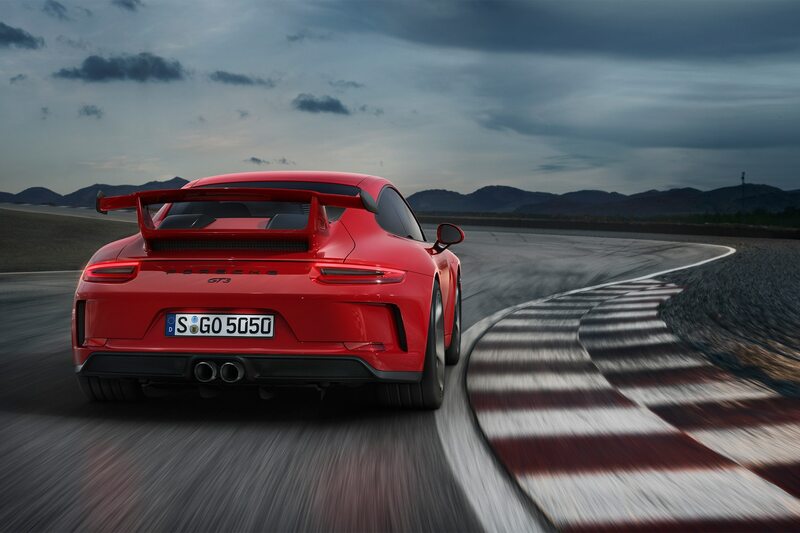 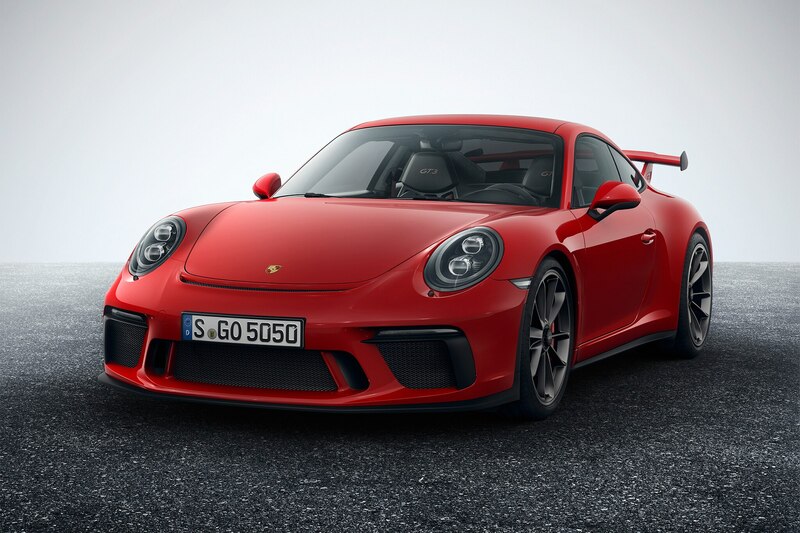 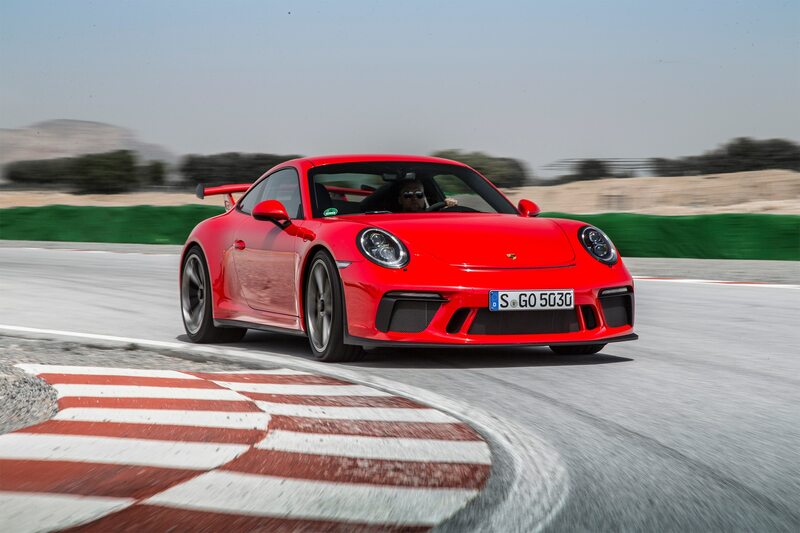 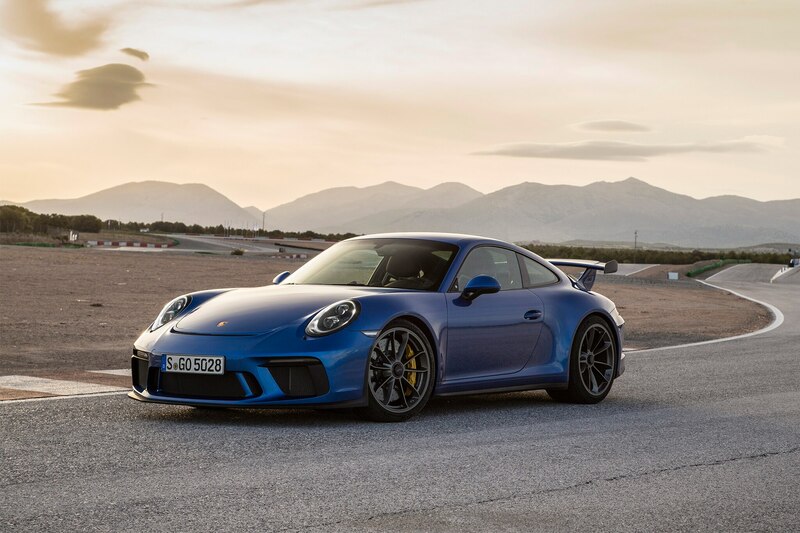 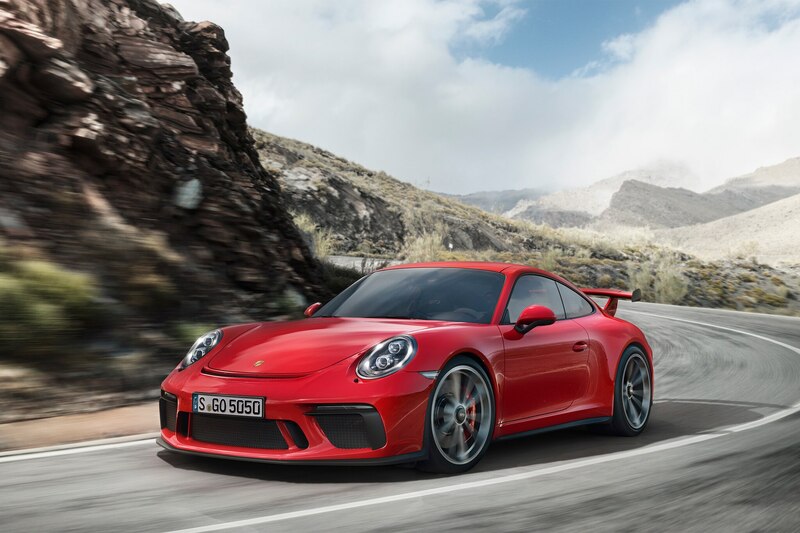 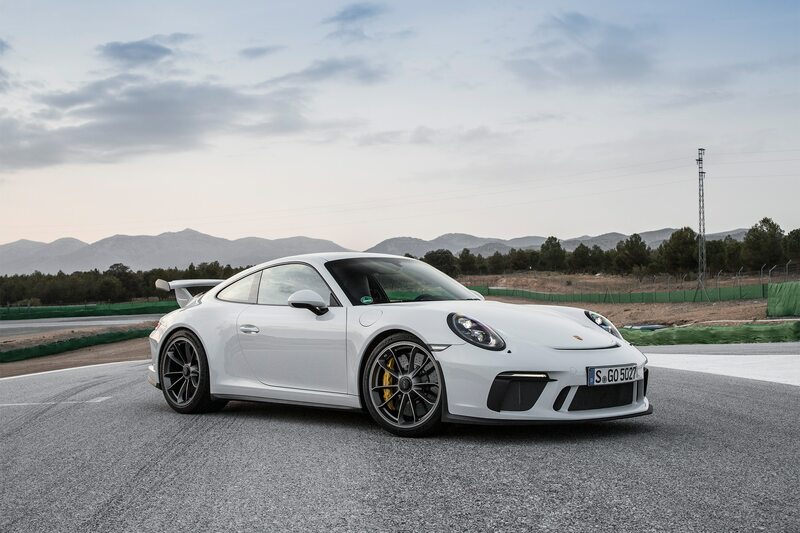 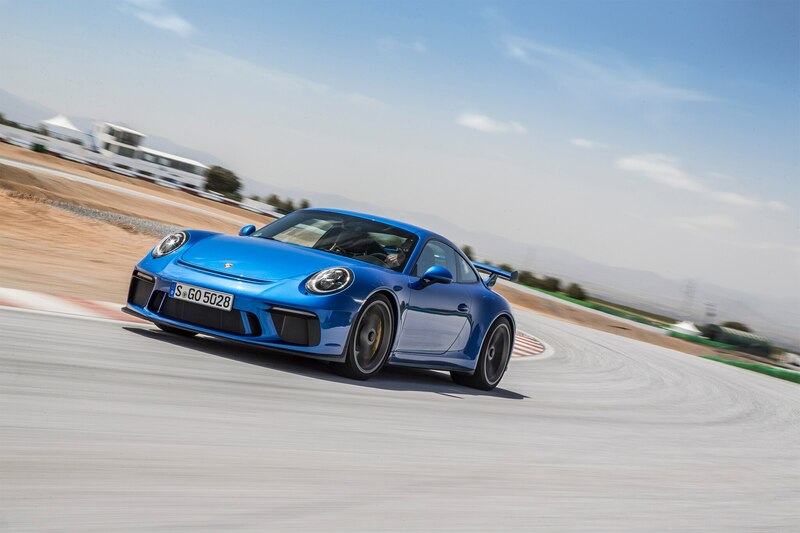 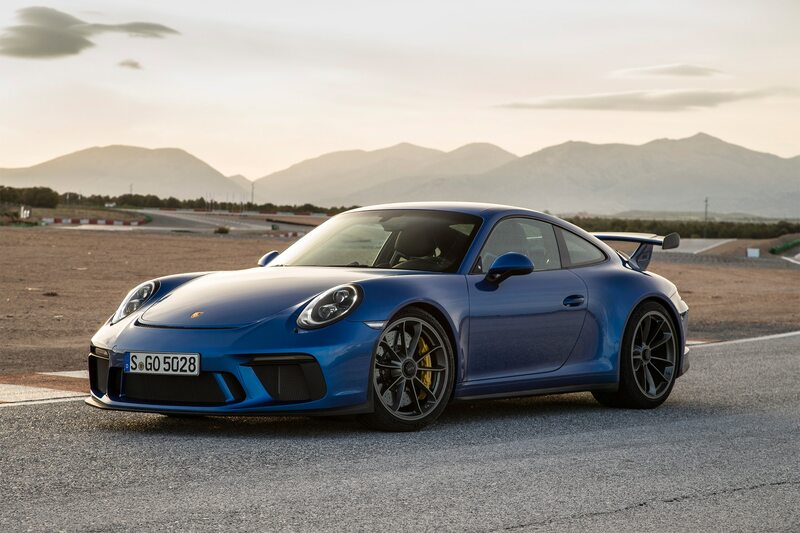 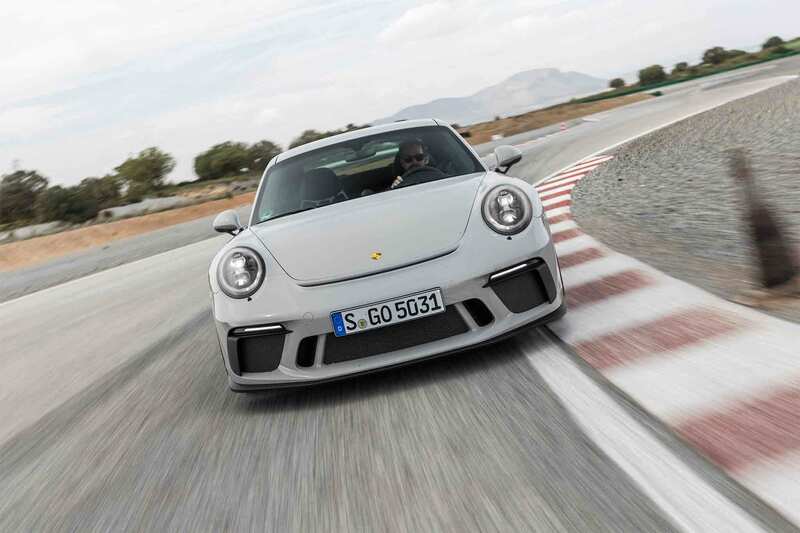 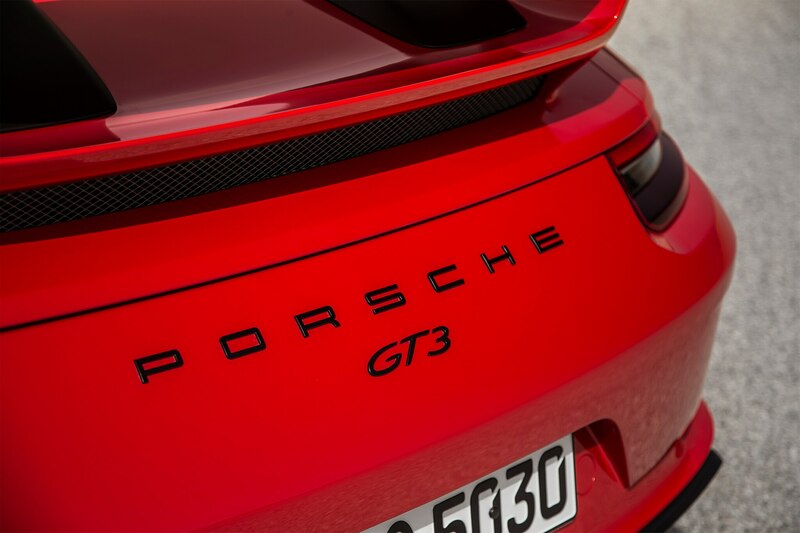 The result is an increase over the previous GT3’s 3.8-liter unit by 25 horsepower to an even 500 hp at 8,250 rpm, and 339 lb-ft of torque at 6,000 rpm. 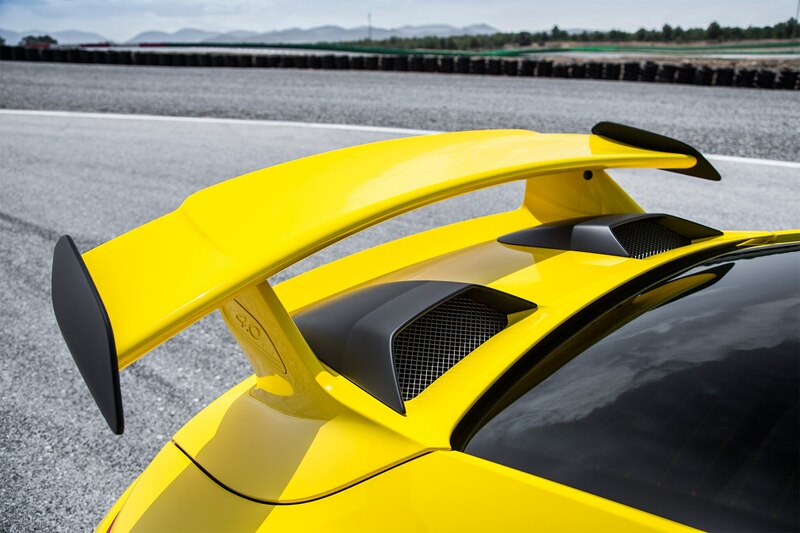 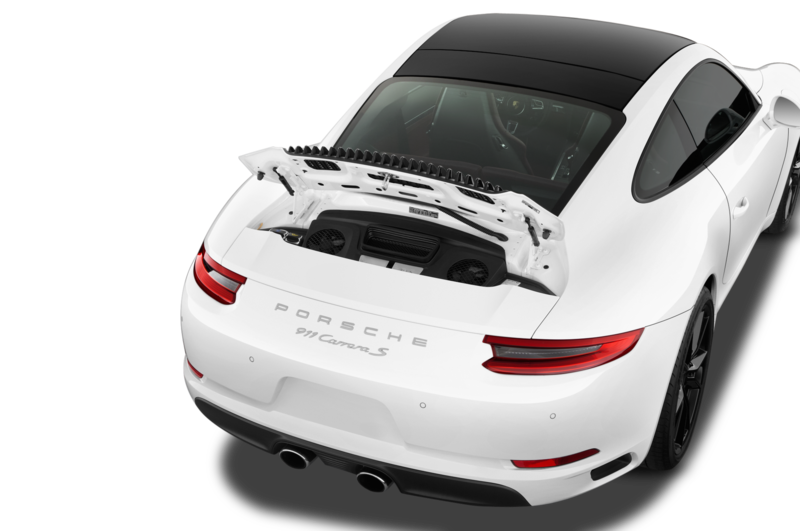 Paired with the upgraded engine is a reworked aerodynamic package that generates more downforce without much added drag. 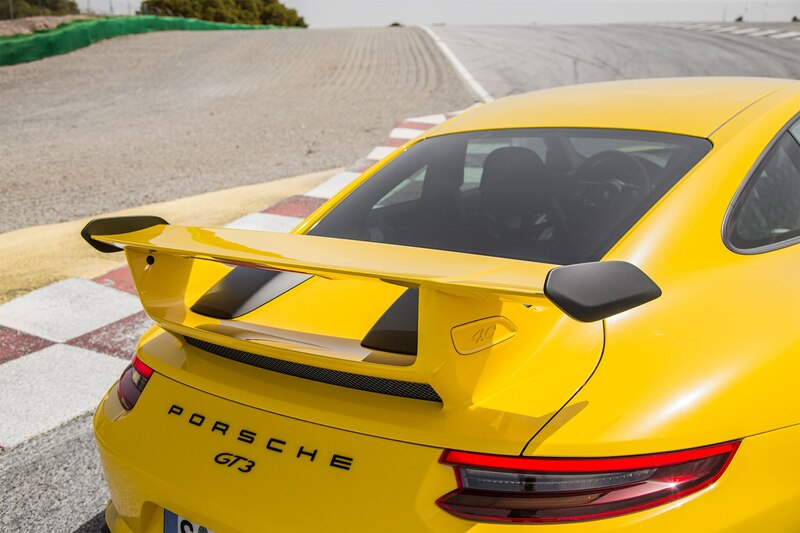 To achieve this result, Porsche raised the rear wing 20 mm (0.78 inch) to get better airflow and more downforce. 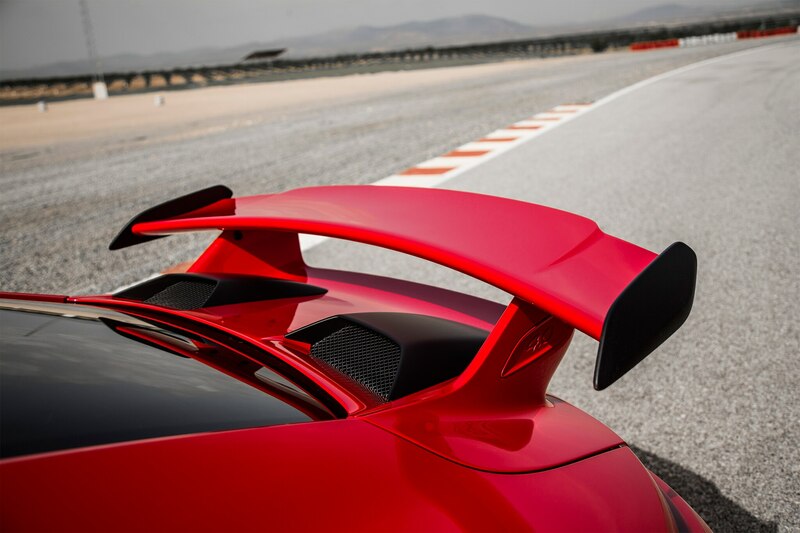 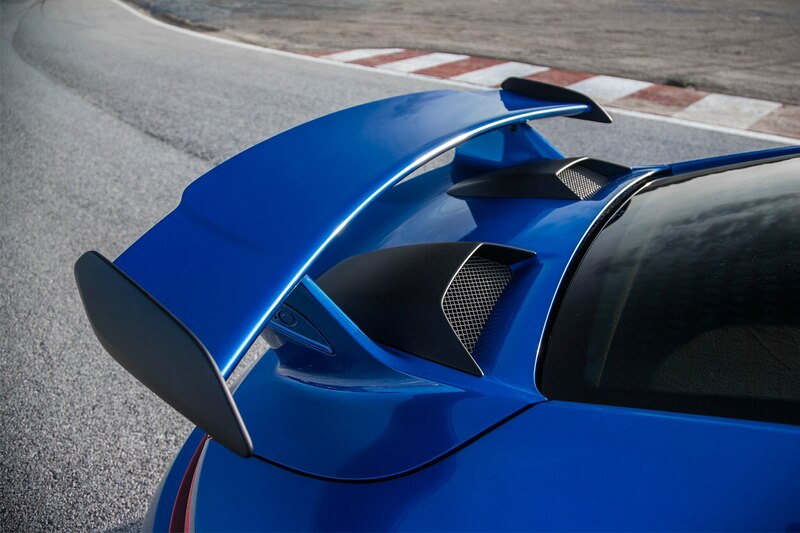 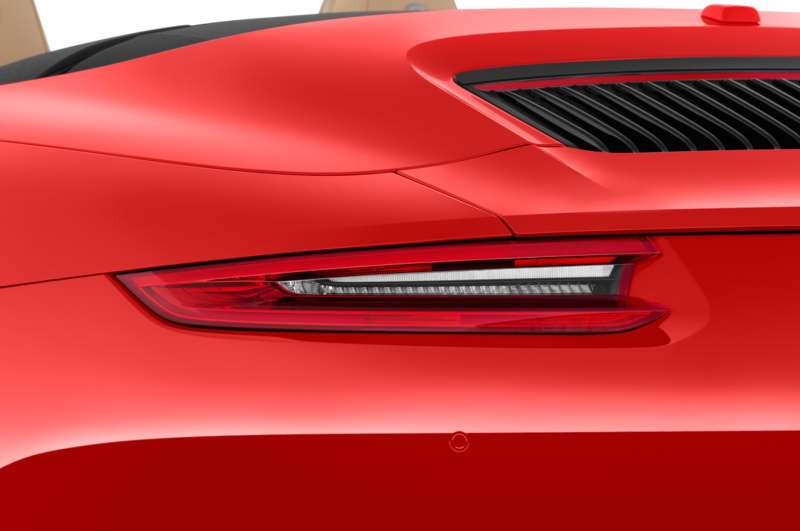 The GT team also worked over the car’s underbody, increasing downforce another 20 percent compared to the outgoing model, without any added drag. 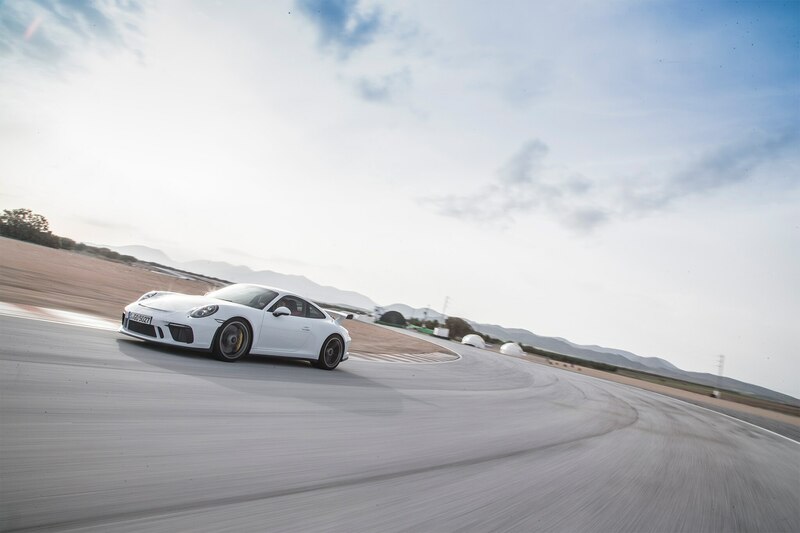 The result of this extra high-speed grip is stability, and that stability translates into confidence, letting you keep the throttle flat through high-speed kinks. 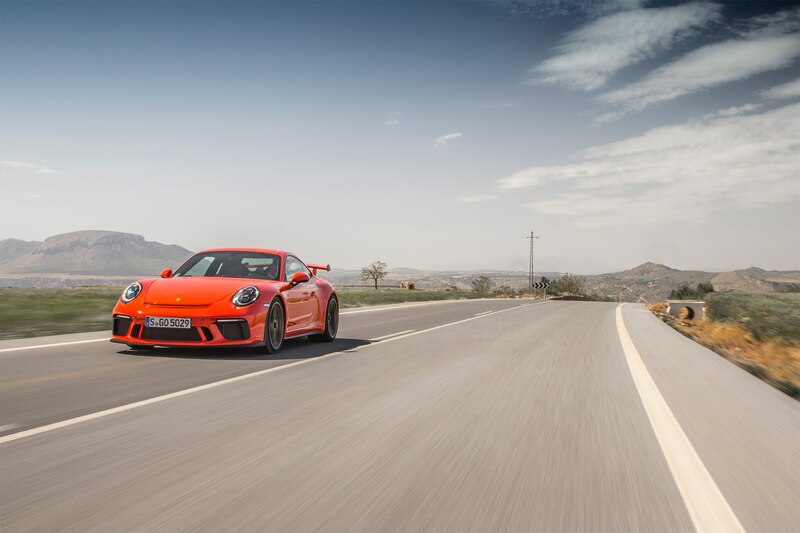 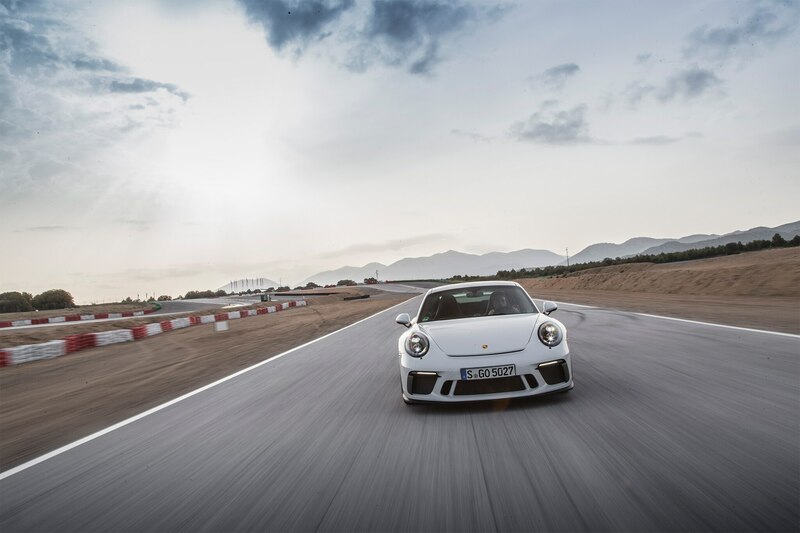 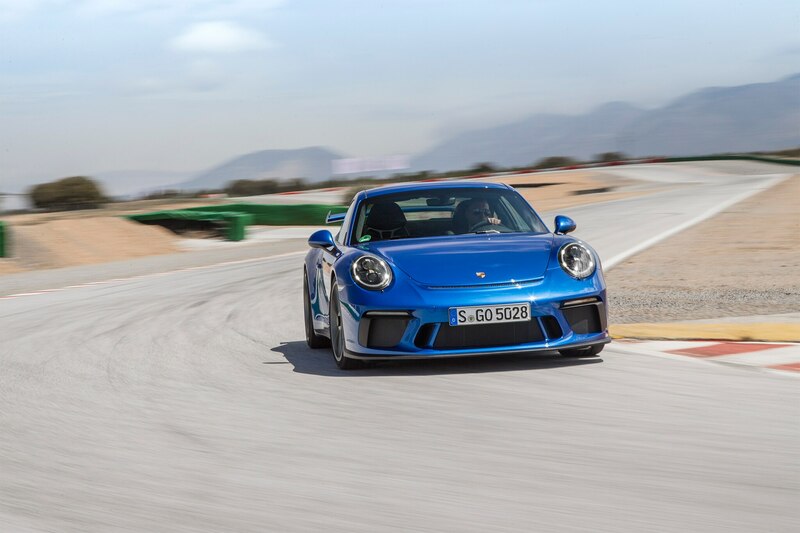 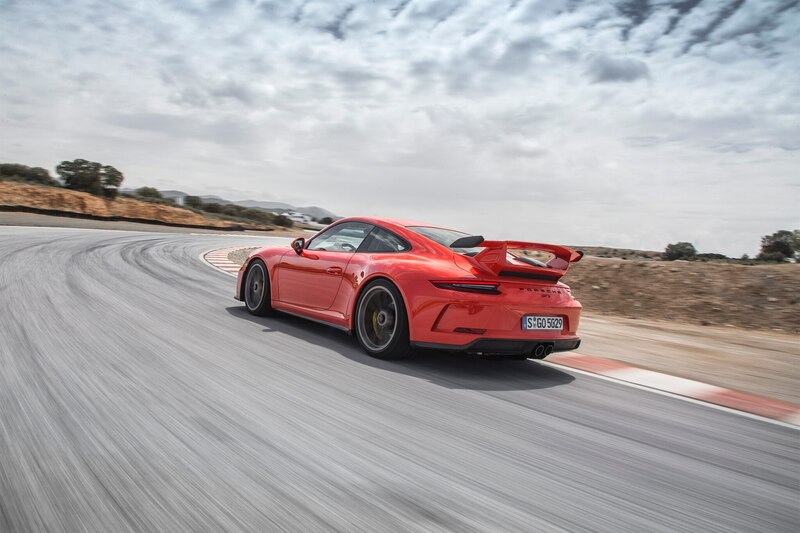 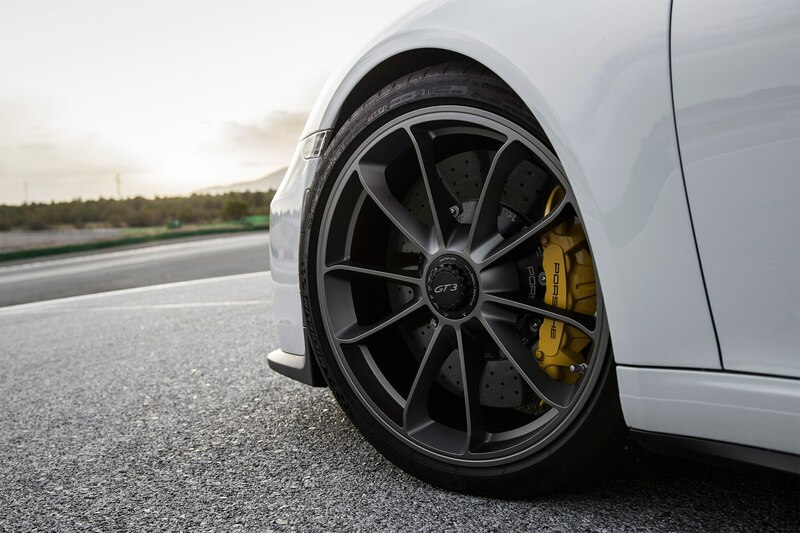 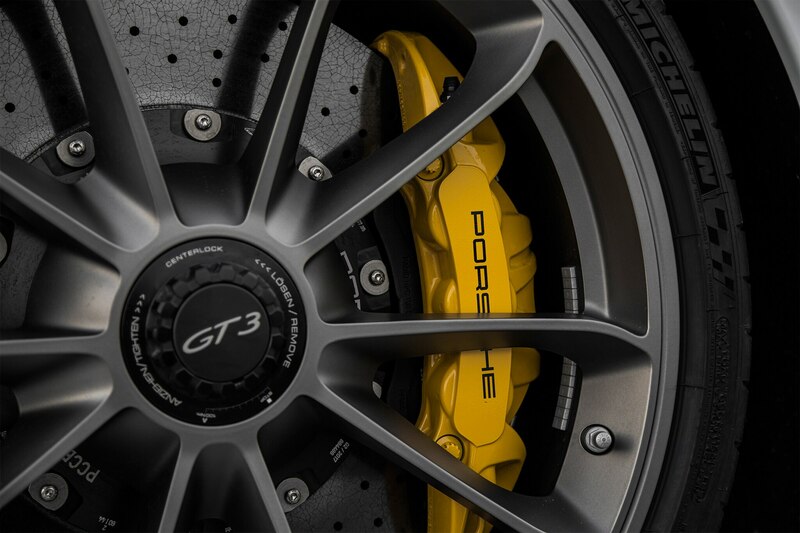 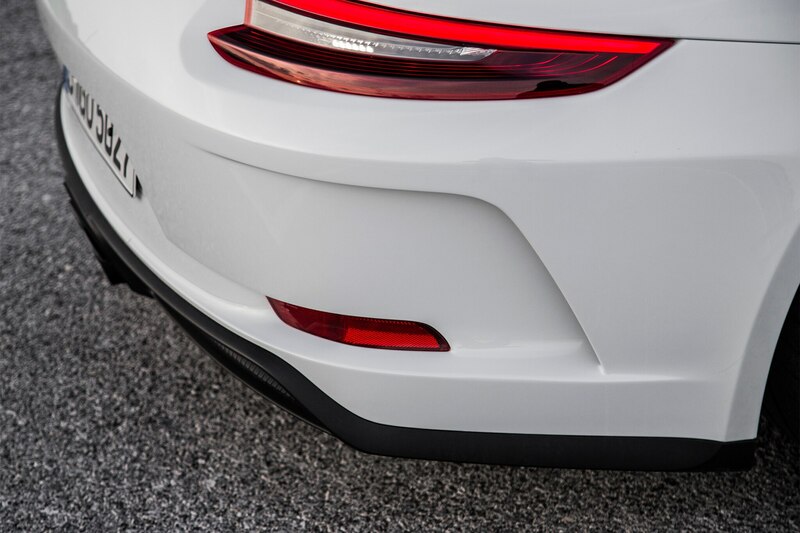 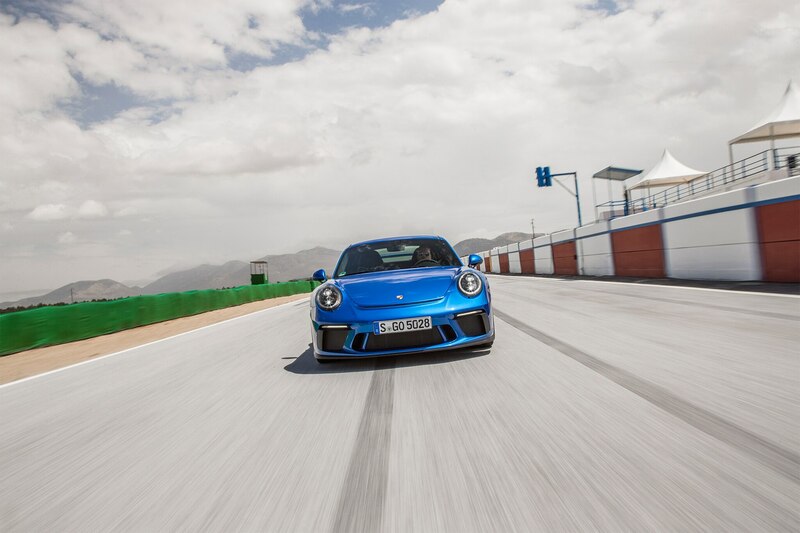 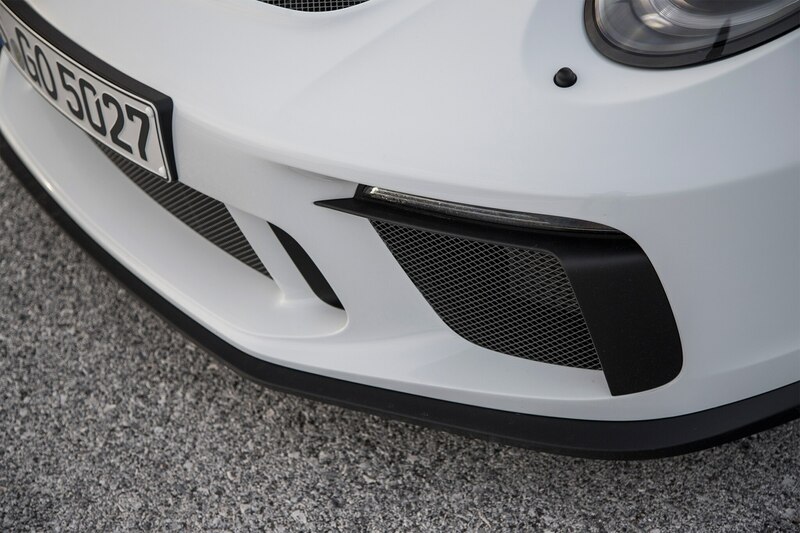 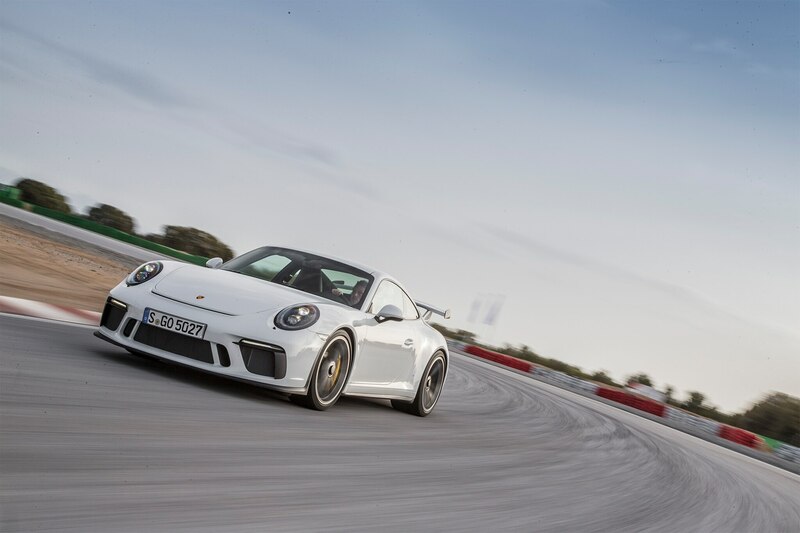 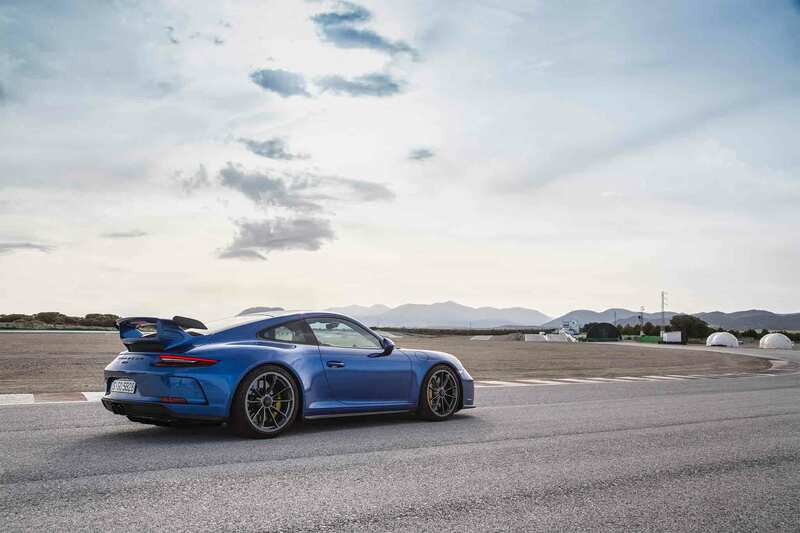 Whether on the track or the street, the GT3’s suspension is tuned for a near-perfect blend of body control and compliance, ensuring grip without sacrificing comfort. 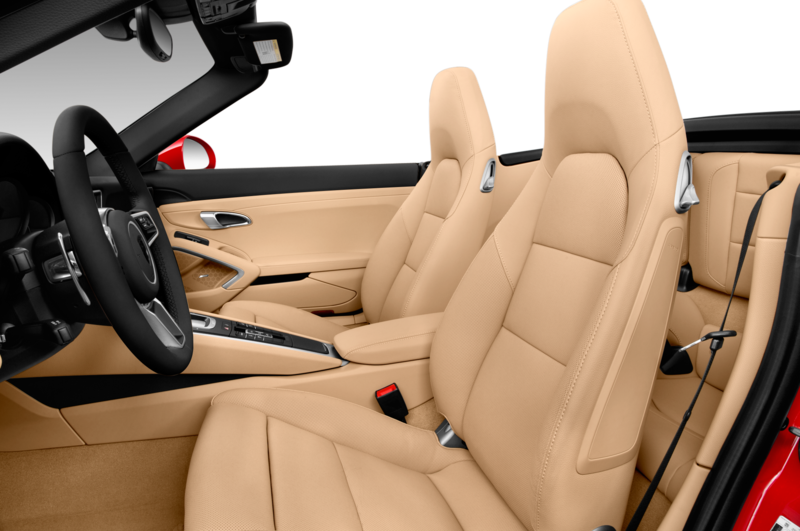 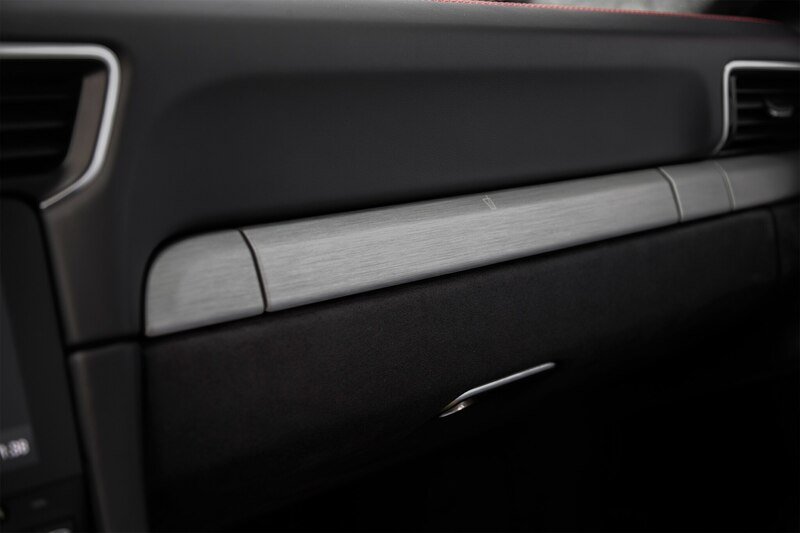 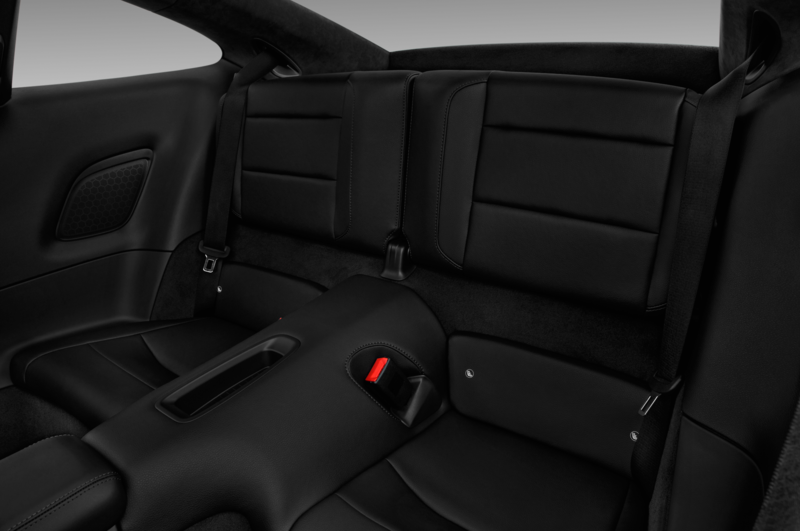 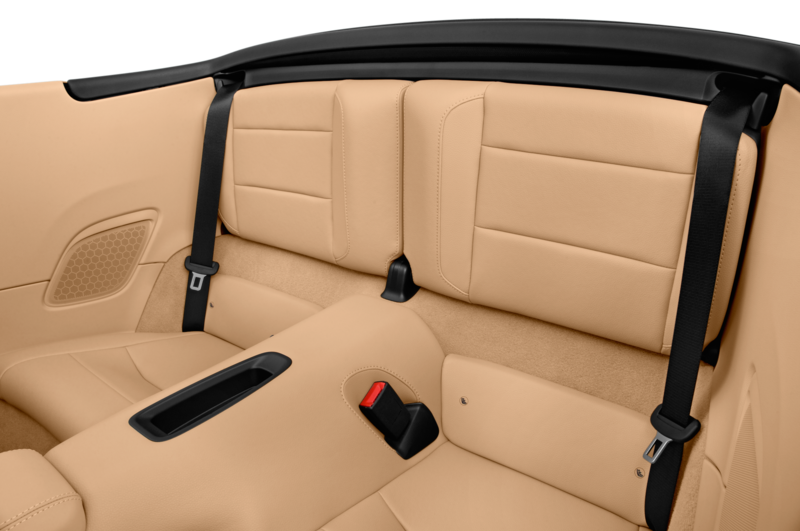 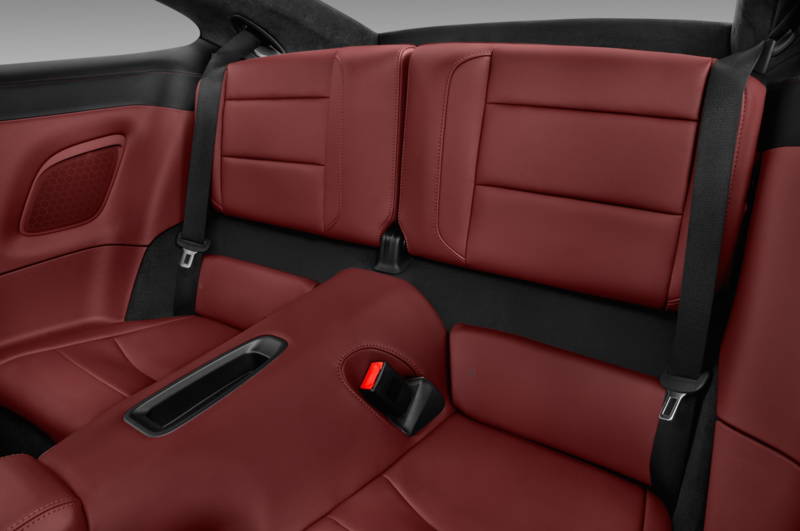 The same goes for the slightly stripped-down interior. 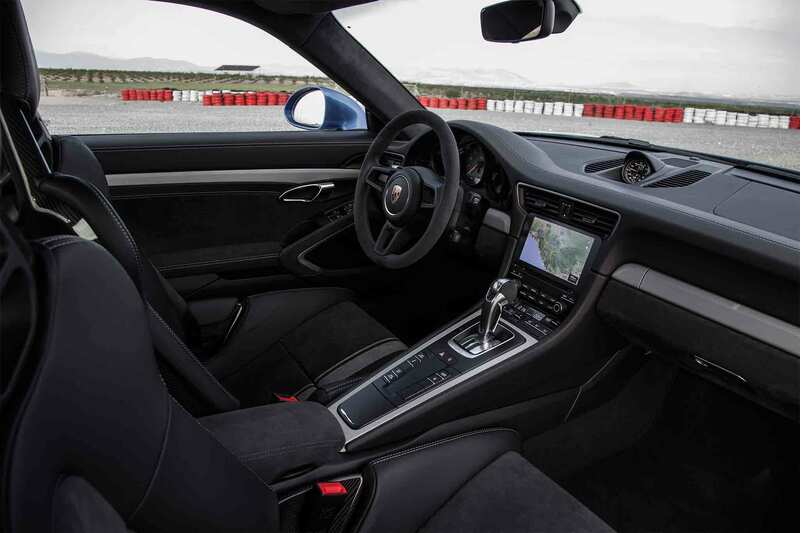 There are no back seats, just carpeted seat-shaped lumps, and the front seats are bolstered heavily but are comfortable even for extended stints on the road. 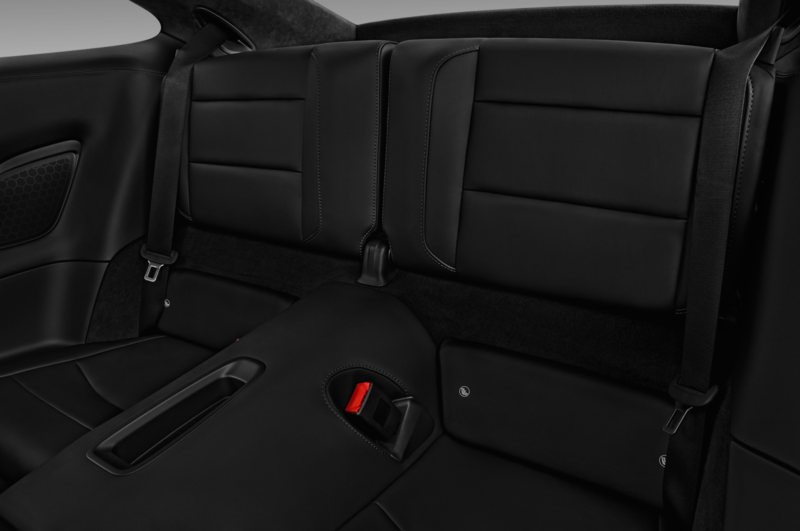 Both manual-adjust full buckets ($5,200 option) and adaptive 18-way electric adjust seats ($2,640) are available. 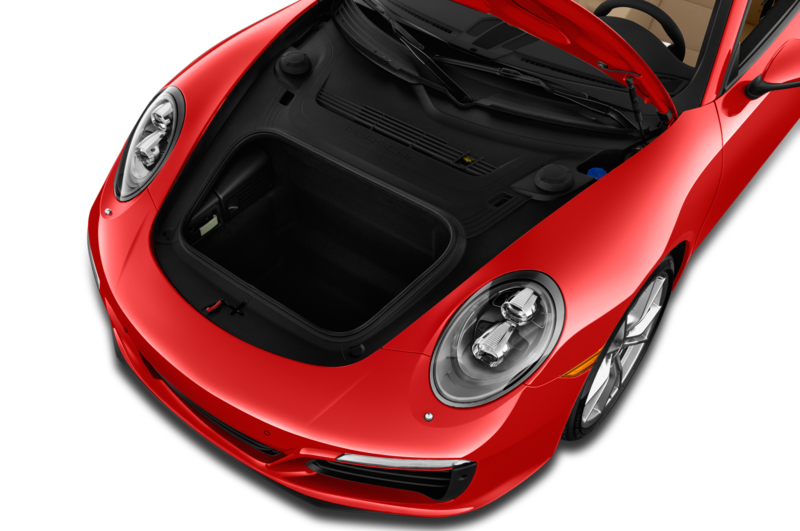 American buyers won’t be able to get the rear-seat half roll-cage that comes with the Club Sport package in Europe, but that rear half-cage won’t do much in the event of a crash anyway, and it cuts into precious cargo space, so no big loss. 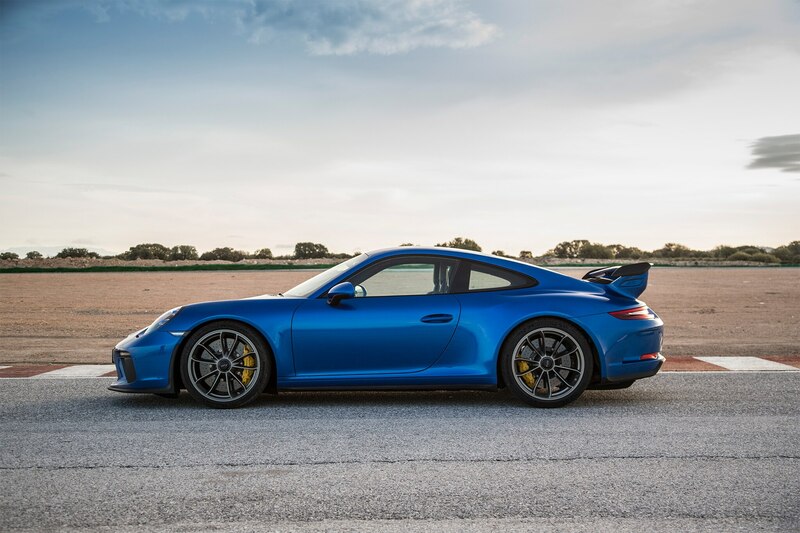 A range of special colors are also available, including the Chalk (gray) car I tested, as well as Miami Blue, Carmine Red, and Lava Orange, each for a price of $4,220. 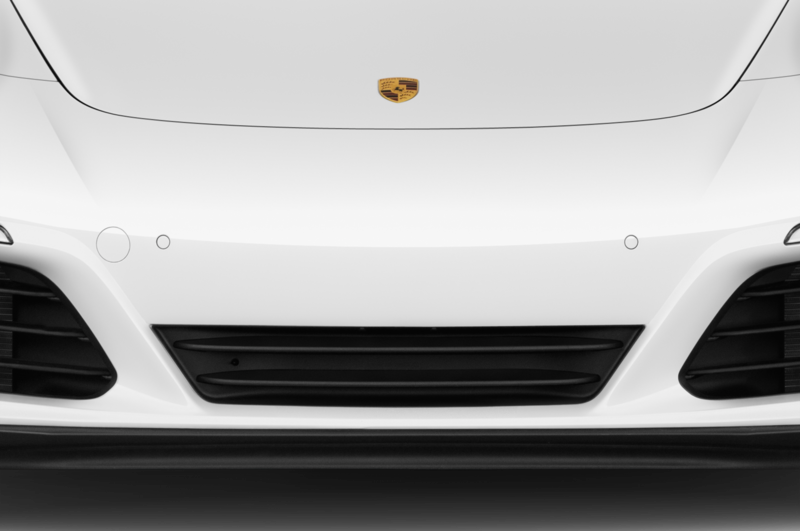 For those who need greater ground clearance around town, a front-end lift system runs $2,590. 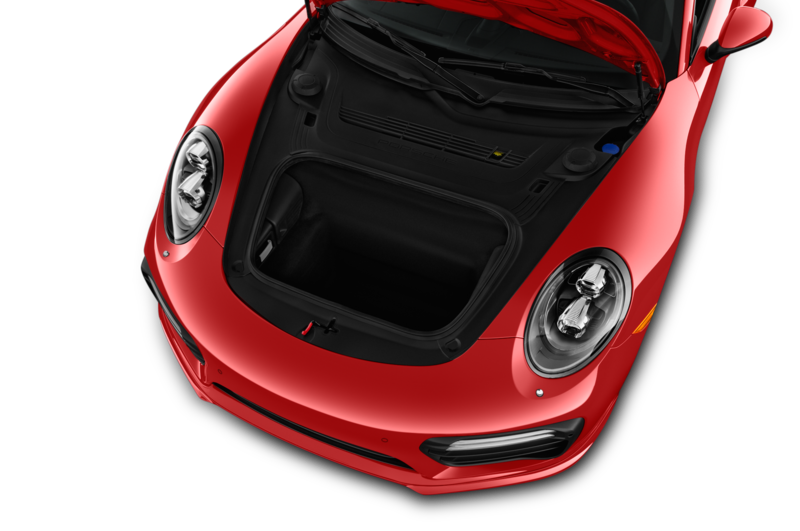 Road-trippers will want the 23.7-gallon extended range fuel tank upgrade (from the standard 16.9-gallon tank), which costs just $140. 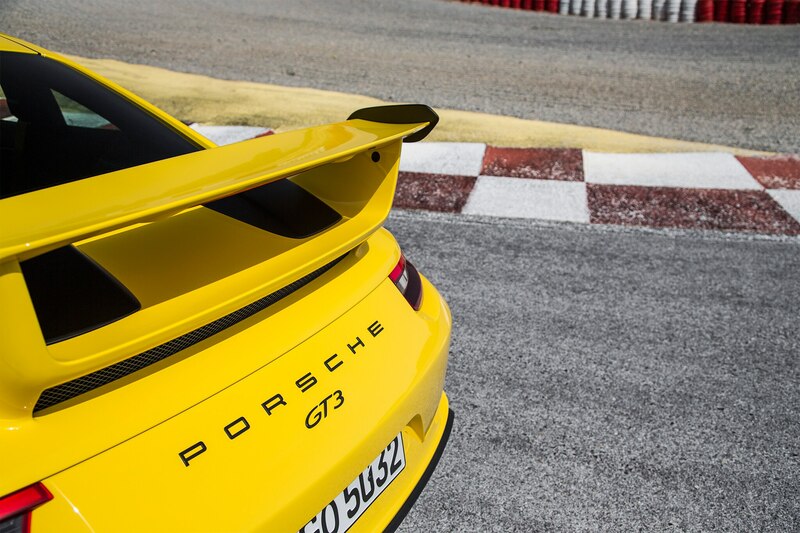 Orders for the new GT3 are open now, with the first U.S. cars to be delivered this fall. 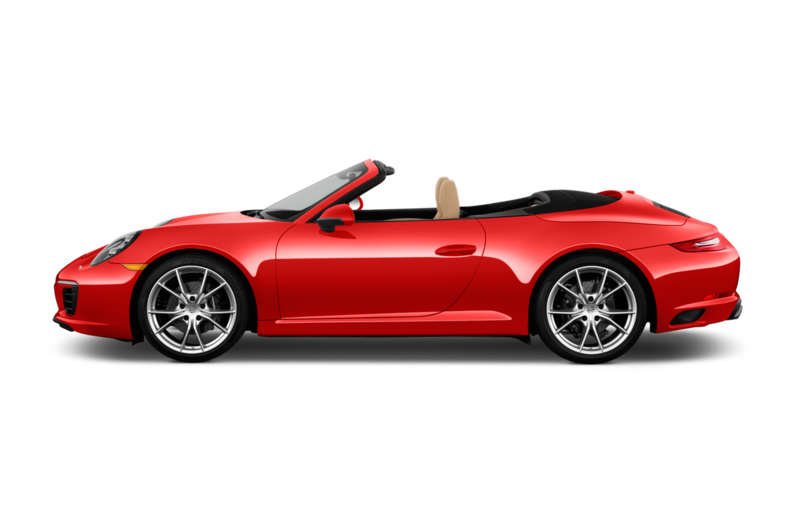 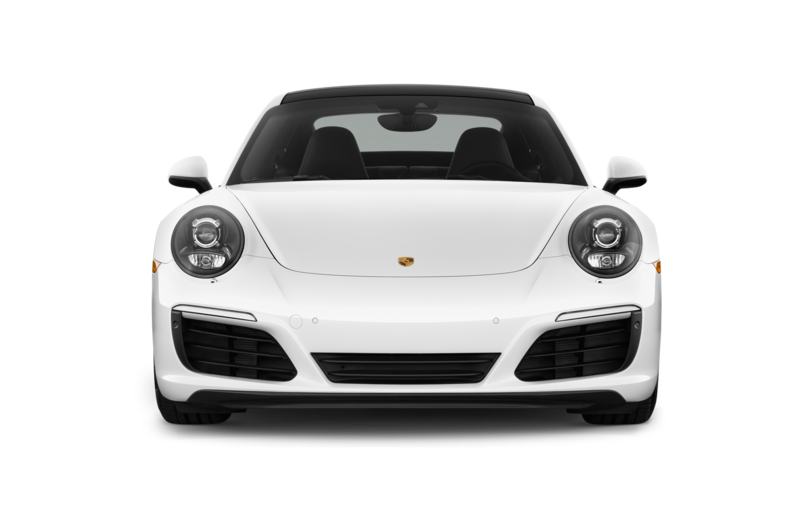 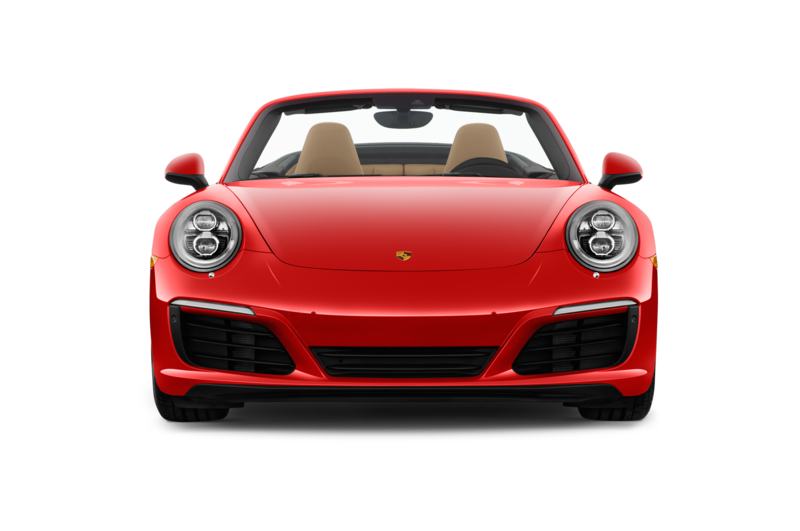 Added to the base price (including $1,050 destination charge) of $144,650, ticking the options boxes can quickly push you toward $170,000 and beyond. 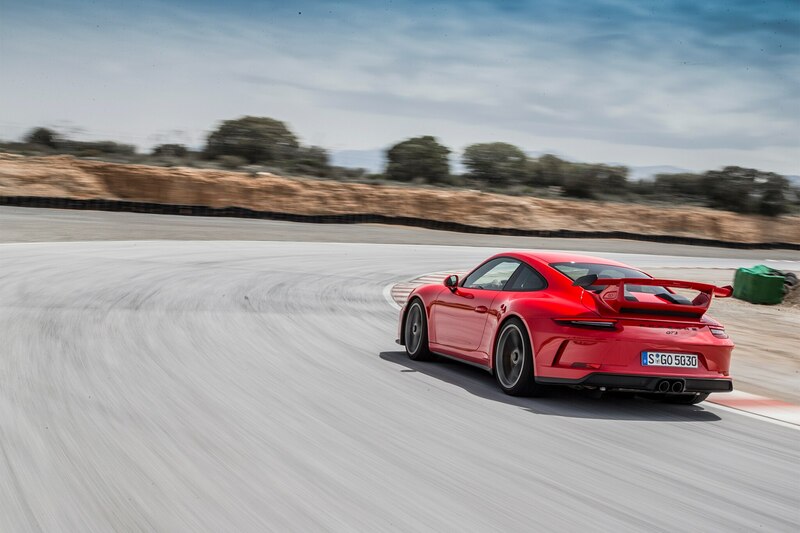 But given the experience of driving the 991.2 GT3, it’s easily worth it if you’ve got the scratch. 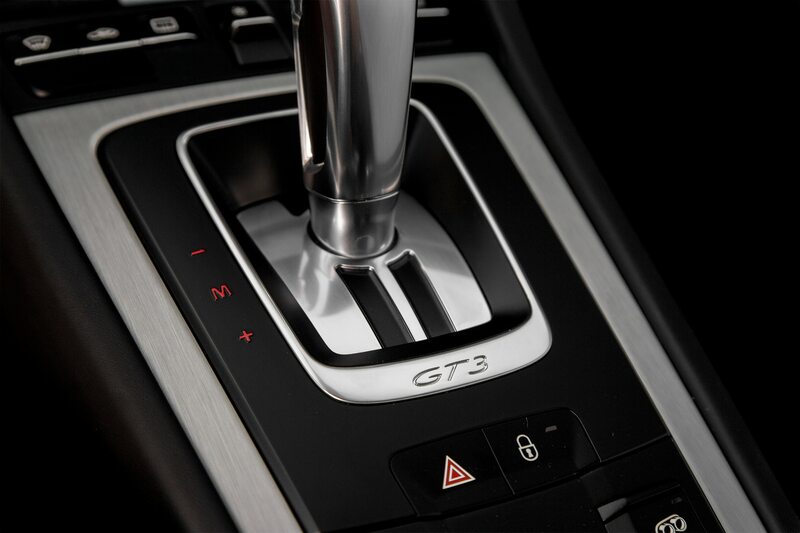 Oh, and that manual transmission? 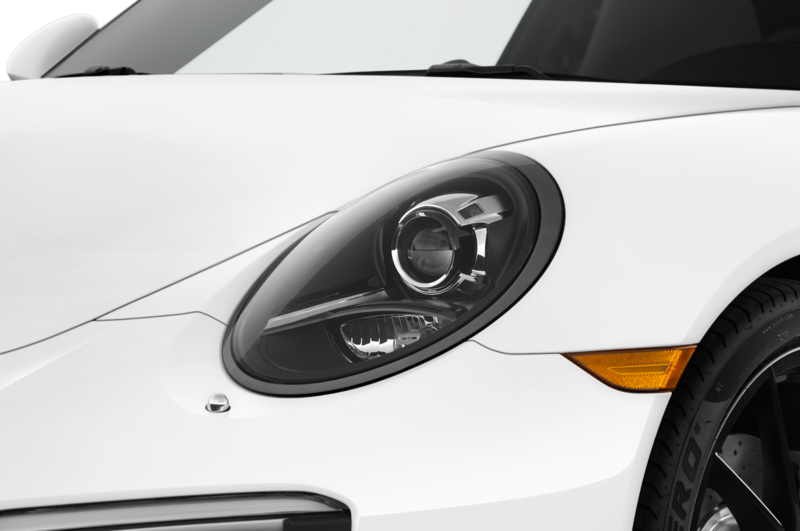 It’s a zero-dollar option, just as it should be. 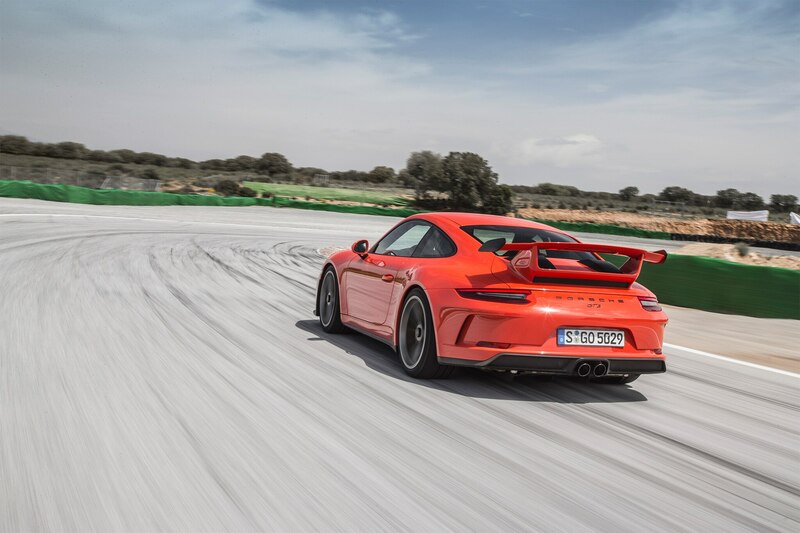 Regardless of price, however, the GT3 is the epitome of a car that’s greater than the sum of its parts. 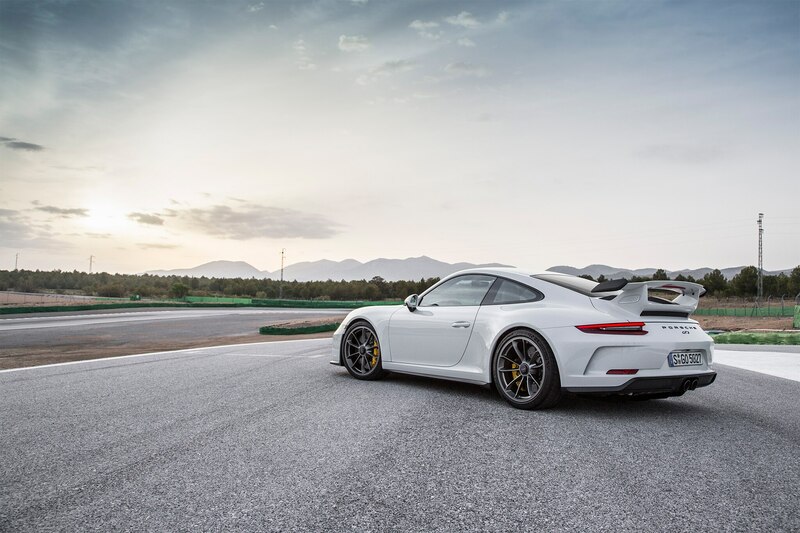 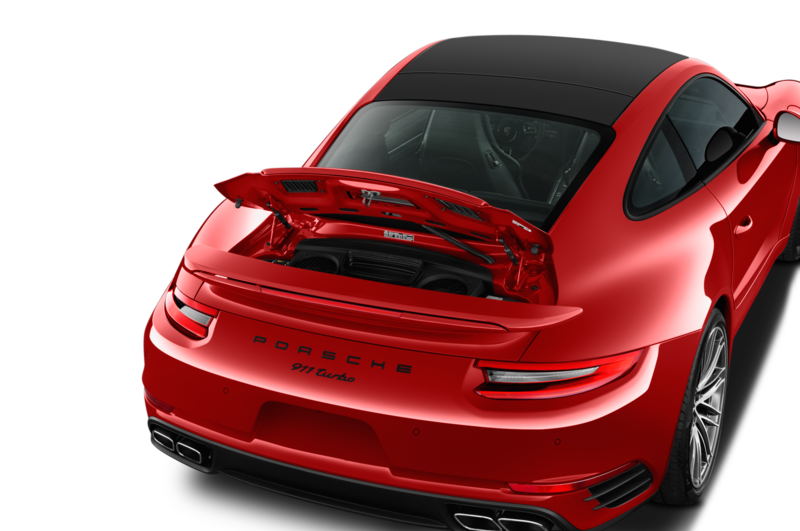 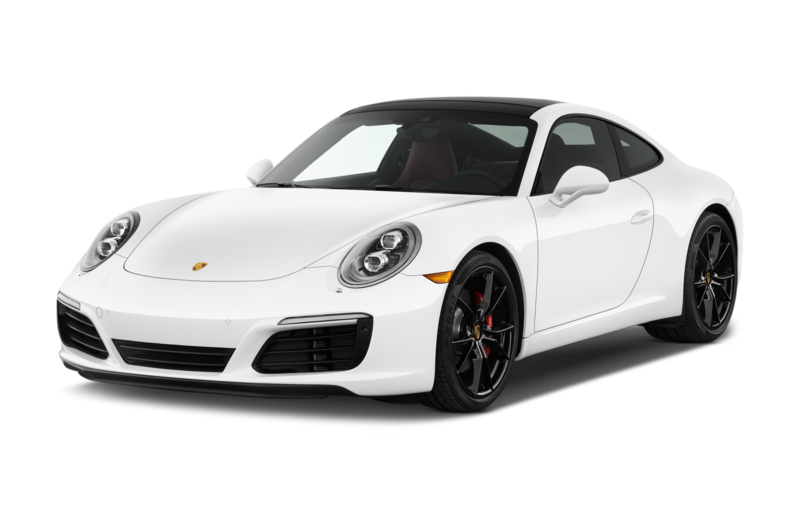 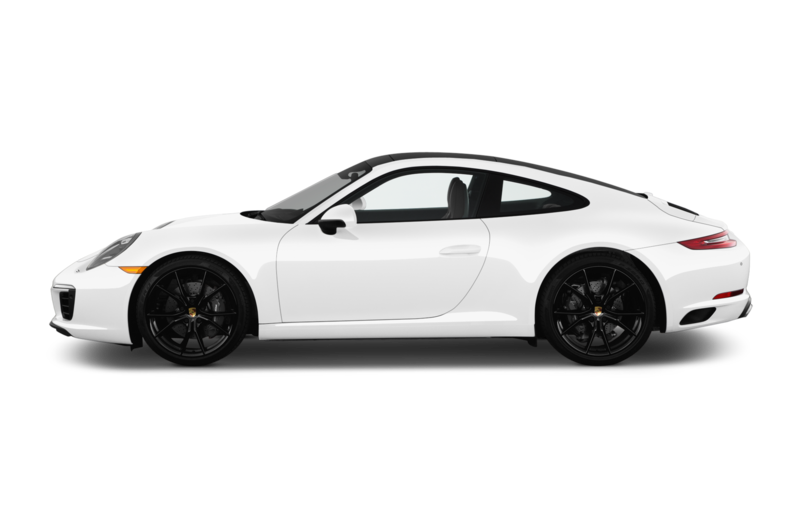 As good as each aspect of the 2018 Porsche 911 GT3 is, as much as each of the upgrades makes what was an already great car even greater, it’s the way Porsche’s GT division brought them all together in harmony that ultimately wins a driver’s heart. 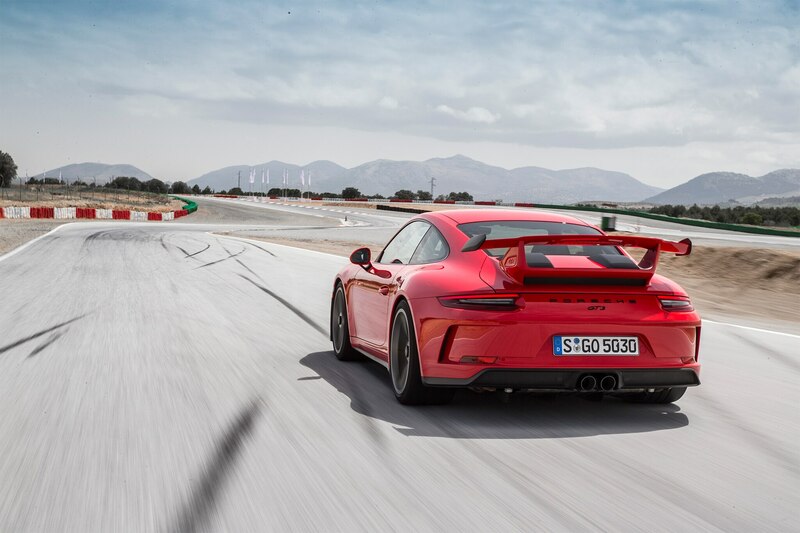 And the new GT3 does that within the first few seconds of turning the key. 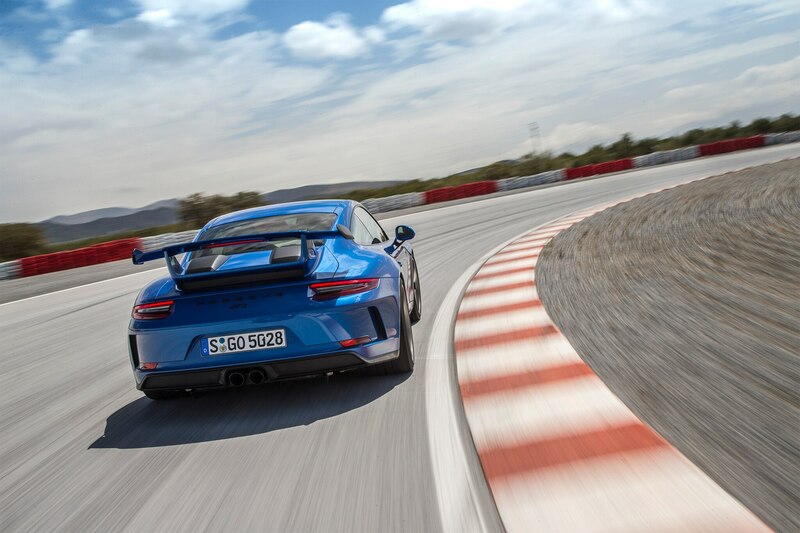 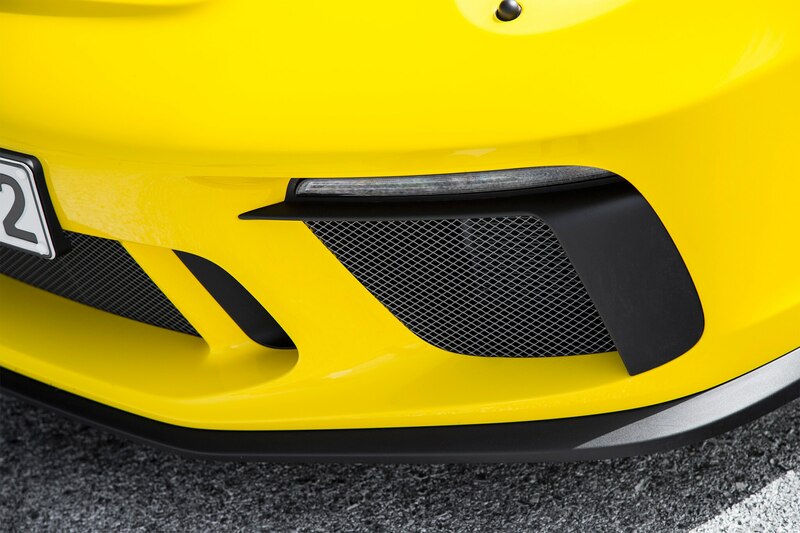 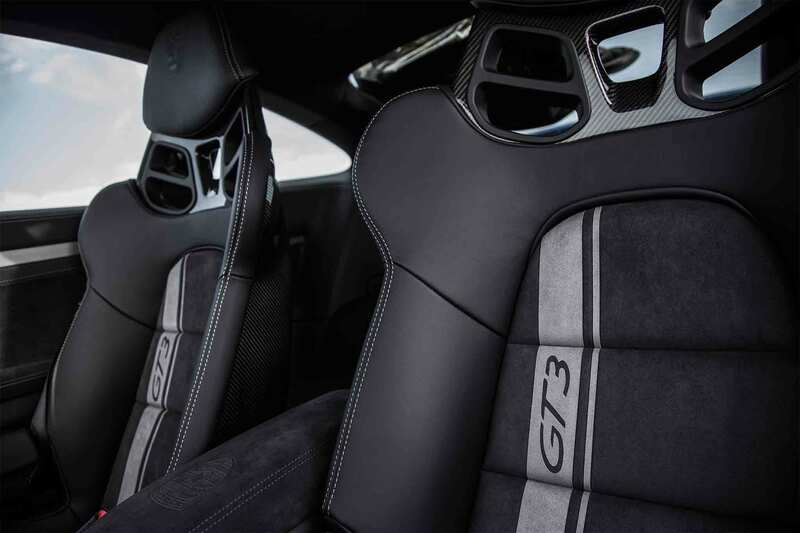 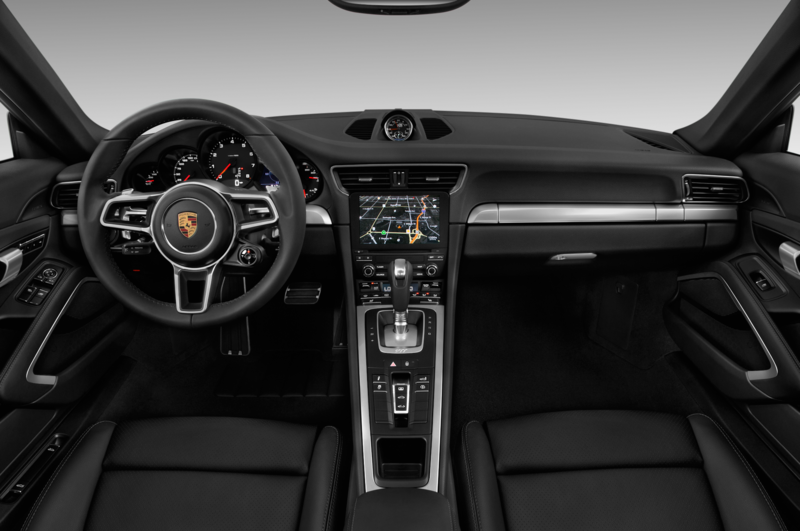 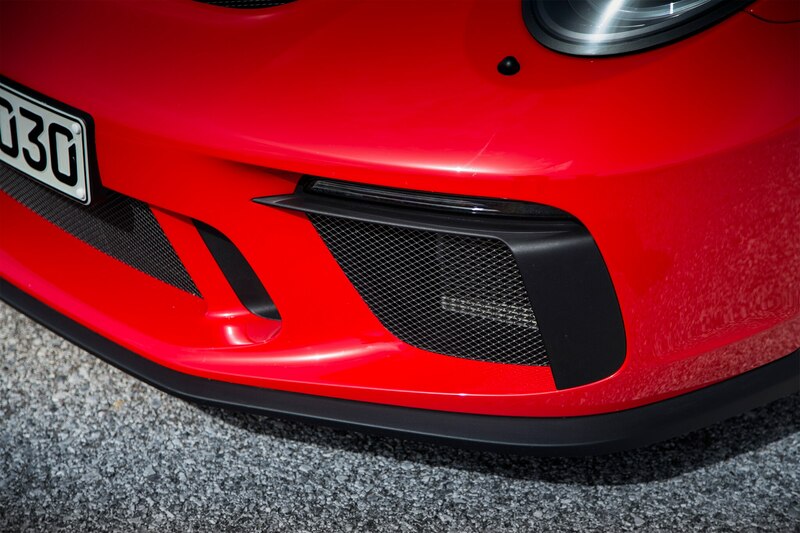 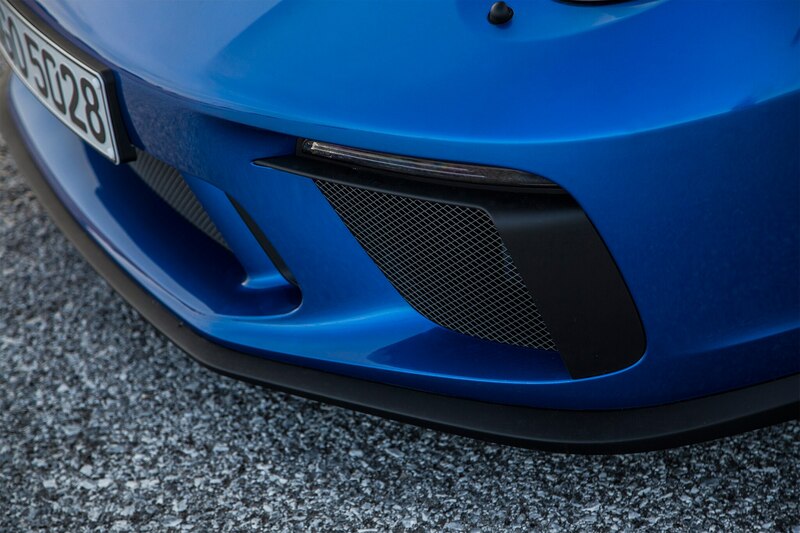 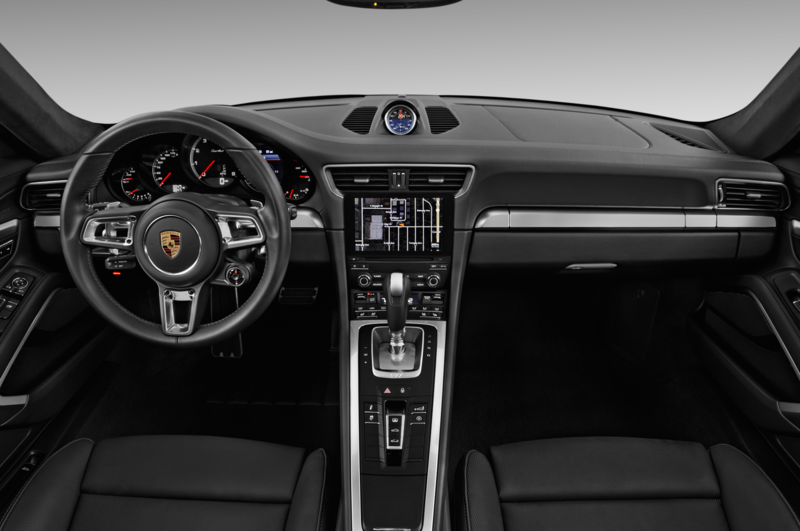 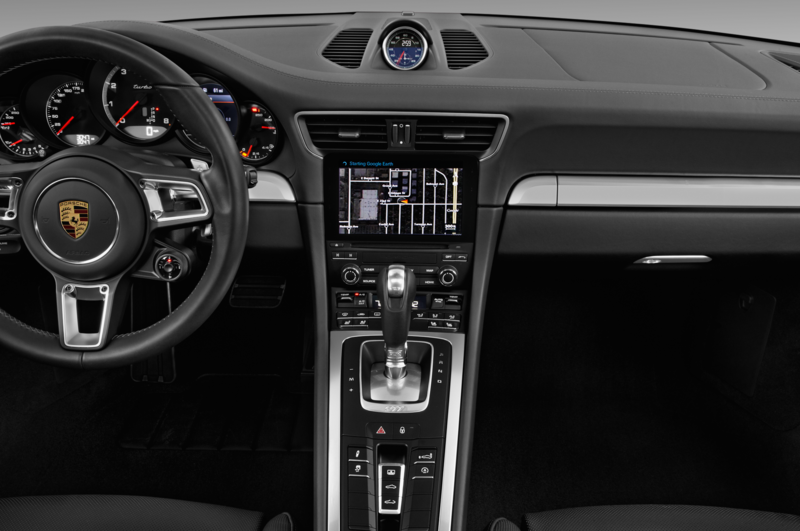 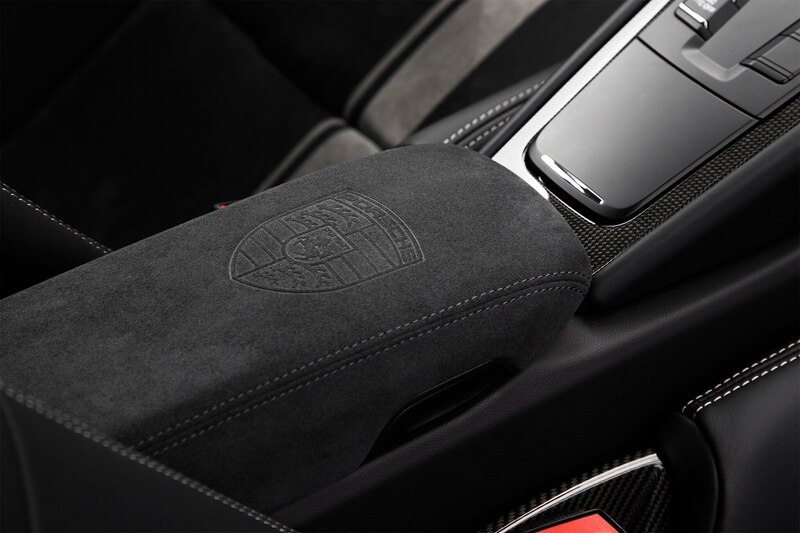 The magic of a seamless, intuitive connection between driver and car, even with so many layers of technology and engineering between, makes the GT3 a standout even among today’s ranks of world-class sports cars. 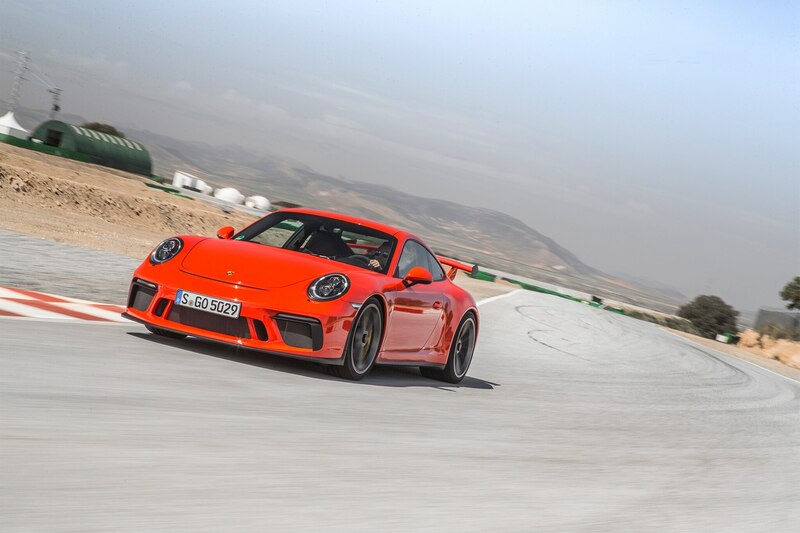 After several hundred miles and a dozen laps in the new GT3, I now know I’m a prick, and I’m totally happy about it. 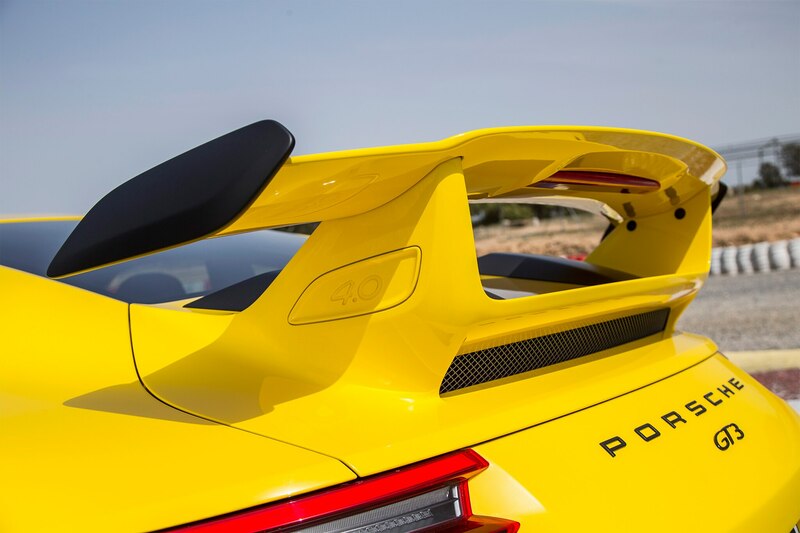 I’d say, “Sorry, Dad,” but he owns a Porsche 944 Turbo that used to belong to my sister, so I guess we’re a big family of pricks that just likes to make cheesy jokes. 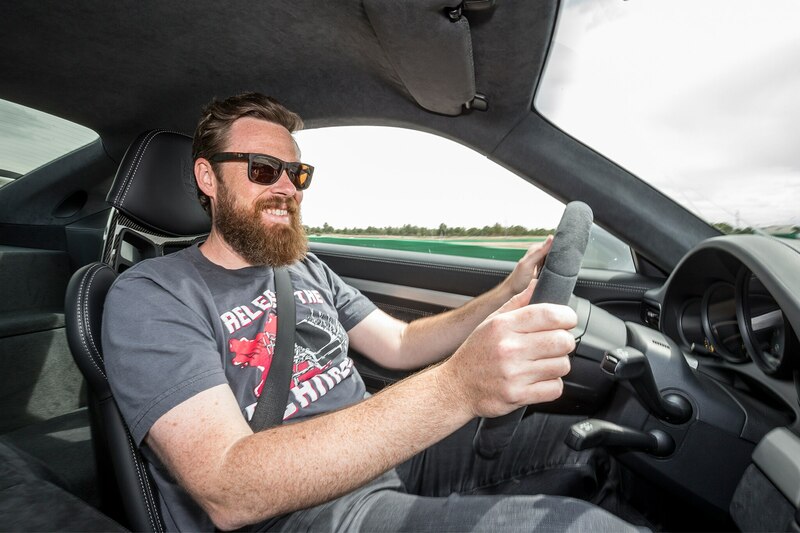 Trust me, you want to be a prick, too.